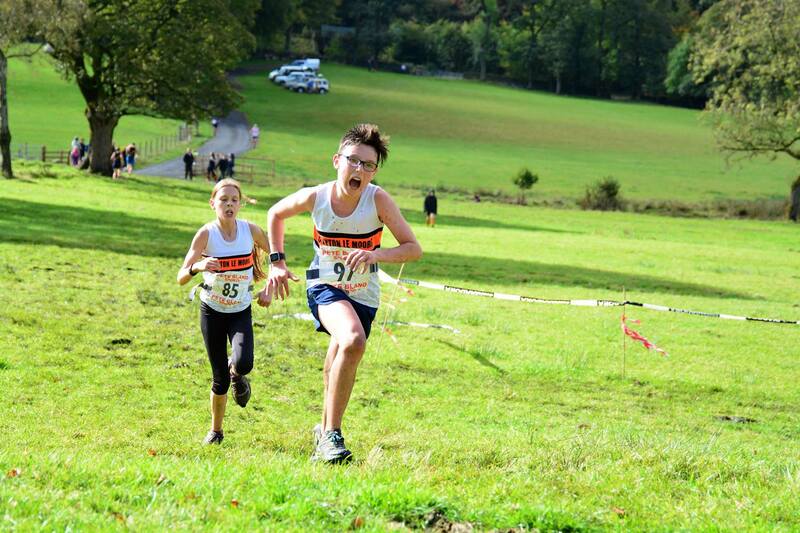 This was the cross-country final that nearly wasn’t. 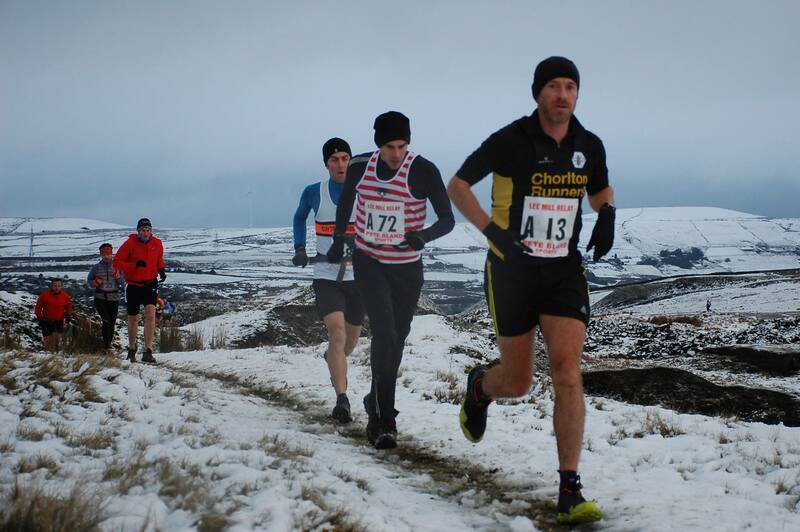 Whilst the Beast from the East did it’s best to snowdrift the country into a complete standstill, the M6 northwards and western fringes of the Lake District were strangely replete of snow, allowing the Mid Lancs XC crowd to head north for this new fixture up in Ulverston, at the Glaxo site on the very edge of Morecombe Bay. 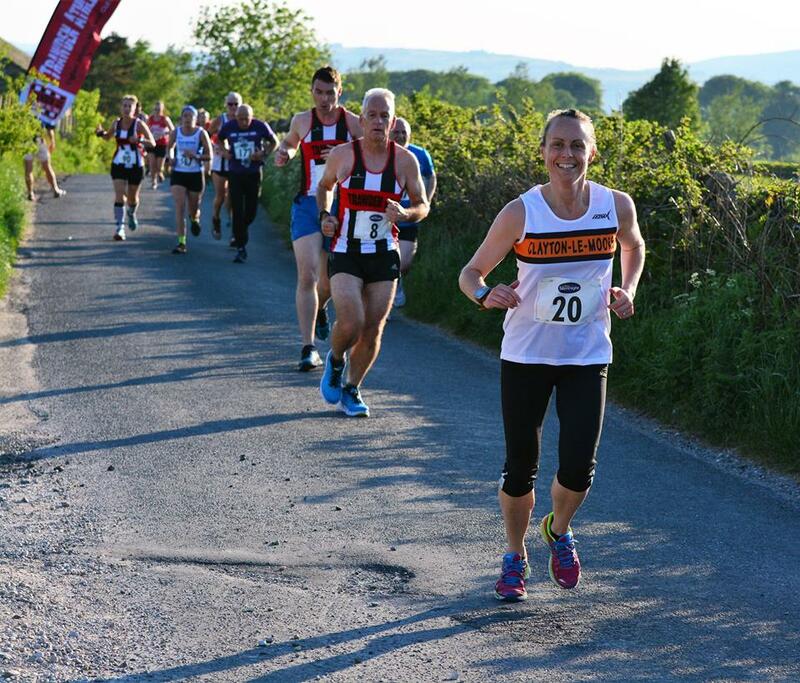 A bone hard and undulating course, with a somewhat coolish breeze coming off the Bay greeted the runners, with trail and fell shoes being the preferred option for most runners. 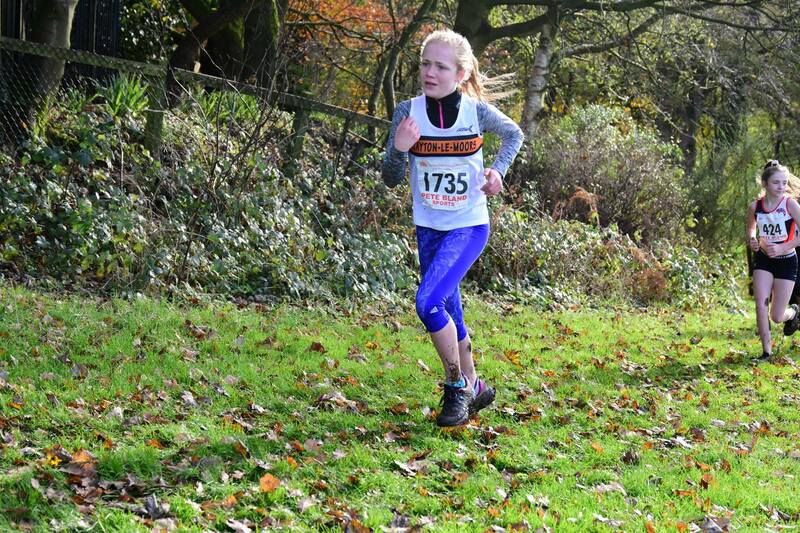 Amelia Halstead capped off a breakthrough xc season with a fine 4th place in the U11G, not far behind the winner and putting her into a series 4th overall. 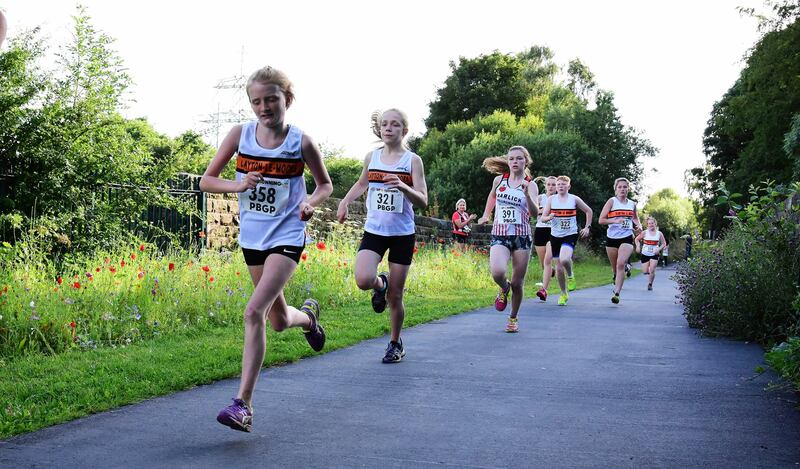 Her regular team mates Ellisia Smedley, Emily Nicholls and Joni Higgins helped the Clayton girls to 10th overall. 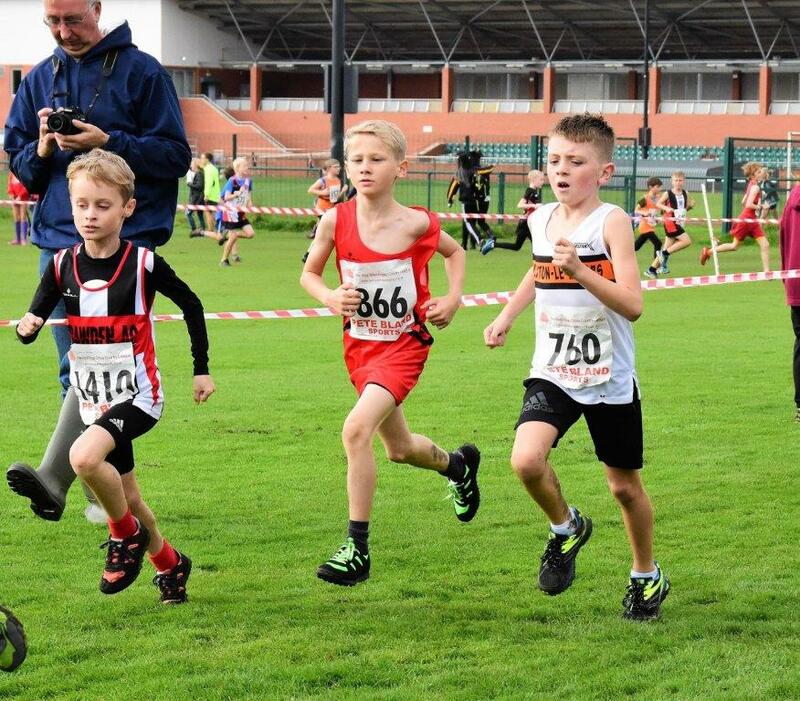 Charlie Barnes led the U11B home in 28th, and with Fraser Anforth and Josh McKay the boys took 12th palce in the team competition. 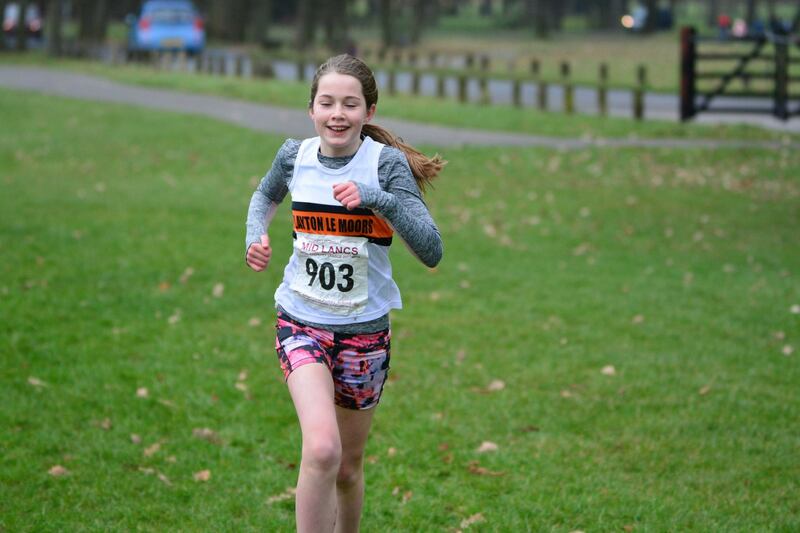 Helana White continued to blaze a trail at the front of the U13G with a fine 3rd, with Ella Dorrington in 9th and the fast improving Imogen Ferguson in 22nd. A few tense hours waiting for final results confirmed the U13G team in 3rd place overall just behind Blackburn and just ahead of Trawden, a great result for them after a full season of working hard toward that team prize. 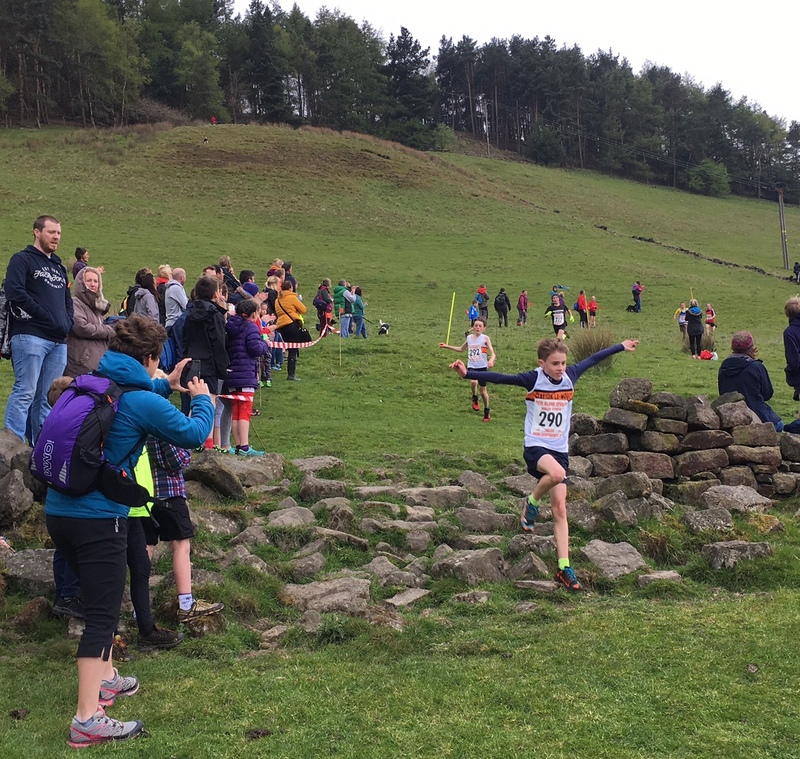 Robbie Smedley in 3rd was followed by William Nicholls 13th, and Matthew Jackson 14th and this allowed them to claim 3rd place in the U13B team prize by one point. 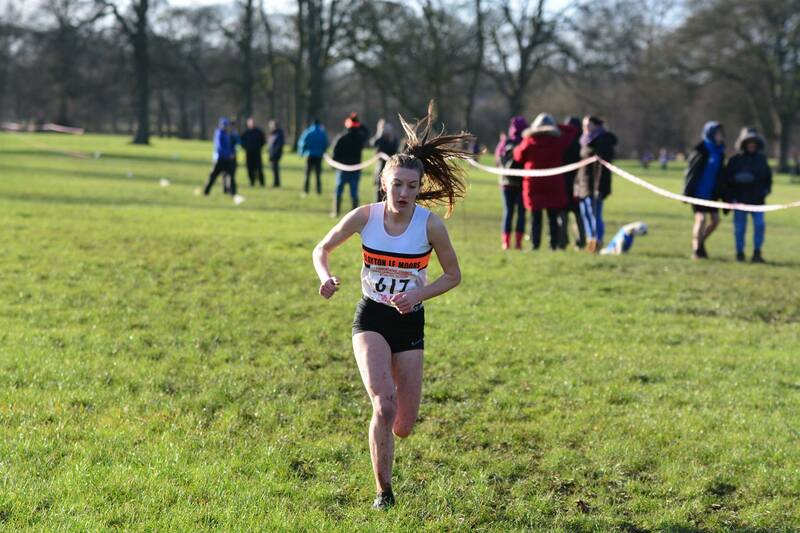 Only Sophie Ashworth ran in the U15G race to14th, with the last minute start line addition of her race number! 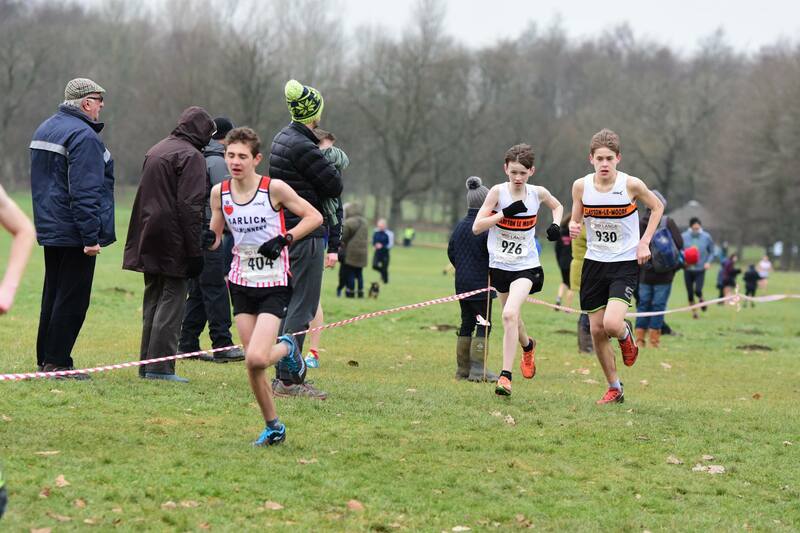 Jackson McKay went out hard in the U15B race in an attempt to stamp his authority on the front group and it nearly paid off as he came in a hard fought 4th, with Michael Stevens 10th and brother Peter 13th. 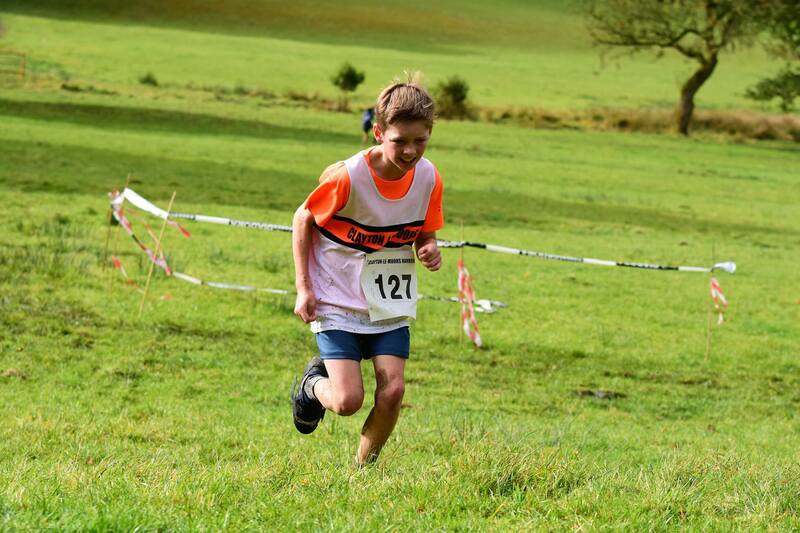 Lennon Jackson and Theo Burfield battled away for 22nd 25th. 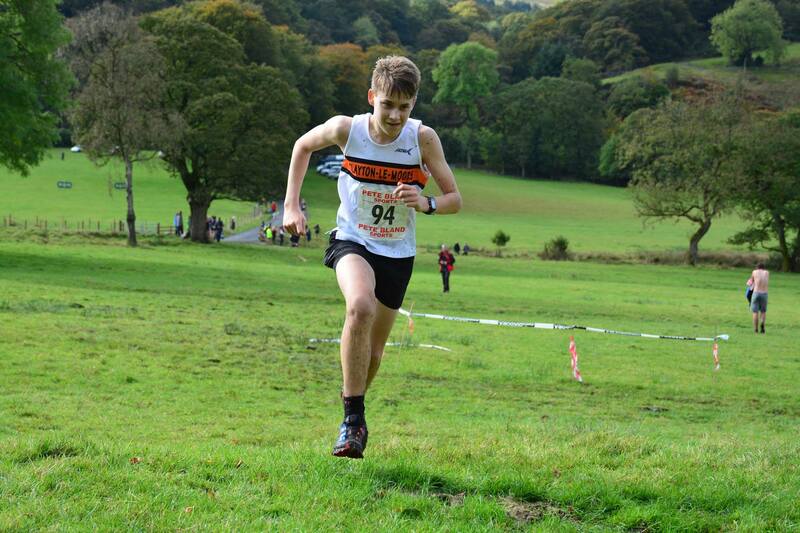 With Harrison Codd who ran in earlier races, the boys came 5th overall. 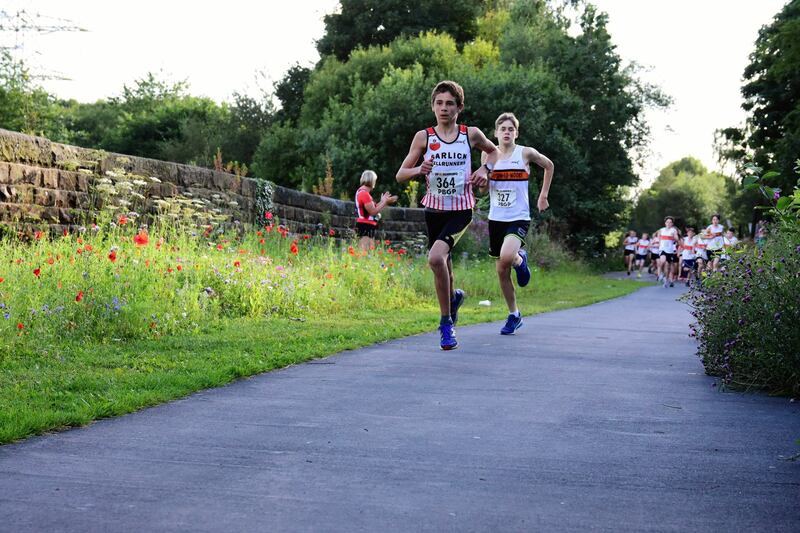 Josh Hall was our sole U17B in 7th whilst Brinoy Holt in U17G took a fine 2nd place overall in the series. 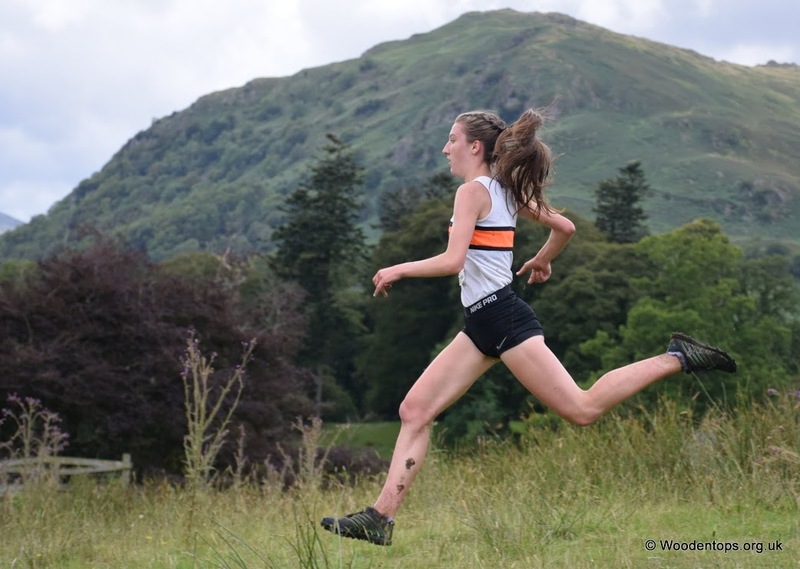 Donna Airey capped off a great season with 13th to give an overall season placing of 16th Senior Lady (8th Vet), whilst Tom Brewster took 15th to give and overall senior Men 9th place. 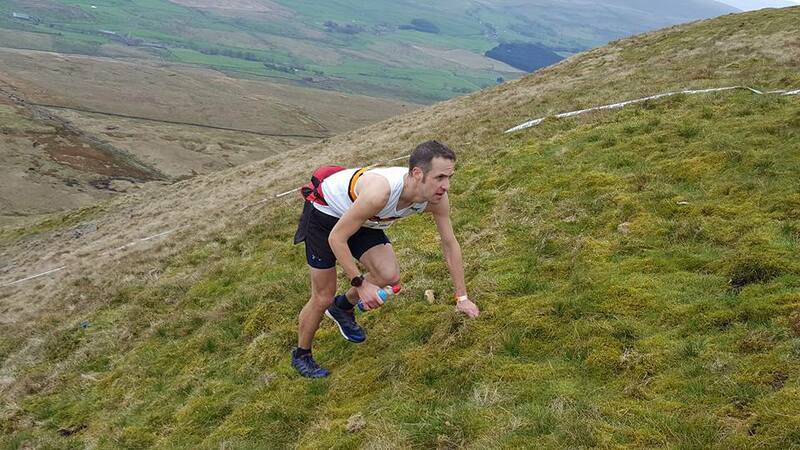 David Edmondson had a consistent season and took 2nd overall in the Vet 50 competition (7th Vet overall), Andy Holt a top ten in V40 with Calum Holmes 6th in U20 Men. 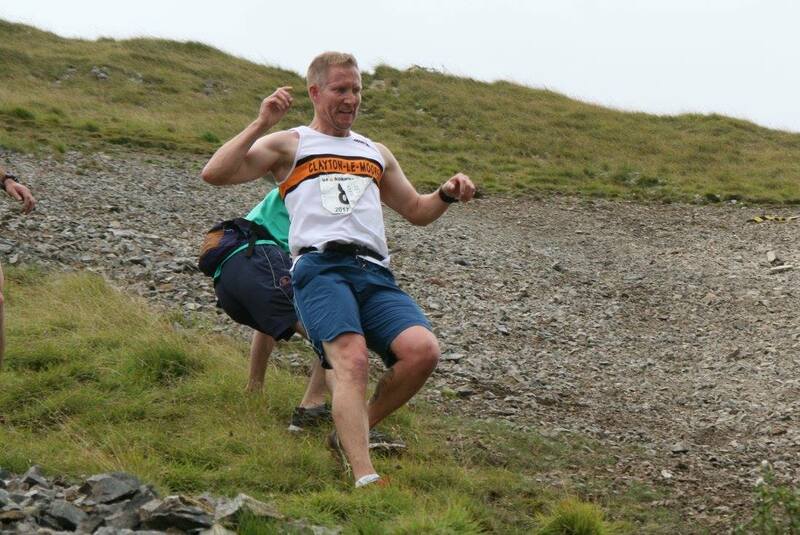 Dave Scott was first in the V70 Men. 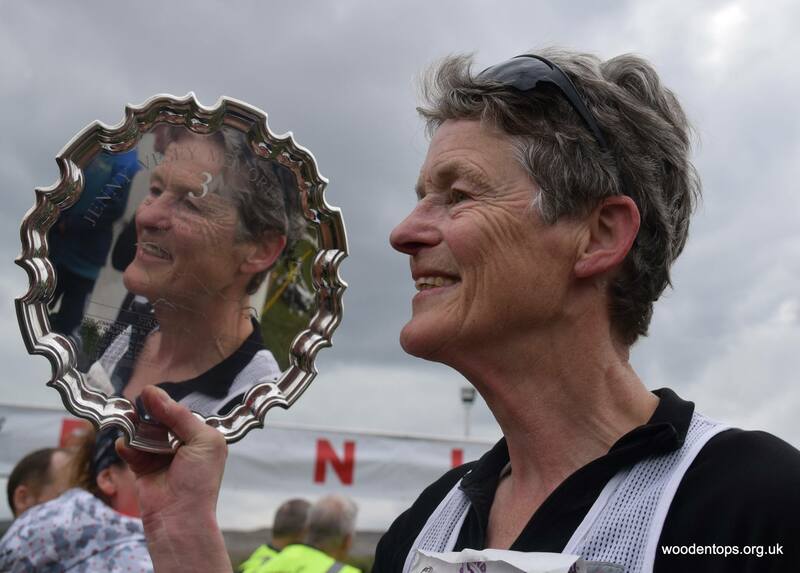 Gold Team Prizes (and promotion to Division 1) were awarded for the season to the Division 2 Ladies and V65 Ladies teams, with Silver for our Division 1 Senior Men, and Bronze for the V55 Ladies and V40 Men. 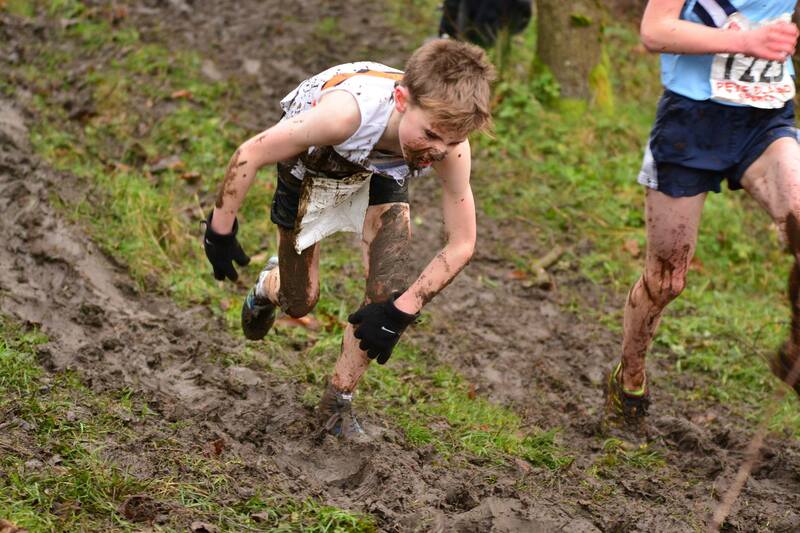 There’s mud, and then there is MUD. 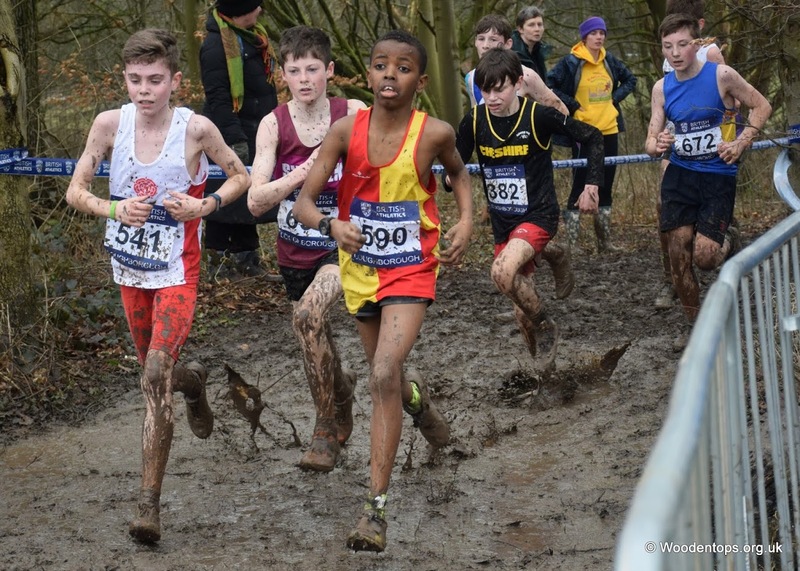 The 5 Clayton Juniors selected to run for Lancashire had probably never run in worse conditions underfoot and probably never want to again. 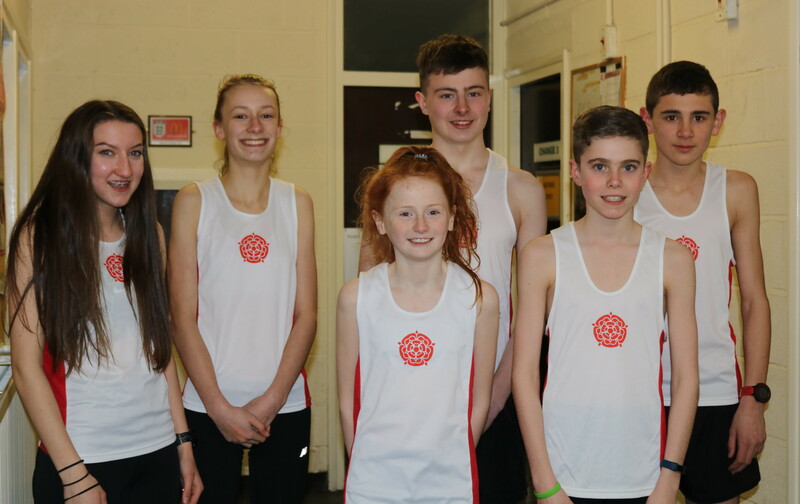 However, it didn’t deter Helana White, Ella Dorrington, Robbie Smedley, Briony Holt and Josh Hall from donning their shiny white and red Lancashire vests and getting stuck in. All of them did their Club and County proud and we expect to see more of them, and their teammates in Lancashire colours. Robbie Smedley. And some mud. 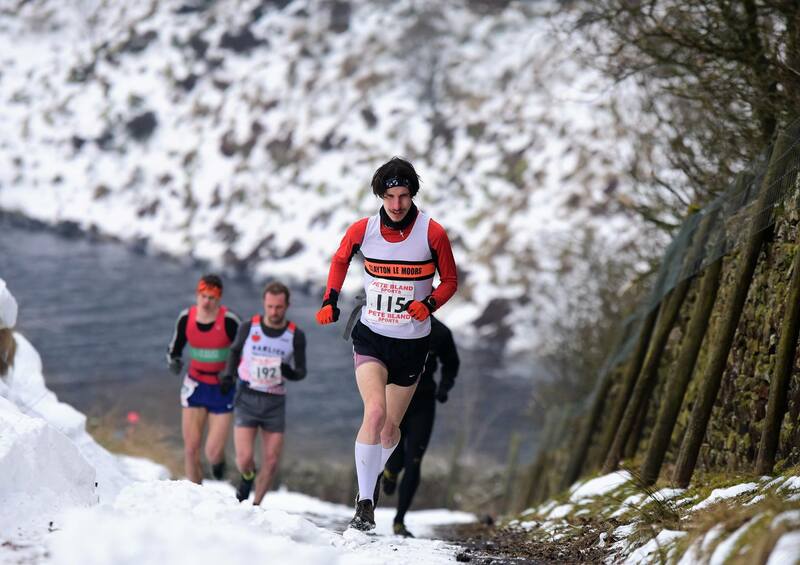 As if one wasn’t enough… Beast from the East 2 arrived in time to threaten loads of fell races this particular and the Stan Bradshaw Round on our beloved Pendle Hill was no exception. 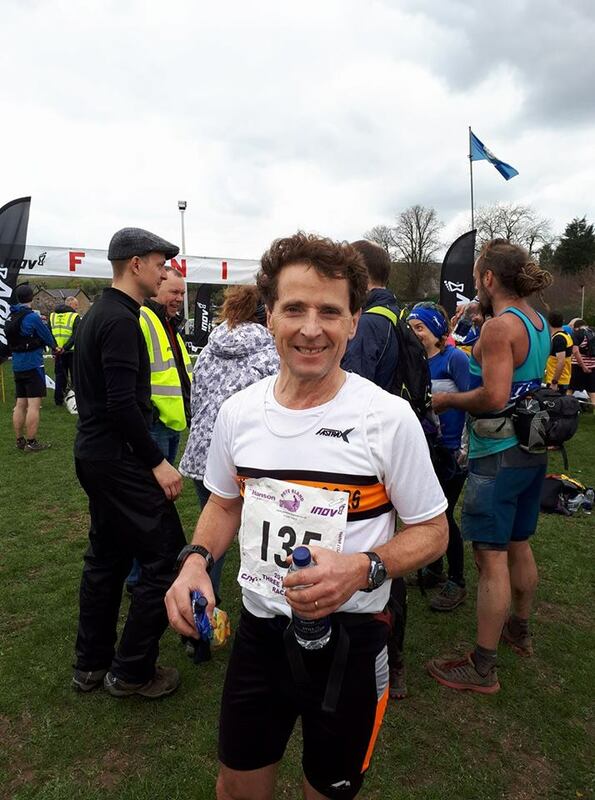 However, a judicious course alteration from organiser Colin Woolford and some heroic marshalling meant the race avoided the cancellation that befell many other races in the region. 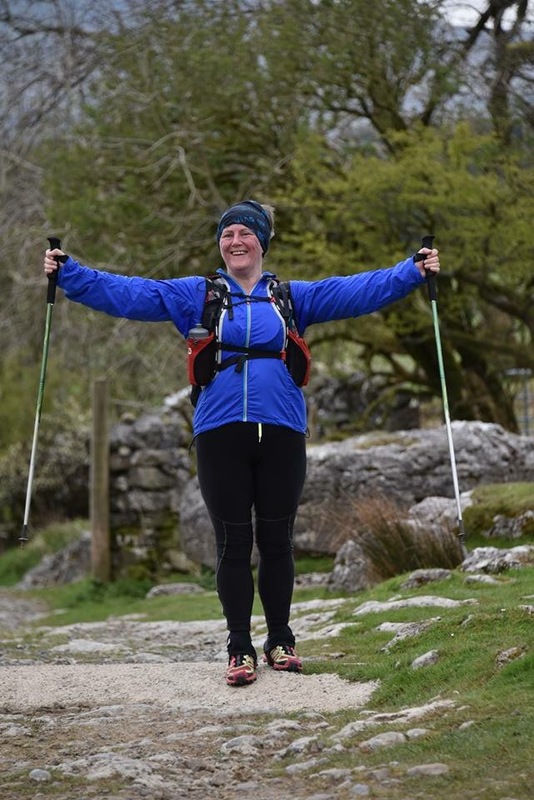 The now shortened course followed the normal start route to CP1, CP2 then left along the next wall to Ogden Clough, down to upper Ogden Dam and what was CP5, then up to Fell Wood to an amended CP6 giving roughly 12k in all. And a thoroughly testing day out with cold winds, frozen turf in places and deep drifts to wade through in others. 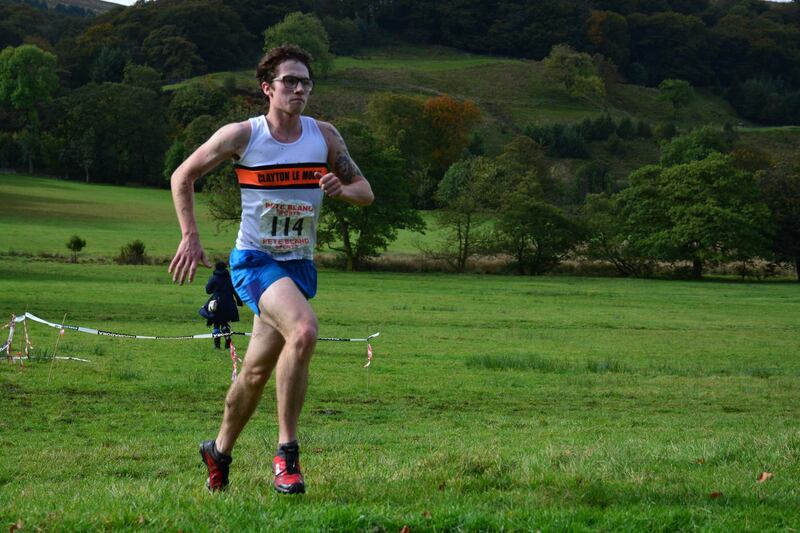 There were 21 Clayton runners led home by Chris Holdsworth in 3rd overall. 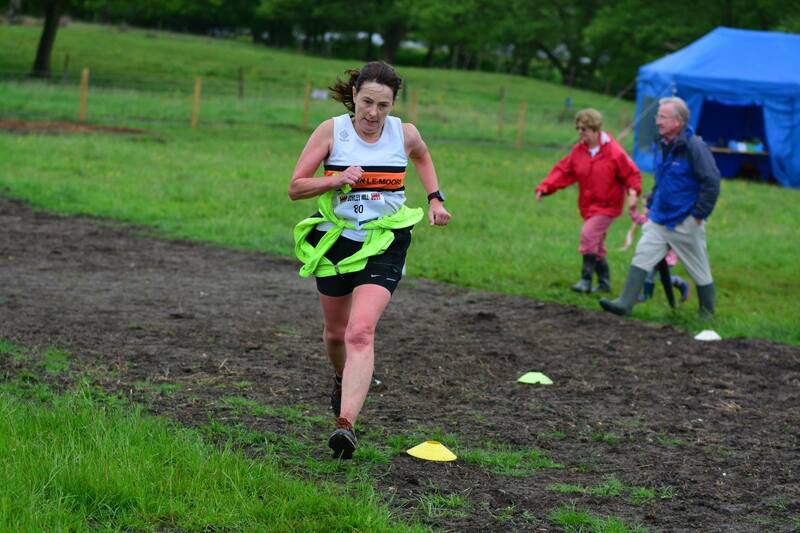 Tara Robb was 1st Clayton Lady home (5th Lady overall). 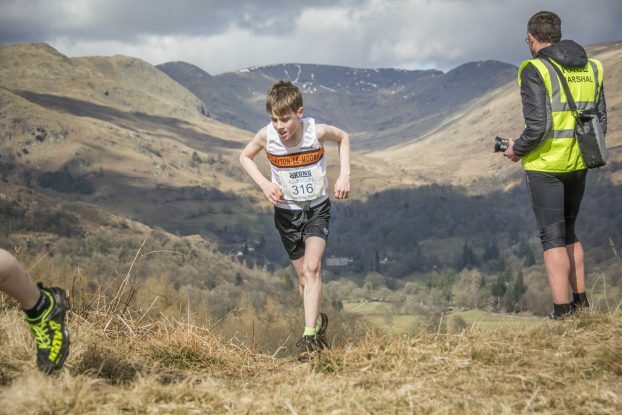 It was the usual late March start for the FRA English Junior Championships series, and like 2 years ago, Todd Crag in Ambleside was the setting for the first race of the season. 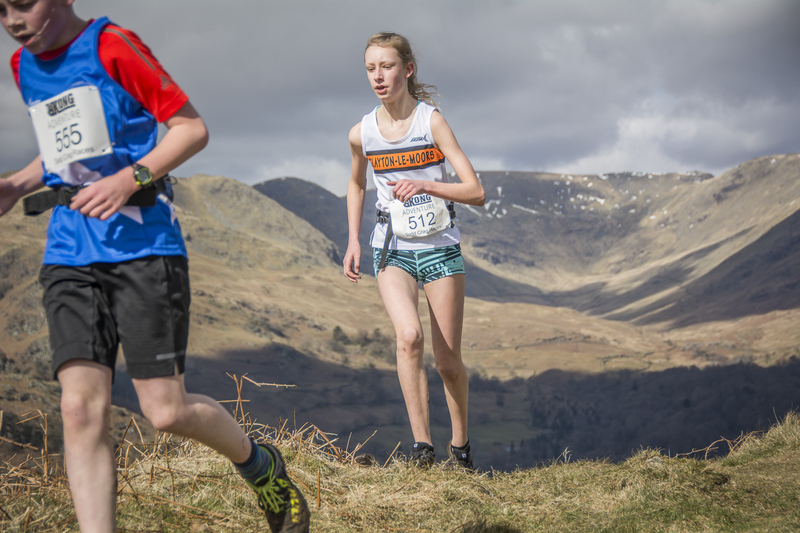 The snow had gone, the sun shone and the racing was fast but technical on a rough and steep Lakeland course. 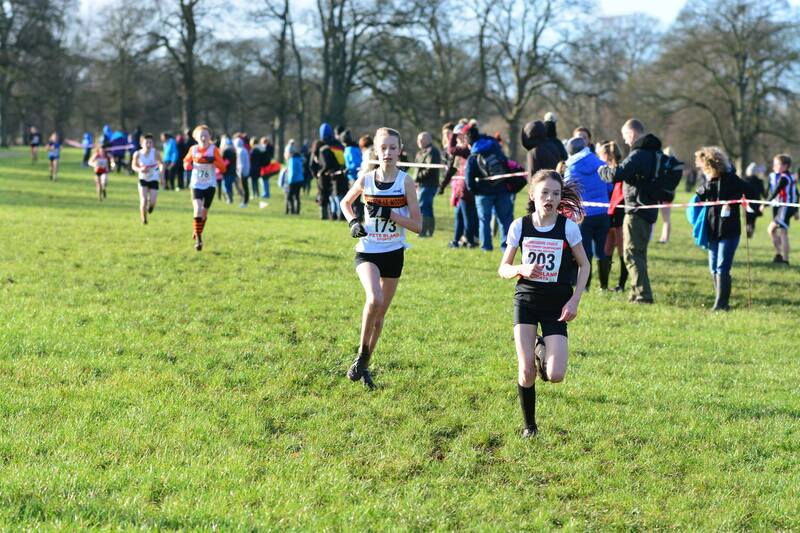 Jenson Bentham was 12th in the U13B with Helana White chasing hard for 3rd place in the U13G. 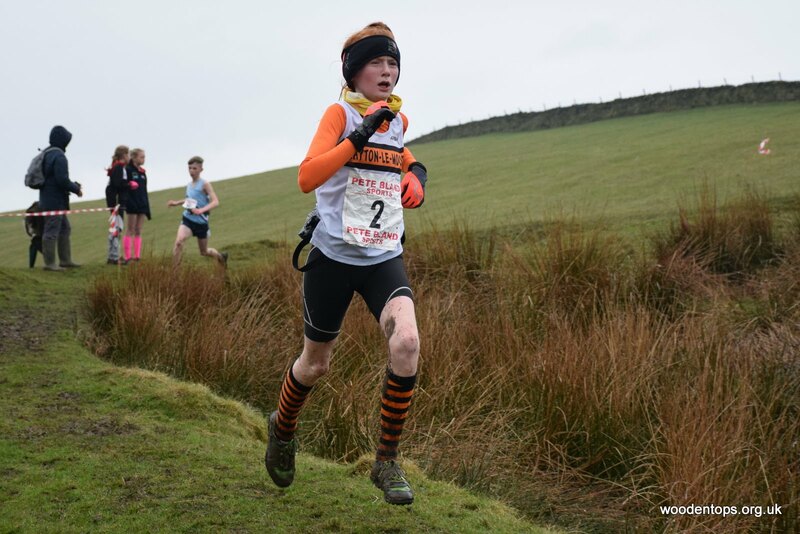 Jackson McKay took 5th and Ella Dorrington 16th in the U15B and G races, whilst Peter Stevens got the better, just ahead of brother Michael in the U17B race, taking 22nd and 23rd respectively. 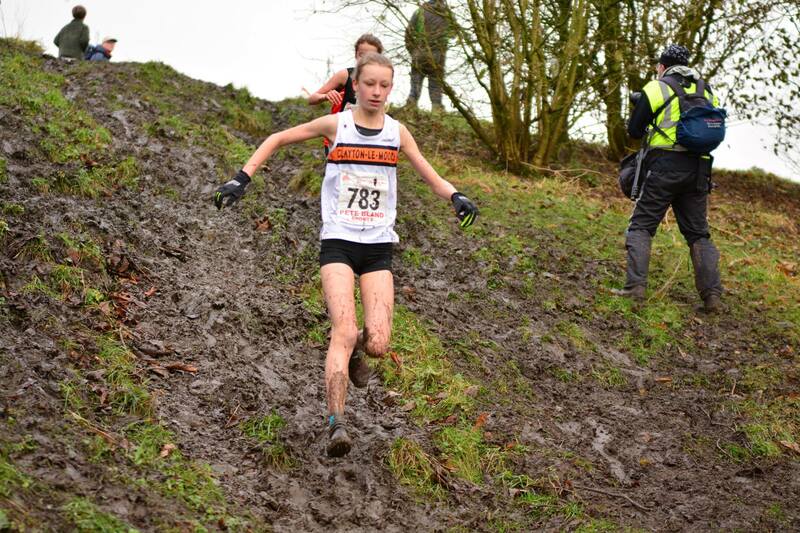 Briony Holt was 5th U17G. 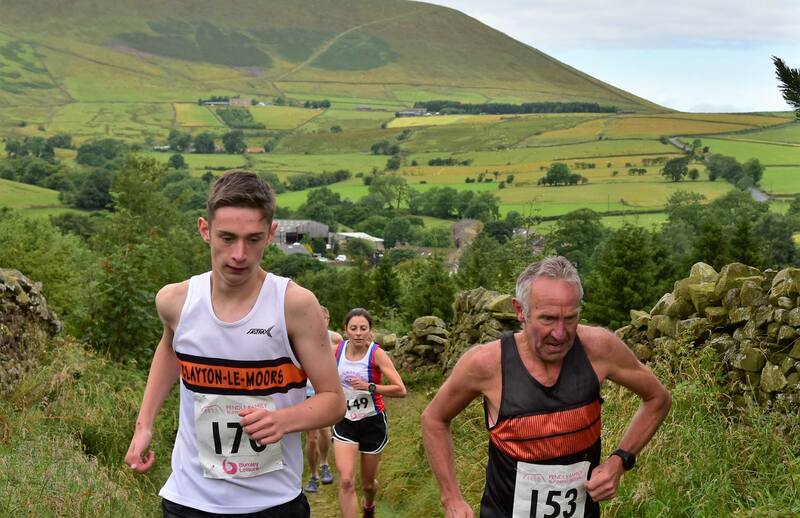 Wet and claggy weather was booked for Pendle again this year, to celebrate the incorporation of the Lancashire Fell Running Championships into this long-running club fixture. Two new organisers also took over this year, Mark Nutter (Senior race) and Alan Dorrington (Junior races). 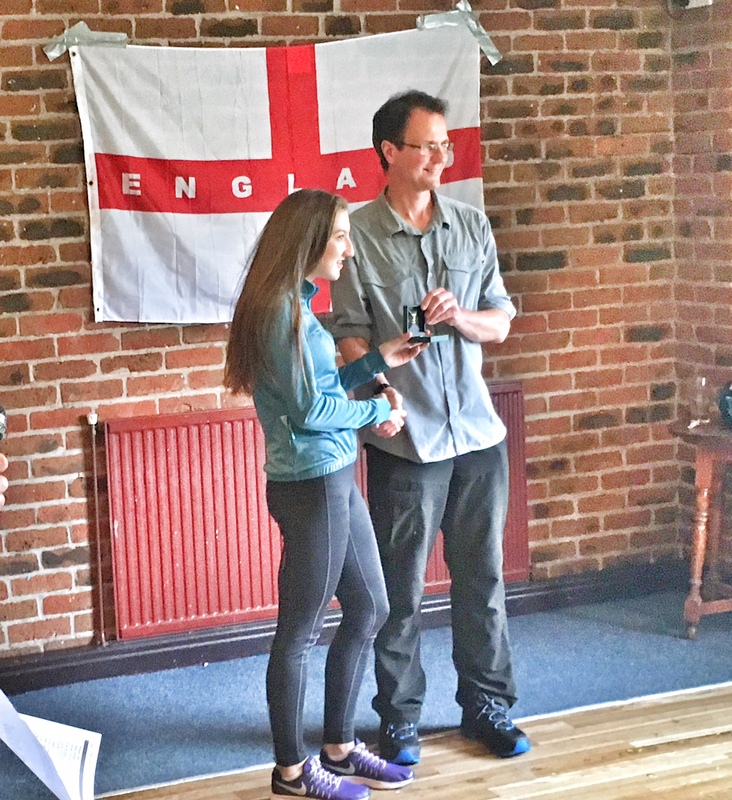 In the Juniors there were Lancashire medals for Jackson McKay who was Lancashire Champion in U15B, Helana White with silver in the U13G and Ella Dorrington with silver in the U15G. 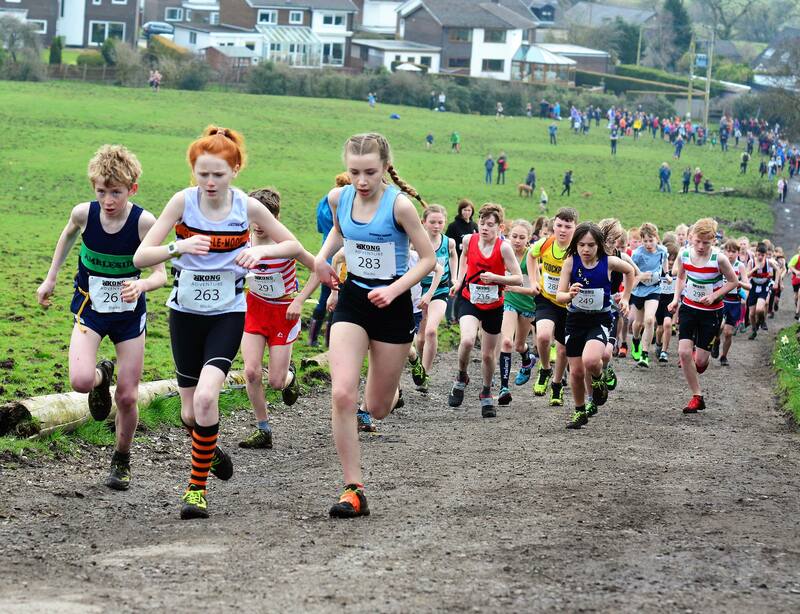 Many of our other Juniors also took part in the races, with several top ten performances from the likes of Jenson Bentham (7th) and Matthew Jackson (8th) in U13B, Robbie Smedley (6th) and William Nicholls (7th) in U15B and Imogen Ferguson 7th in U15G. 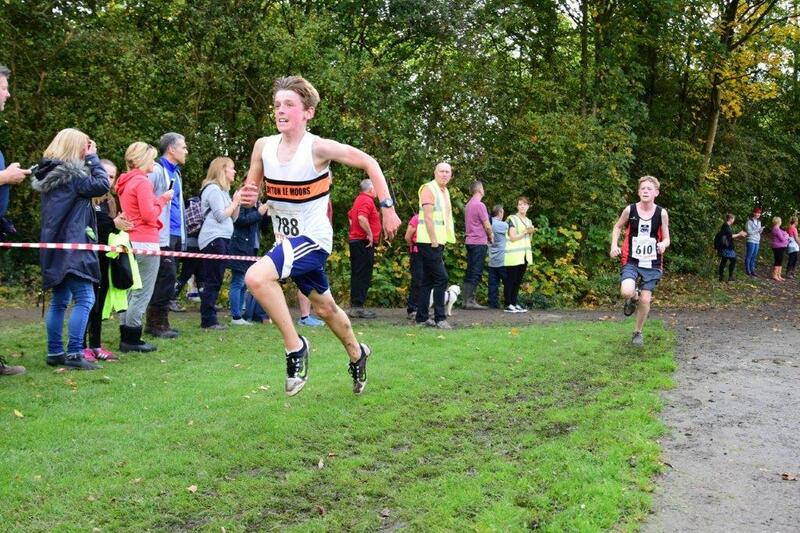 Peter Stevens also impressed in the U17B, narrowly missing out on a medal in 4th, with Josh Hall in 6th. 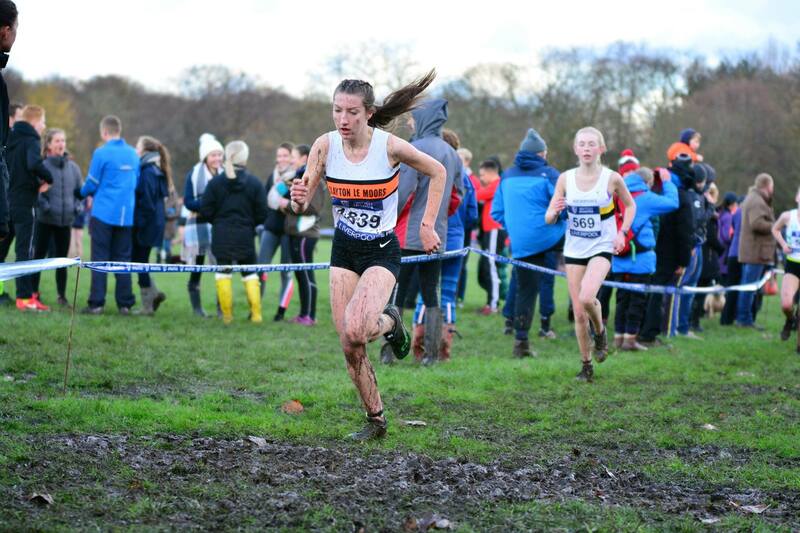 Sophie Ashworth was 5th in U17G with a very muddy and shoeless Millie Stubbs in 7th and Beth Wheatcroft returning from injury in 8th. 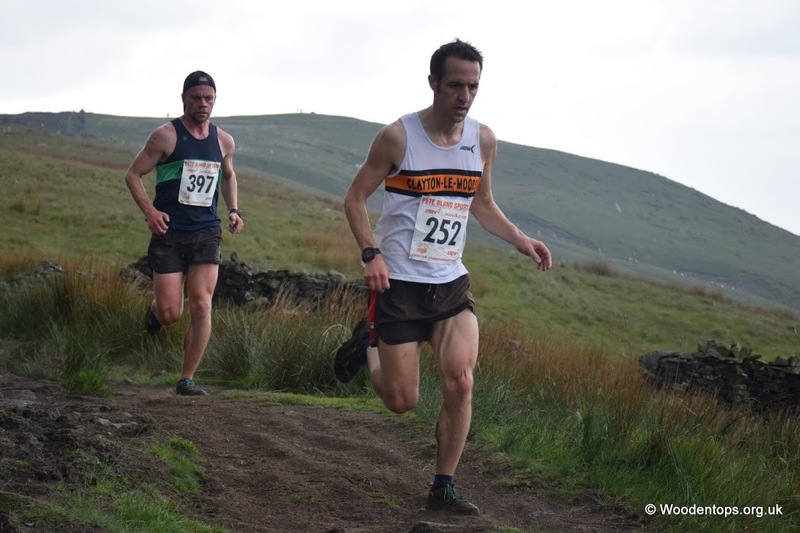 In the Under 19 Men’s race, held as part of the Senior race won by evergreen V40 Rob Hope, Nick Hennessey had a fantastic run to become Lancashire Champion. 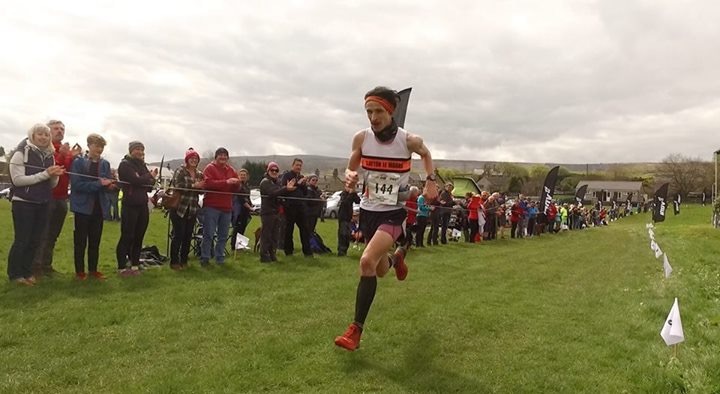 There were top ten places in the Senior Men’s race for Matt Perry and Andy Laycock (9th and 10th) and a fine 6th place overall and 2nd U23 Lady for Rhiannon Whickam. 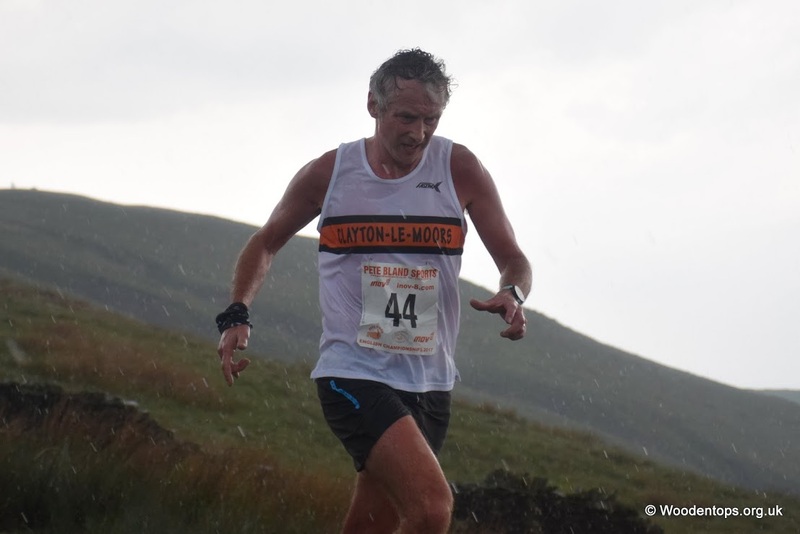 Peter Coates took a bronze Lancashire medal in the V40s, and Geoff Gough a silver medal in the V60 Men. 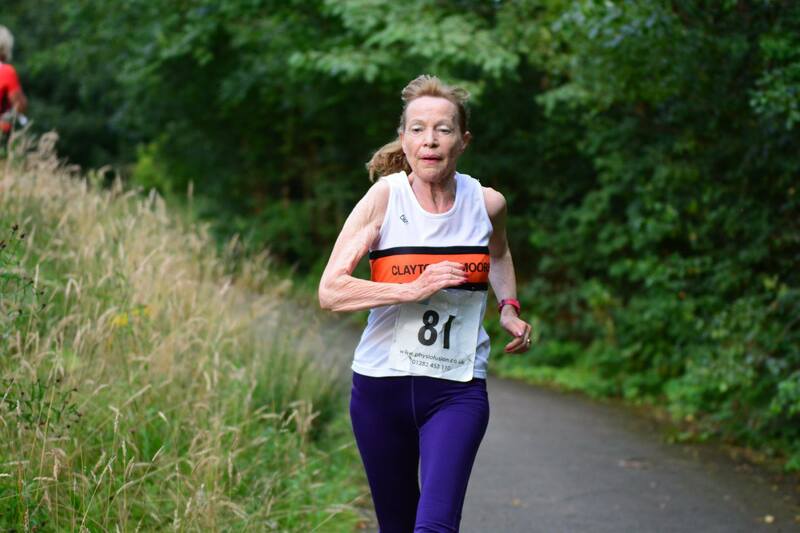 Irene Roche was a silver medallist in the Ladies V50, Karin Goss Lancashire V60 Champ and Linda Lord Lancashire V70 Champ. 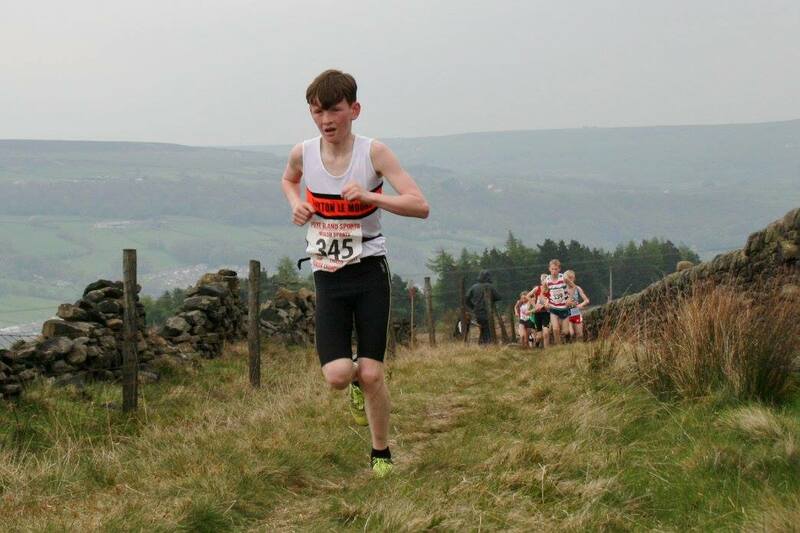 There was a new (to FRA Junior Champs) venue for the 2nd round of the FRA English Junior Championships with Trawden AC taking the race to Blacko and the hills surrounding the iconic Tower. 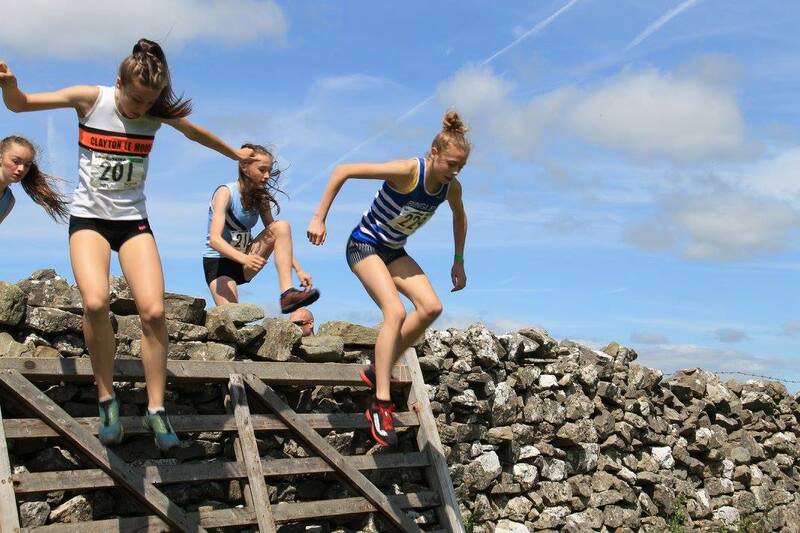 The sun shone, the barbecue was pretty tasty and there was some great racing over traditional grassy Pennine hills (and bogs). 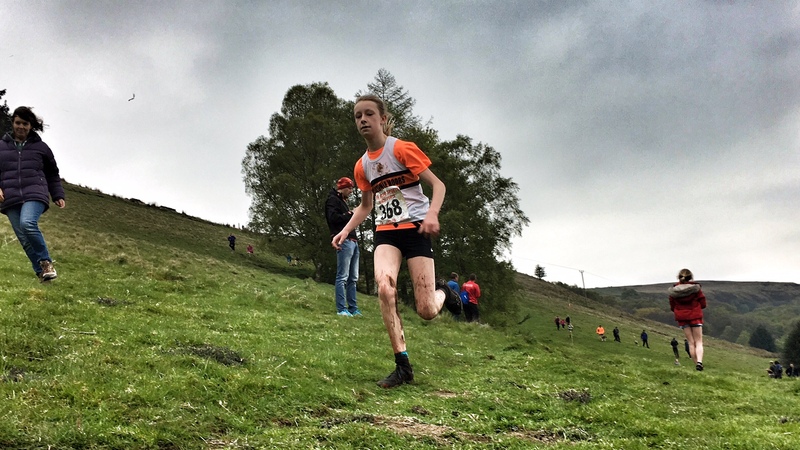 Helana White bagged her first ever win in the Junior FRA series with a powerful performance to see off her closest rival, based upon disappearing up the hill at a vast rate of knots to put in some distance between them. 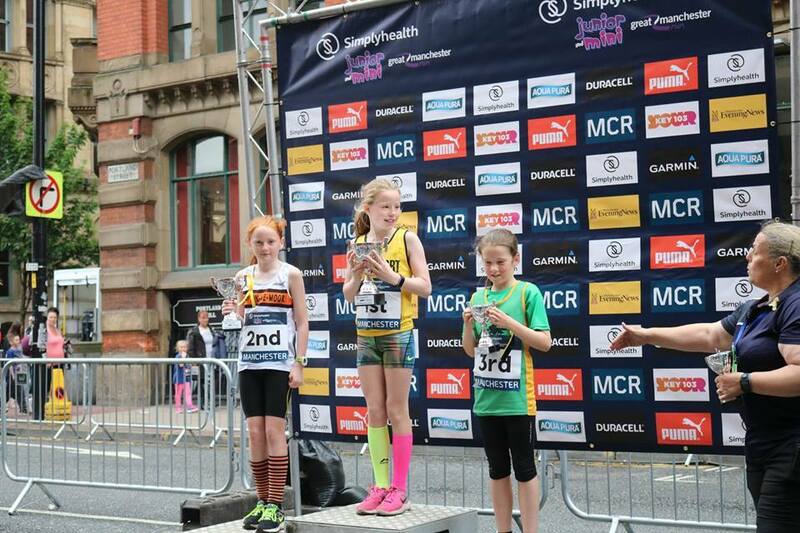 Her strategy paid off and she was a clear winner in the U13G race (and 8th overall), a fantastic achievement at this level. 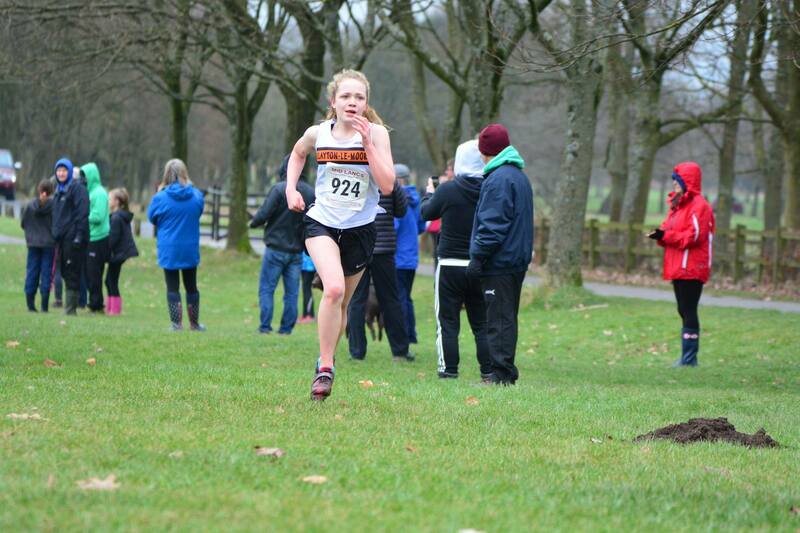 Ella Dorrington improved on her last FRA outing with 8th in the U15G and Briony Holt had a solid run for 6th in U17G. 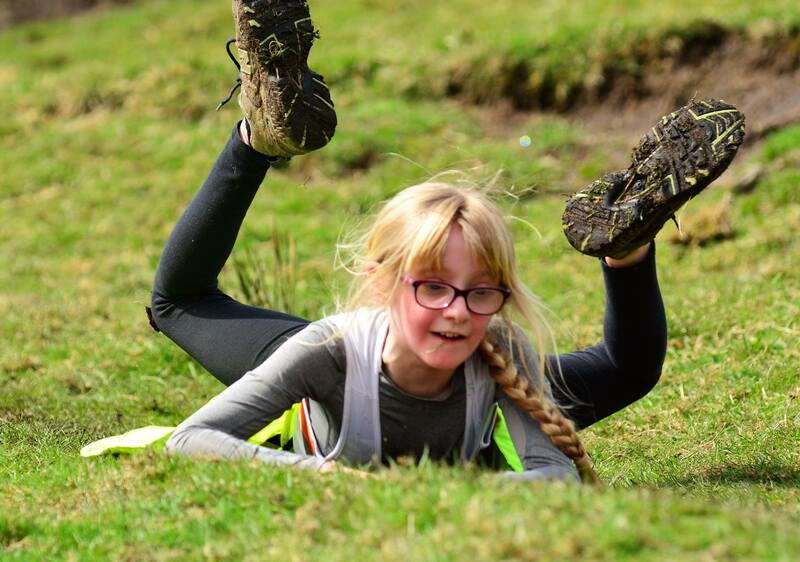 Emily Nicholls celebrates her Birthday in style in the U11 race. All was well afterwards. Photo: David Belshaw. 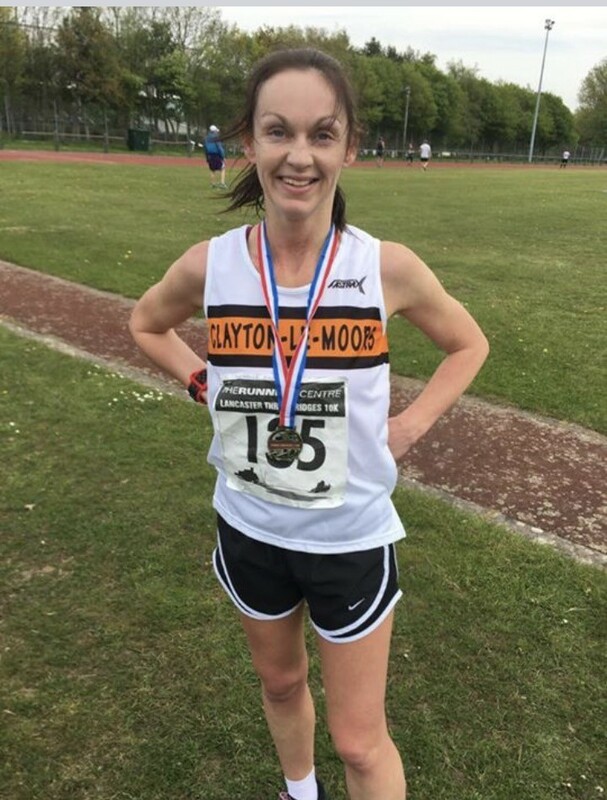 Clayton Ladies Claire Vincent and Michelle Abbott were age group winners in the Senior Ladies and W35 Ladies categories respectively at this popular local 10k, whilst Calum Holmes took the U23 Mens win and 6th overall. Calum Holmes sets off quick with Nick Hennessey. 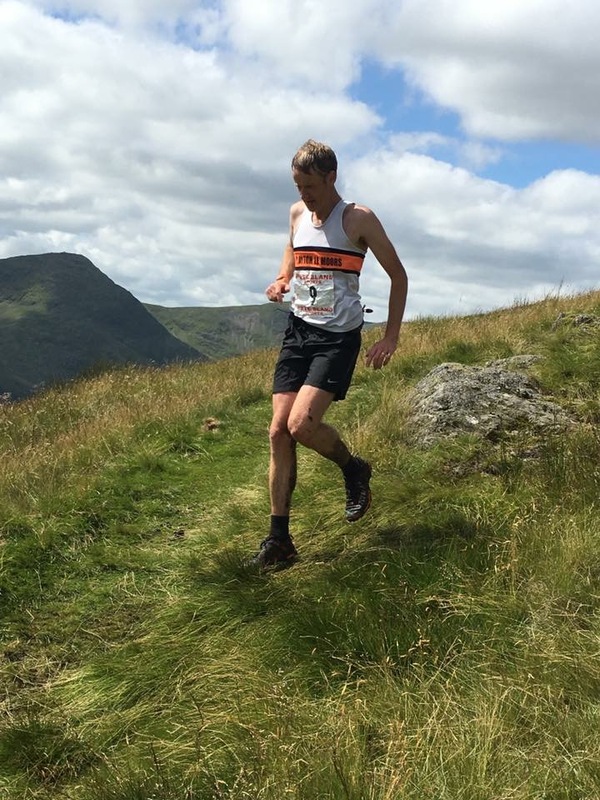 Is it a fell race, a trail race or a marathon with mountains? That all depends on your perspective but what it clear is that it is a classic, and a hard one to pace, to boot. David Bagot led home the usual large Clayton contingent in 3 hours 27 mins. 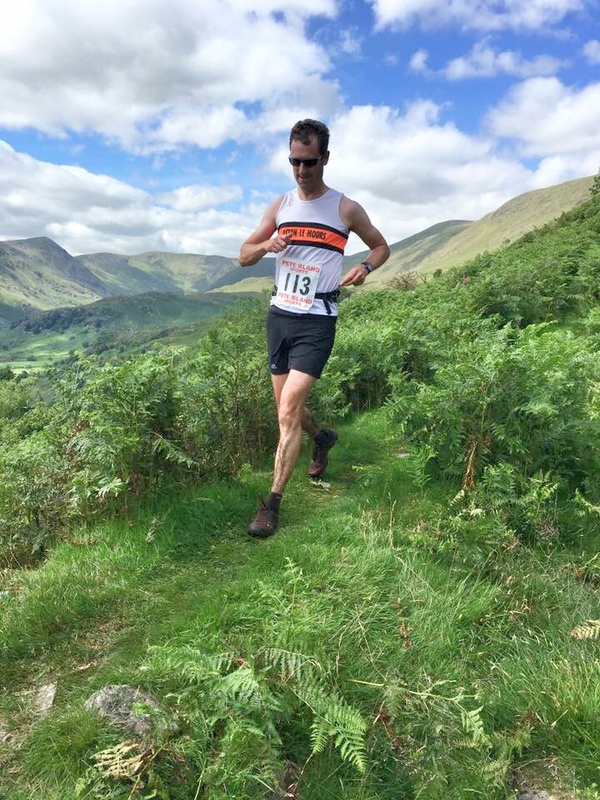 “I had never done this race before and was a bit nervous as I had struggled on the recce a few weeks ago on the back 2 peaks but I had had lots of good advice off people before race day. I got there in plenty of time and caught up with several other Clayton runners before we lined up in our expected time orders. 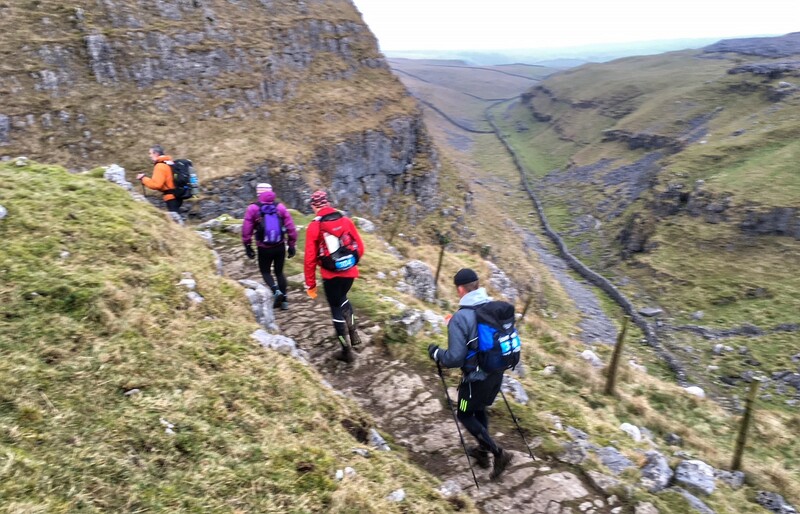 I had a stroke of luck and set off with Simon Stansfield who had given me advice about pacing and leaving a little for descent off Ingleborough. 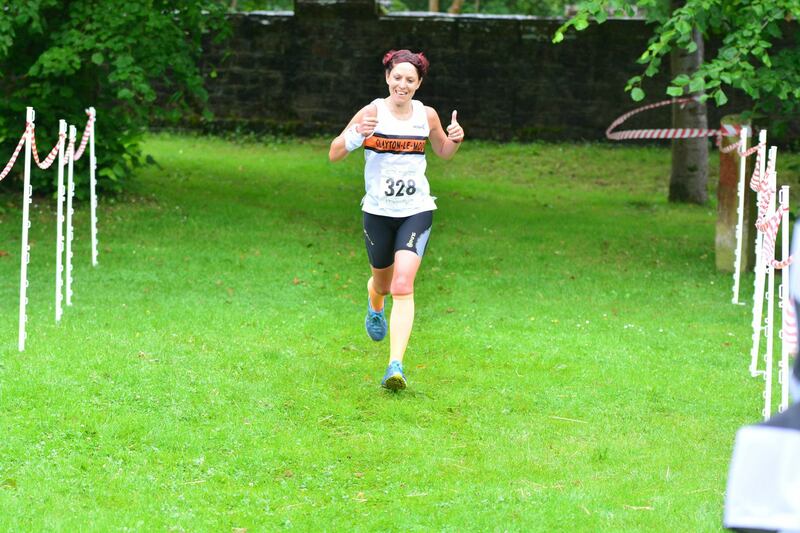 I had set myself 2 race goals – avoid the bus and walk the hills and run everything else so I made cutofffs. 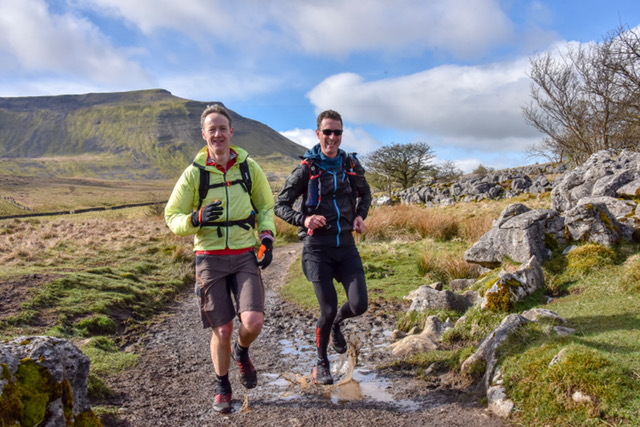 It was pleasant trotting on with Simon to the base of Pen y Ghent and Ii think I paced it ok – Igot up in just under 48 minutes. 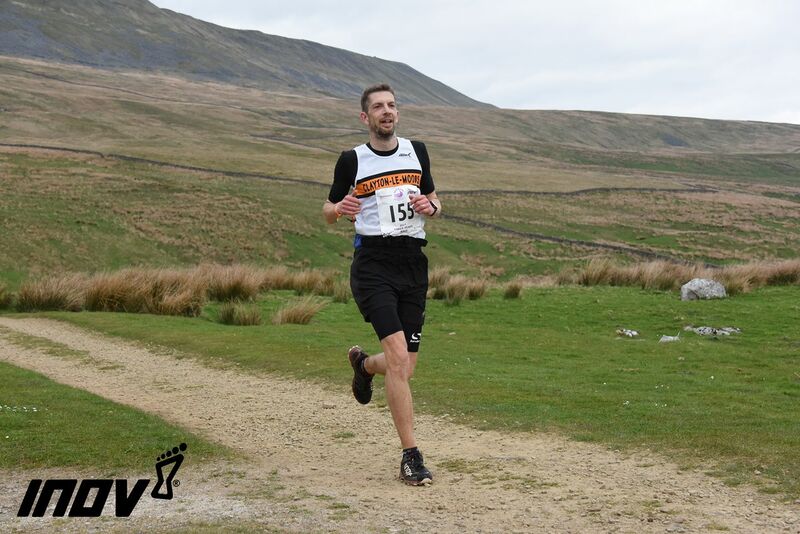 The descent off was nice and there was a temptation to tear off on the good running to Ribblehead but I managed to contain myself and kept a consistent pace. 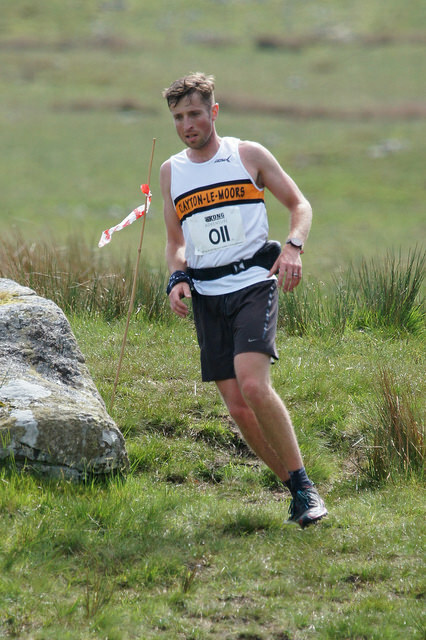 At Ribblehead I was heartened to see Andy Bradley in front of me him being the 1st other club member I had seen since Pen y Ghent. I was prepared for Whernside being tough but not the biblical bog at the bottom – I actually saw 1 bloke go in almost to his waist. Swerve that 1 I thought! I managed to get to the summit of Whernside only feeling like chucking up a little and on the plus side my calves where that sore they had actually gone past pain and were just numb ( a blessed relief!!). I managed to gain a little speed coming down and didn’t knock any walkers over thankfully and before I realised it I was at the Hill Inn and oh joy inside cut offs!! Only by about 18 minutes but I do admit I was relieved! at this point. 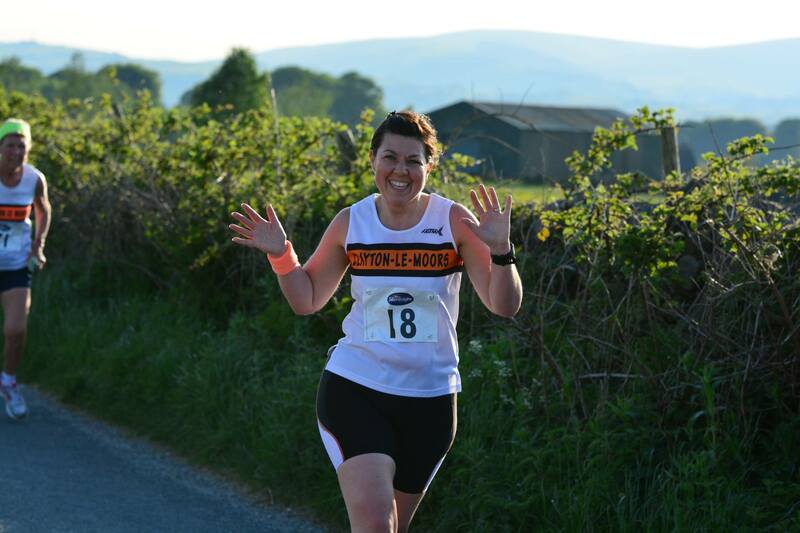 I really knew I would finish the race and gathered myself for the looming bulk of Ingleborough. Two fields in I saw Richard Briscoe and again this raised my spirits to see a fellow club member and managed to stagger past him. Just before starting the climb it hailed for just 2.5 seconds but I thought my world was going to end as I wasn’t feeling quite myself at this point and though this is all i need! The climb didn’t seem as bad this time and I was lifted to see Steve Berry near the top shouting encouragement and giving me a drink of water. He said ” Andy’s just a minute in front of you – he’s yours to take!” I replied that all I wanted taking was a me in a helicopter from the summit but he just laughed ( I was deadly serious but he’d thought I was joking!). On my way to the trig I saw Andy Foster coming down and we said hello. 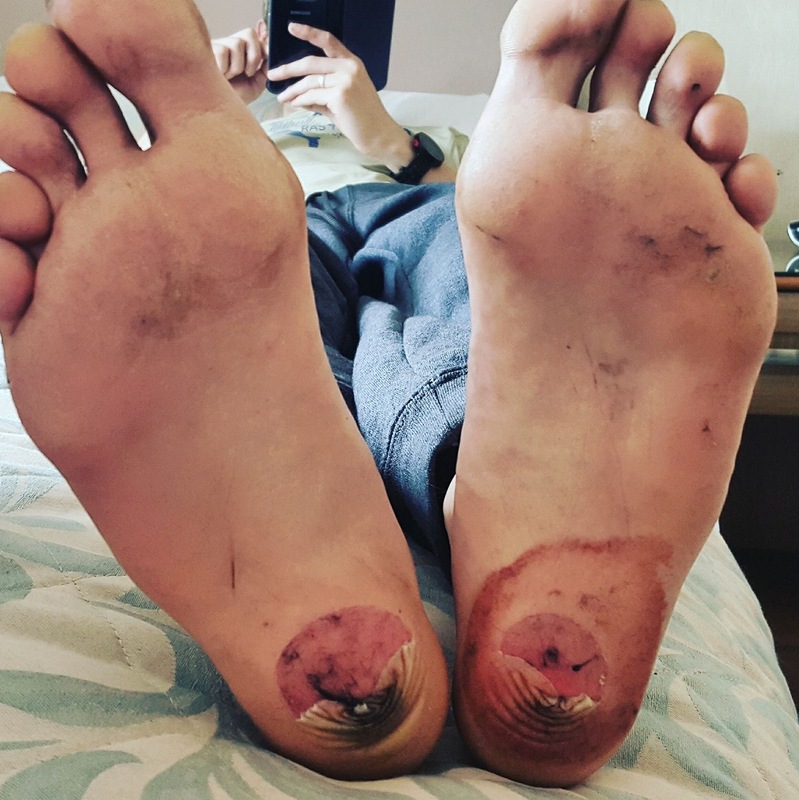 This was the bit I was most bothered about now as I was tired and it is horrible on that limestone coming back ( in fact on our recce Alex ended up with 3 stitches in his knee falling along the route back). 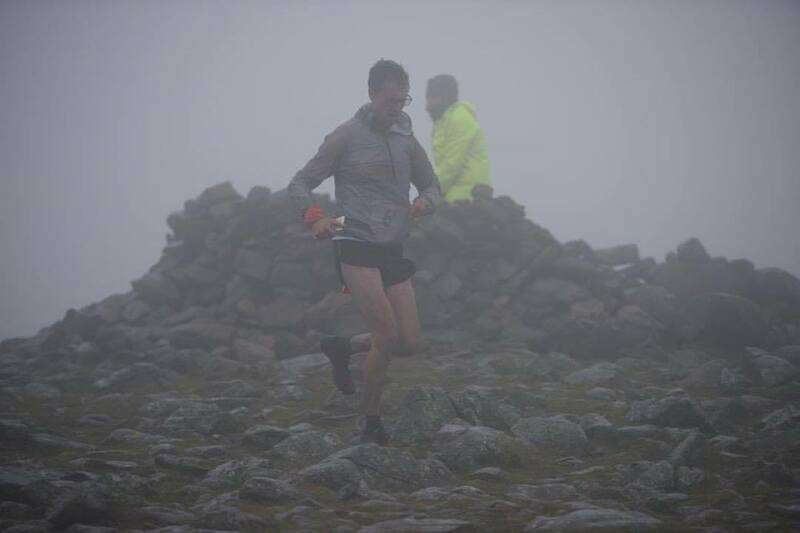 But I remembered Simon’s advice about the race really starting from here and luckily I had paced it so that I steadily overtook quite a few on the way down including Andy who had a bad cramp attack and was slowing rapidly. Even more unusually I didn’t fall. These Yorkshire folk must like value for money in a race, as several times on the way in people shouted just a mile and a half to go when it was more like 4. Even so I managed to gain a few more places till the finish took me by surprise popping out from that tunnel straight onto the field!! It was a great event and a fantastic experience I will definitely do again. 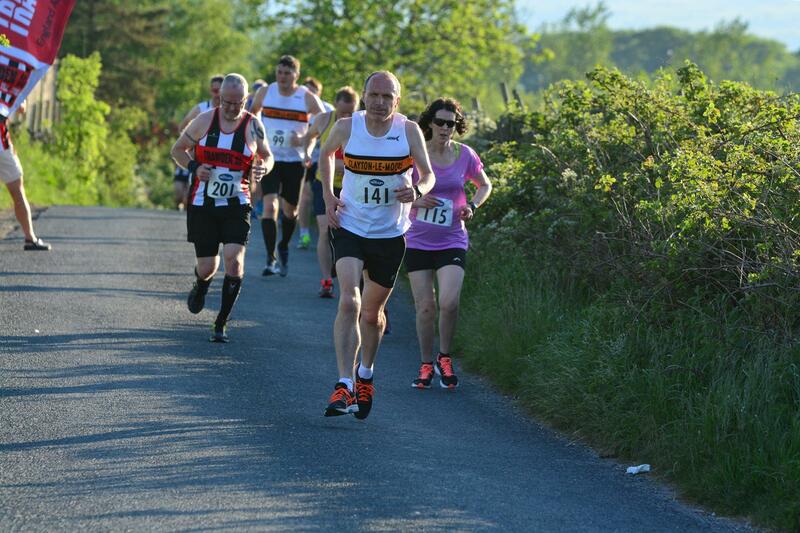 I was very pleased with my time as I had reckoned around 5 hours to 5 and a half mark but got in in 4:45. 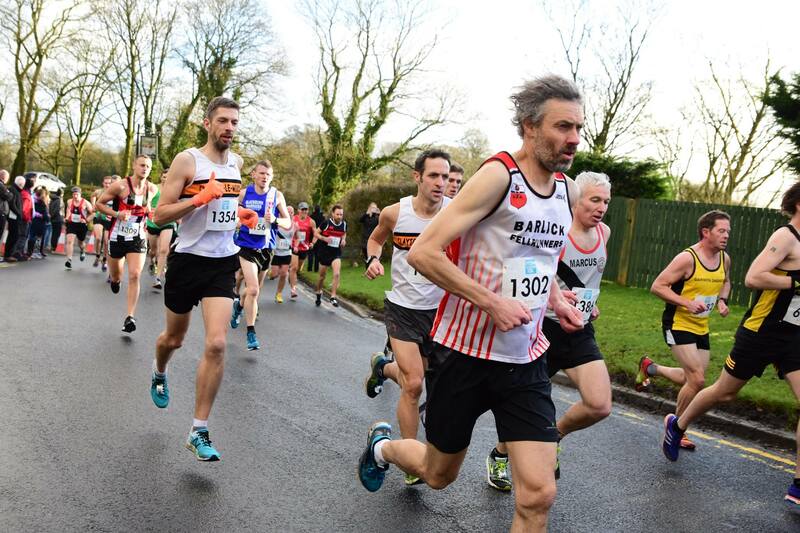 My thanks to the organisers, marshalls and support on this race – it truly is a classic and I’d recommend it to every club member wholeheartedly. 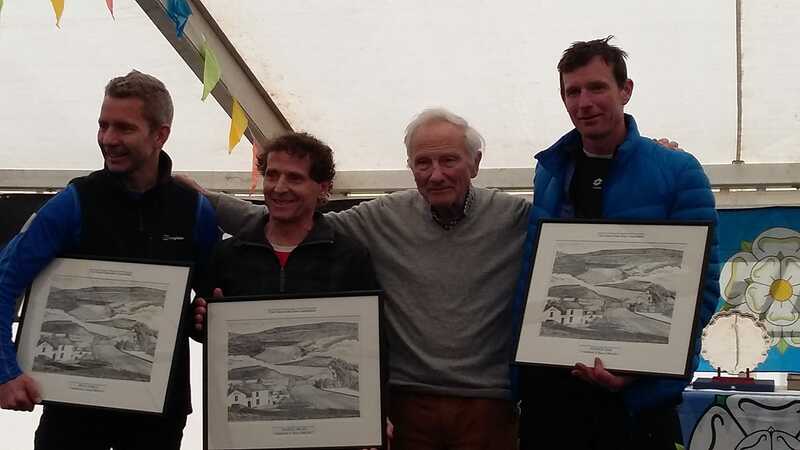 Martin Brady (2nd from L) and Andrew Orr (R)receiving their trophies for 21 3 Peaks completions. Photo: Andrew Firth. 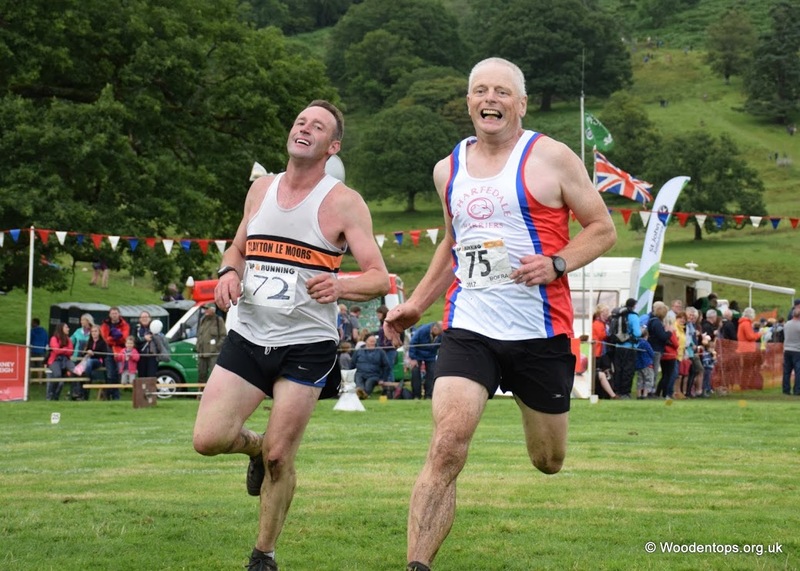 Fellsman regular Andy Armstrong and first timer Alan Dorrington set about this classic old-school ultra in the Dales, finishing together at the end of its 61 mile route with over 11,000ft of climb in just over 18 and a half hours. For Alan it was a step into the unknown, given he hadn’t run more than 6 hours before but a combination of frequent refuelling with sausage rolls, pasta, hotdogs and flapjack and Andy’s experienced pacing and grit when he was unable to eat any of the above mentioned buffet for the last part of the race, saw them both round in good order. A great, if slightly lengthy day out over the many of the highest parts of the Dales. No let up in the winter weather this month with gales, snow, ice and then a proper cold snap heading toward the UK at the end of month. 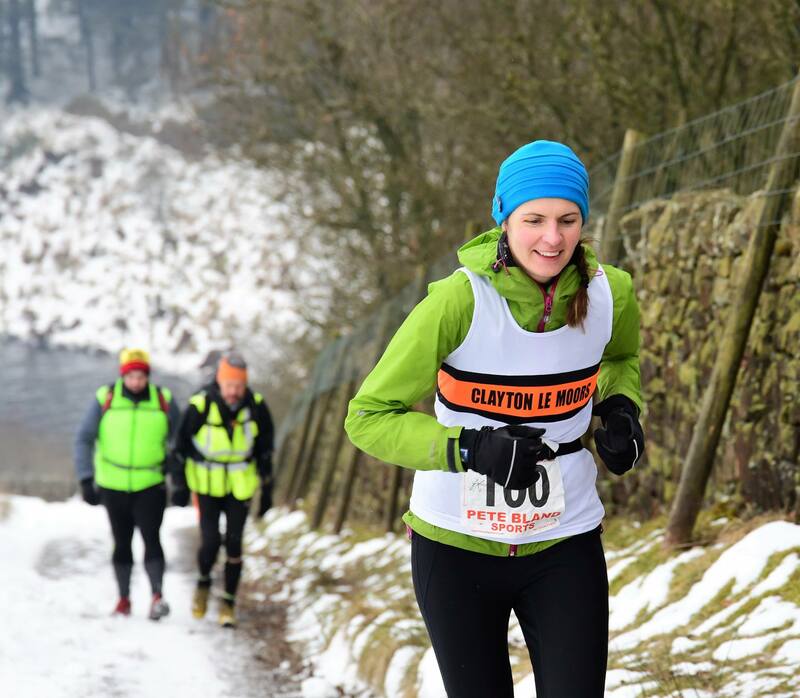 Of course none of that deterred the Clayton runners from hitting muddy fields, wintry fells, snowy mountains and the roads in between. 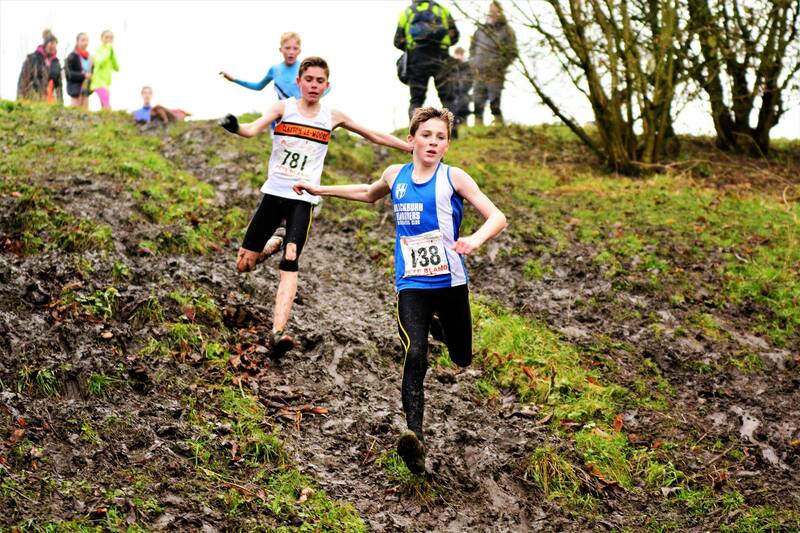 Clayton Juniors were to the fore at the recent Lancashire Schools Cross-Country Championships. 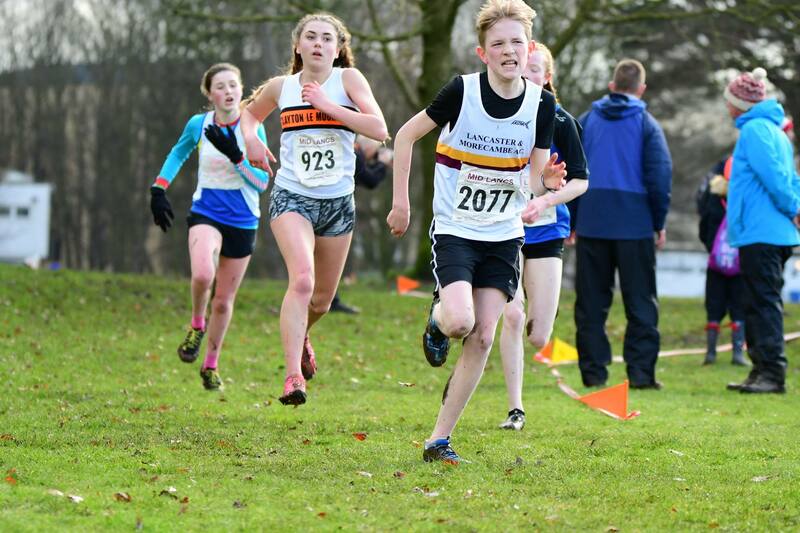 There were fine age group wins for Helana White and Briony Holt, top 10 places for Harry Cole, Ella Dorrington and Jackson McKay and a host of fine supporting performances as our Juniors ran for their individual District teams. 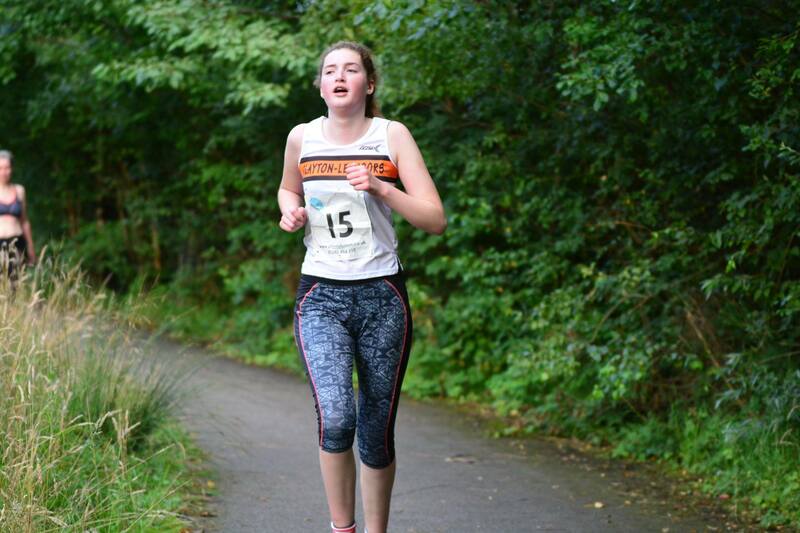 Inter Girls – Briony Holt 1st, Millie Stubbs 8th, Caitlin Welsh 31st. 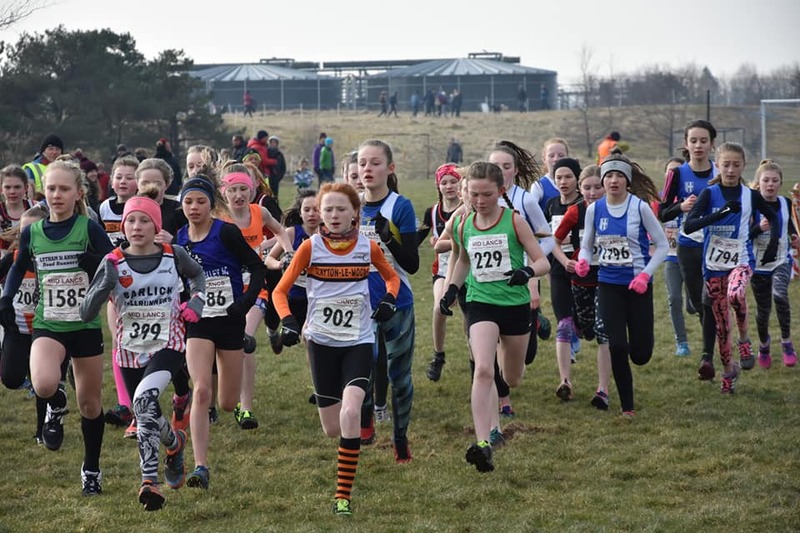 Apologies to anyone I have missed – as our Juniors were running for their District teams it is harder to spot them in the results. 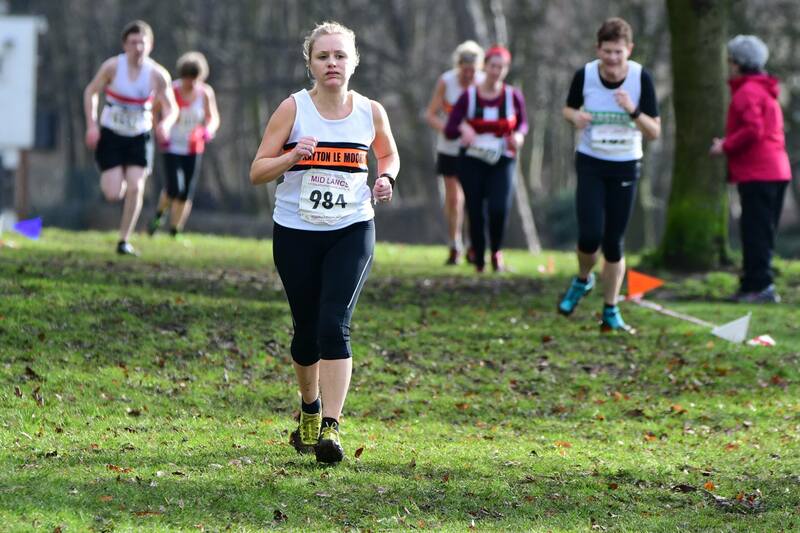 A very strong field lined up for the 2018 Winter Warmer at Witton Park on a chilly Sunday morning with the sun on our backs which made for very good racing. 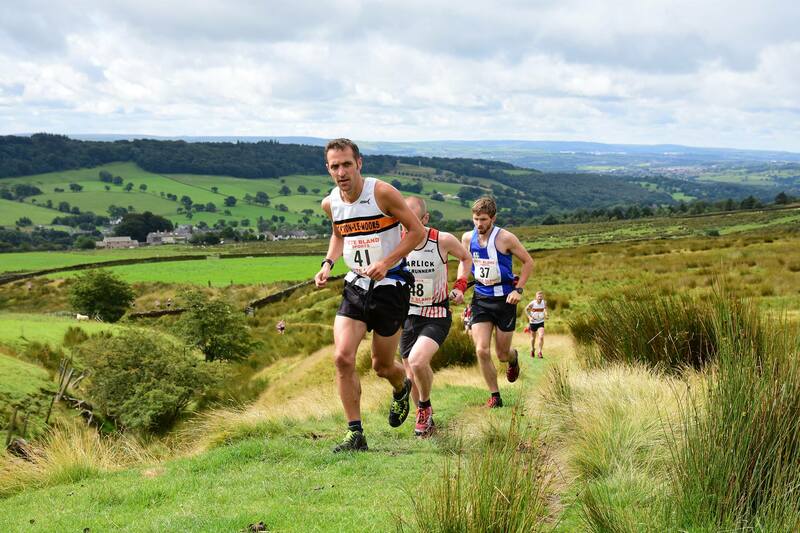 The course itself is a toughie and from past performances one which normally sees you at least 2 minutes short of your PB. It starts with a climb of around 450ft climbing out of the park and then most of the work is out of the way. I managed to hold on to a pack holding the top 5 until the descent which found me lacking a bit for speed to keep with them. There is a little kicker of a hill at mile 4 before you start on your way back through the park which again is flat or descending until you see the track. I’d managed to gain a couple of places back but was starting to get a bit concerned when I looked behind and saw a lad from Salford starting to make some distance on me. Not to be deterred I held on and pushed for the last lap around the track for a top 10 finish. 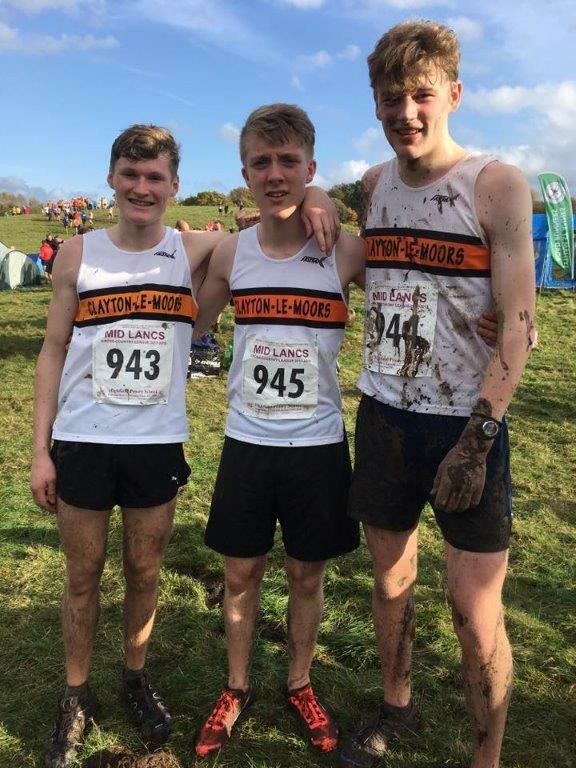 There were some outstanding runs from the younger Clayton lads picking out a couple of exceptional results from Nick Hennessy 38:11, Ryan Bradshaw 37:22 & Josh Hall 42:30. 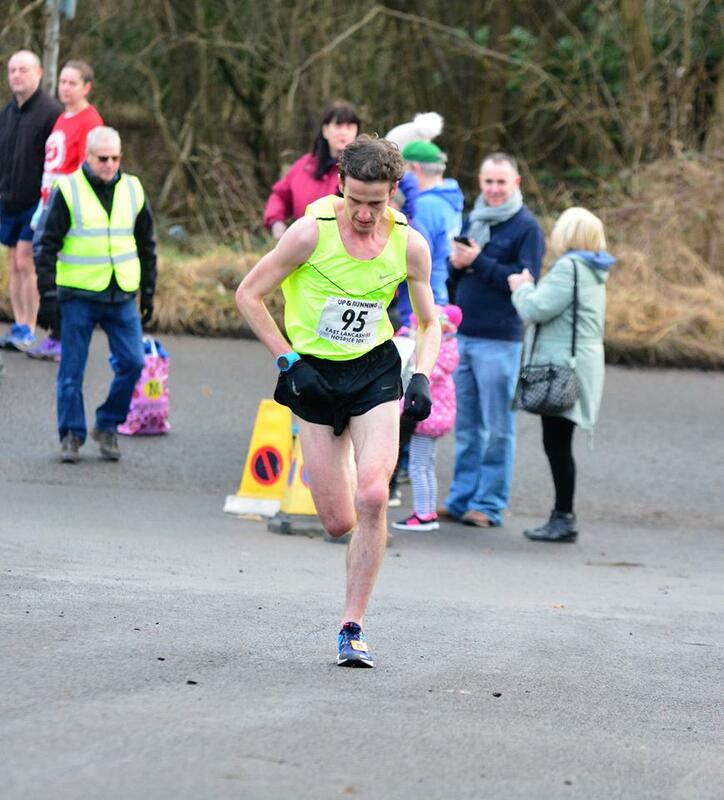 Great start to the road championship for 2018 and well done all whom turned out to run and cheer us on. 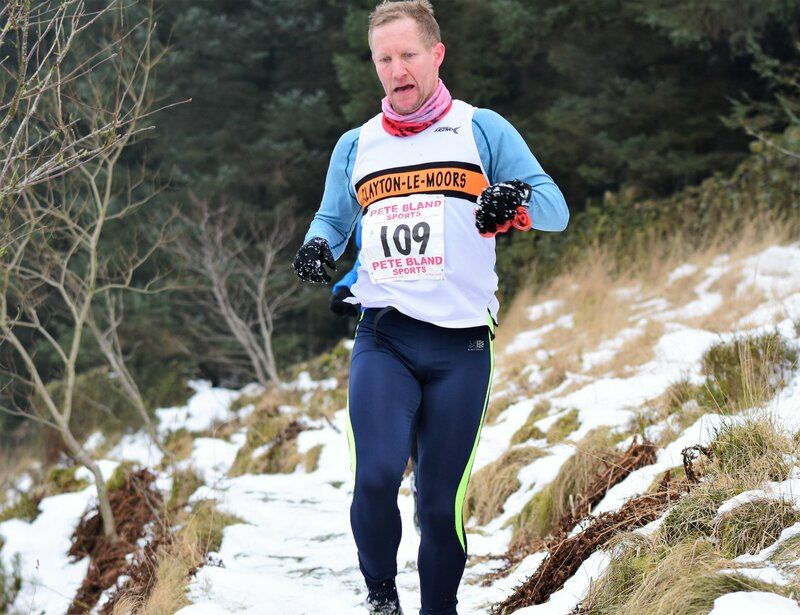 Alan Dorrington headed over to North Wales for the 1st round of this 4 hr score event series, held out of Bethesda on sunny day with low temperatures and with significant snowfall higher up to spice things up..
Well this race certainly lived up to its name! On a very wet & cold day I layered up well with 2 hats, 2 pairs of gloves and 4 tops to ensure I kept warm and braved the moors around Littleborough & Blackstone Edge. 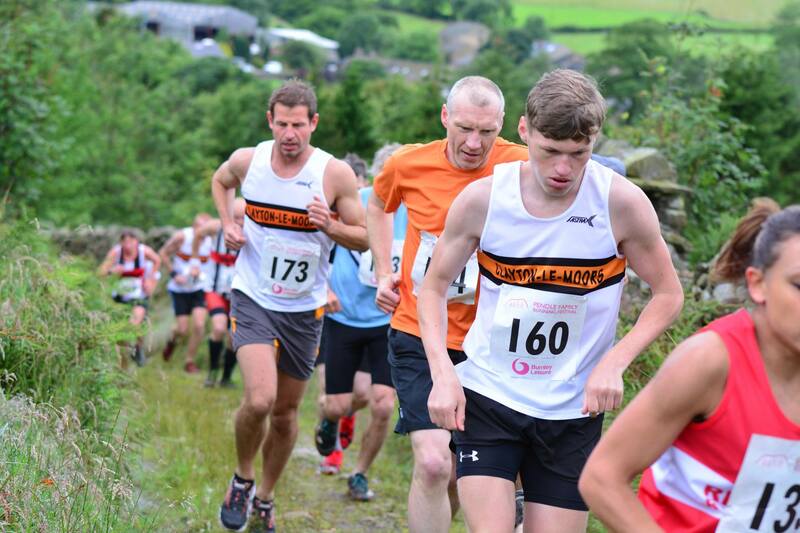 Starting out at the Rugby Club near Hollingsworth Lake you climb up over the M62 and onto the moors about 3 miles in there is a climb which goes on for a mile and climbs around 900ft. Once you got to the top you got hit with a wall of wind and rain. The path followed the old Roman road for quite a bit which was treacherous due to ice. 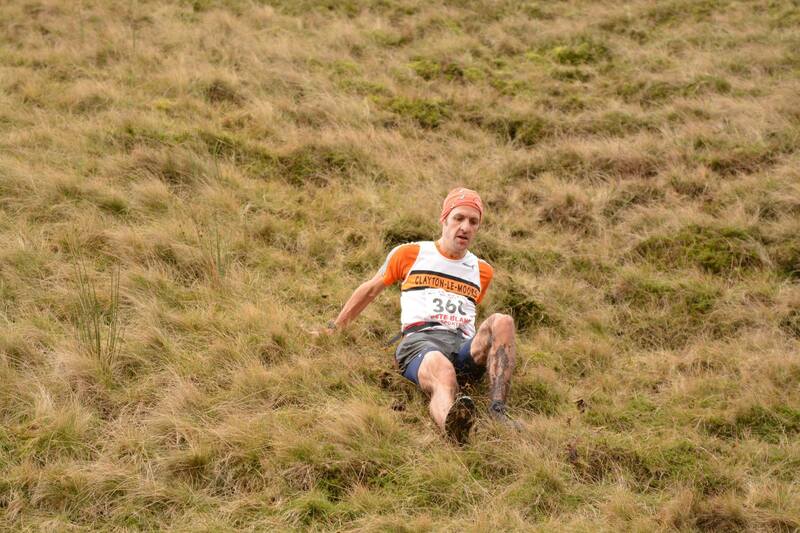 This lost me a bit of ground on the top 10 due to lack of grip in my mudclaws. On the way in you have about 2 miles of really good trail and finally some good old fashioned 2 foot deep mud making it quite a quick run in! Even though the elements were against us I really enjoyed it and could have been caught with the occasional smile on my face (hard to believe I know!). 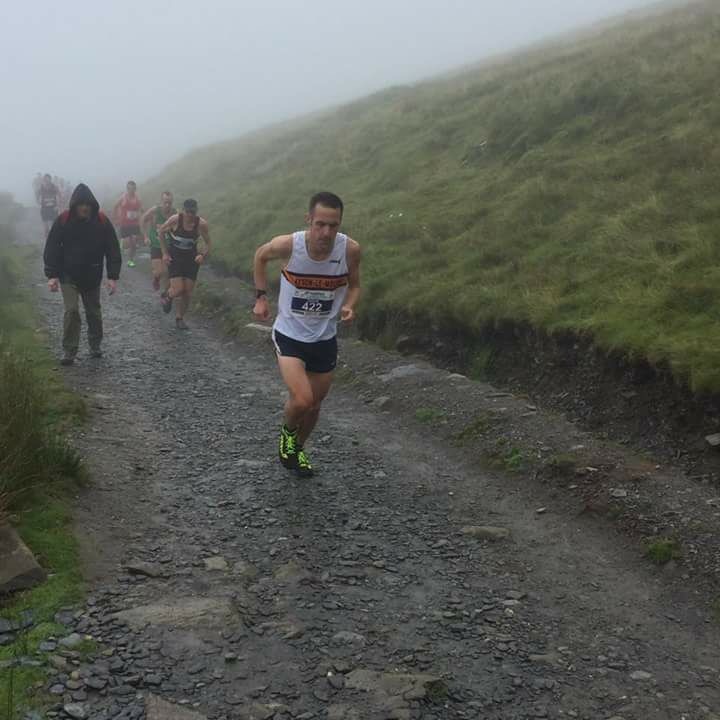 Overall I came 11th in 01:08:53 (8.8miles 1565ft). 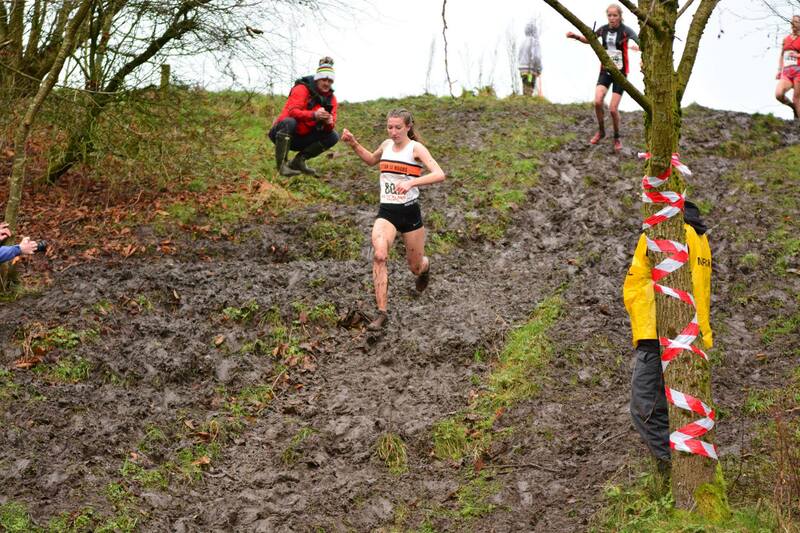 Briony Holt digs in at Barbondale. 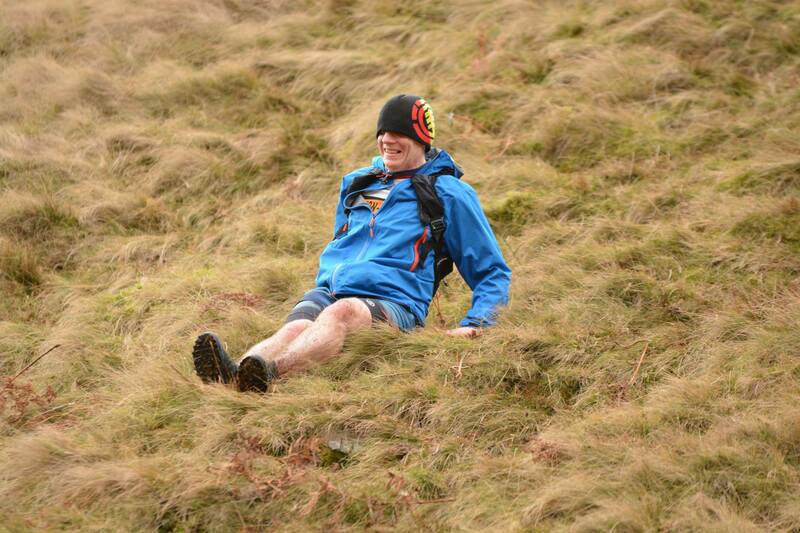 The ground was slippy, wet, sprinkled with ice at the top but nothing of value on the way up or down. The weather cleared at the top for a while and I decided to wear a top and gloves as it was completely different to the conditions in the valley below. And the views,when the weather cleared were more than worth the effort. 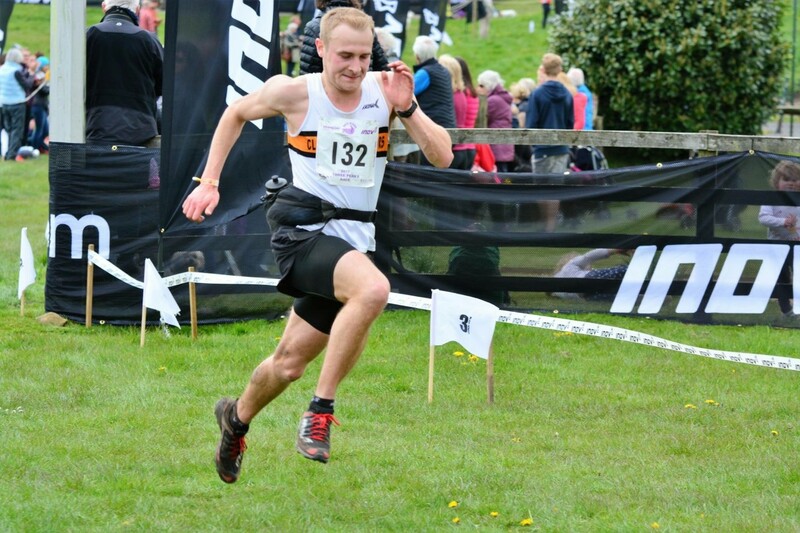 A new venue up the M6 for the penultimate round of the Mid Lancs XC series saw the Clayton tent pitched in the middle of Ryelands Park, Lancaster. 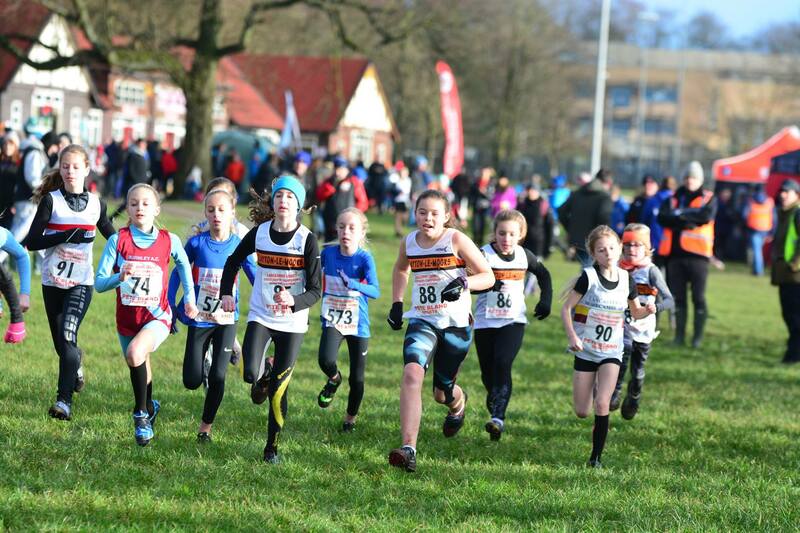 The U11 Girls team of Amelia Halstead, Ellisia Smedley and Joni Higgins were straight into warm up and off round the grassy course which had a few twists and turns rather than lots of straights. 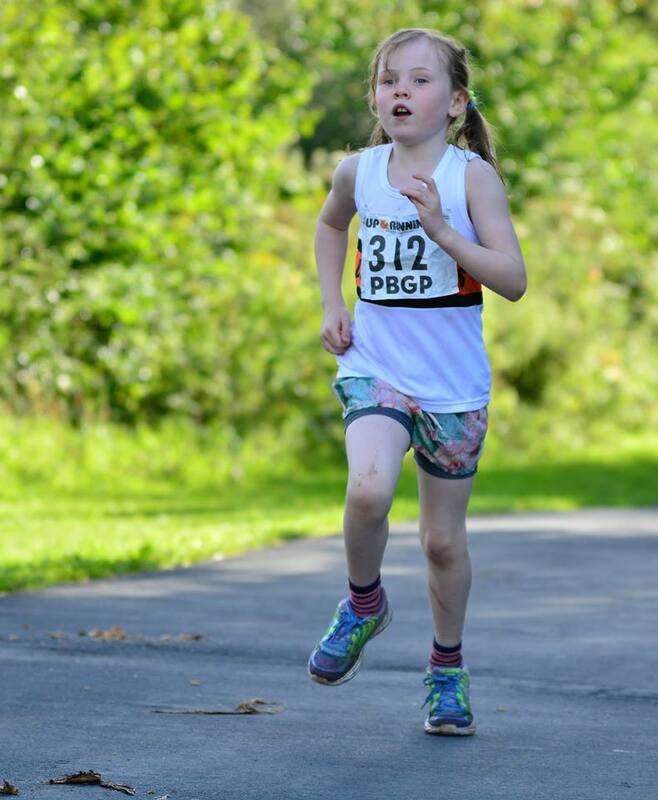 Amelia continued her good form and took 7th, with Ellisia and Joni in 57th and 61st. 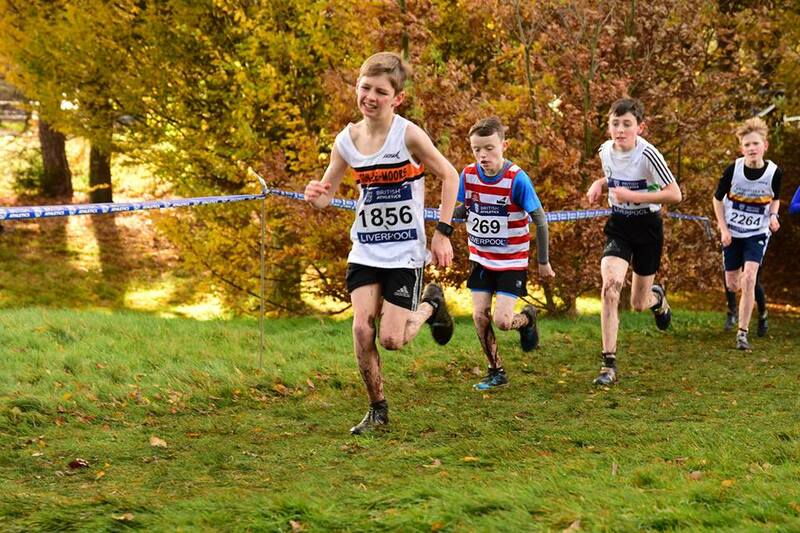 In the U11 Boys, Charlie Barnes was 45th and Joshua McKay 62nd. 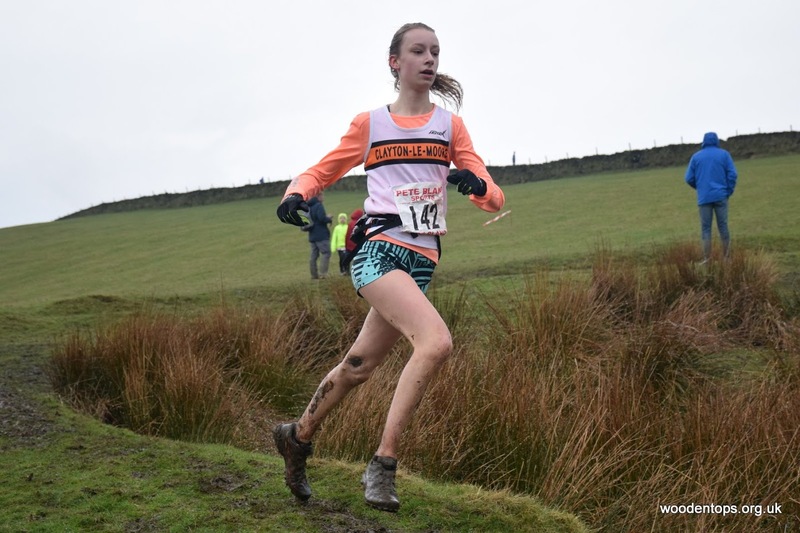 Helana White scored her best performance of the Mid Lancs series so far, with a really gutsy run to 3rd place in the U13 Girls, with Ella Dorrington in 8th and the ever-improving Imogen Ferguson in 40th. The girls also took 3rd in the team competition, setting them up nicely for a possible series team placing. 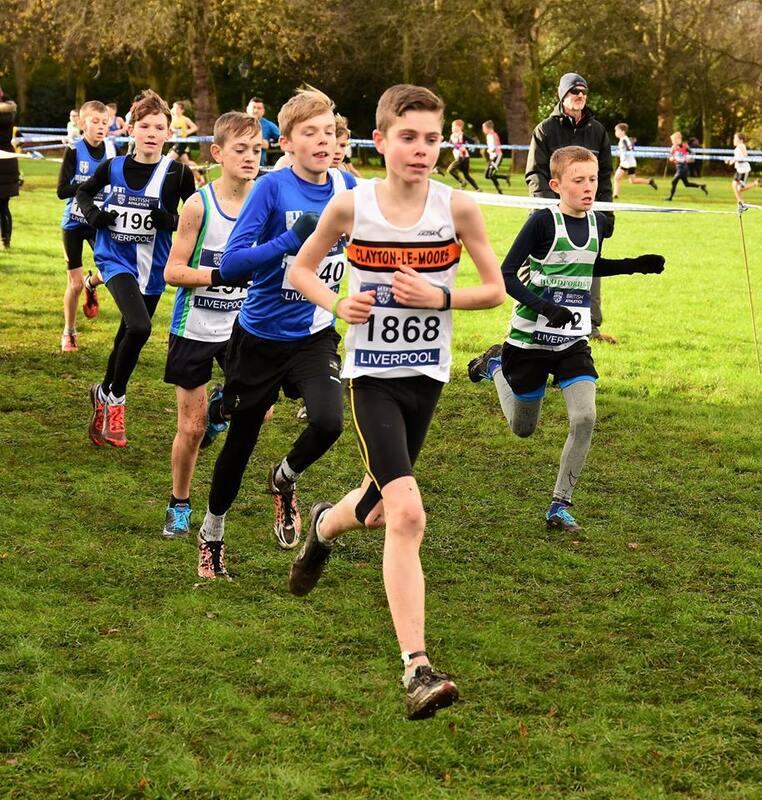 William Nicholls also had a great run for 16th in the U13 Boys, with Robbie Smedley, Finley Stubbs and Matthew Jackson supporting. 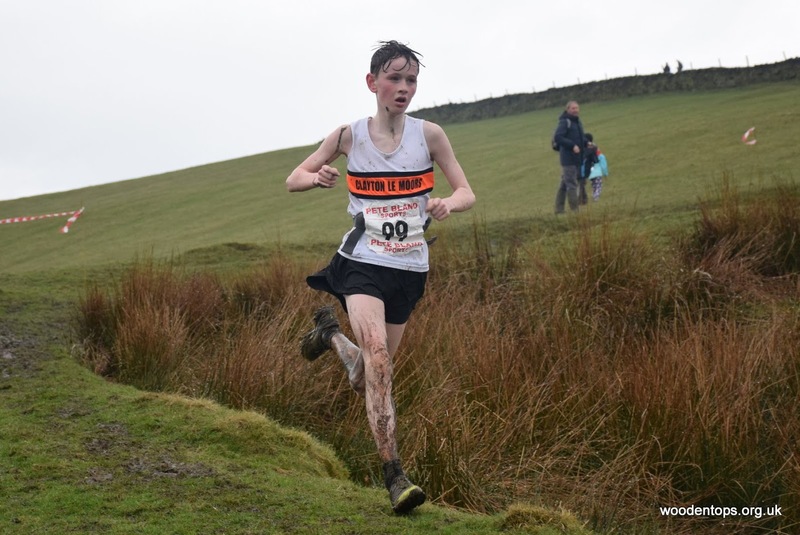 Millie Stubbs was the sole U15 Girl in 12th, whilst Jackson McKay also came in 12th in the Boys race, closely followed by Harrison Codd in 13th and Lennon Jackson in 23rd. 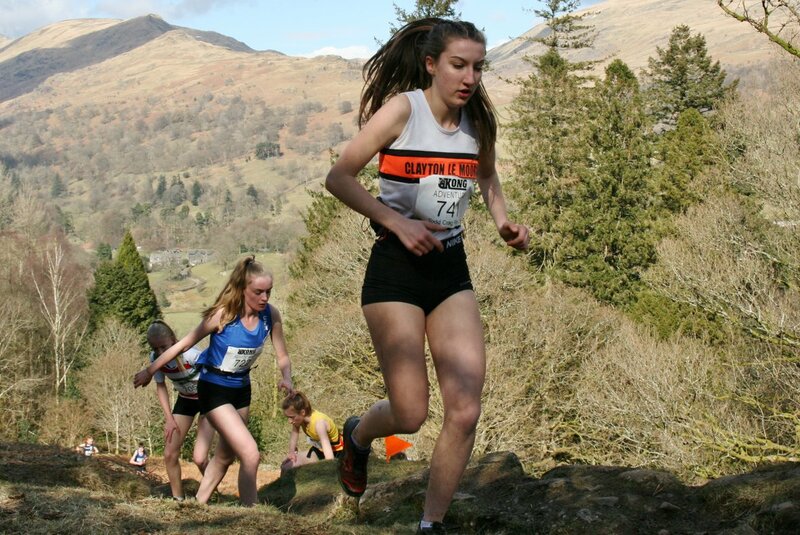 Briony Holt took 3rd in the U17 Girls race, despite suffering the after effects of a tough England Mountain Running Team training camp earlier in the week. 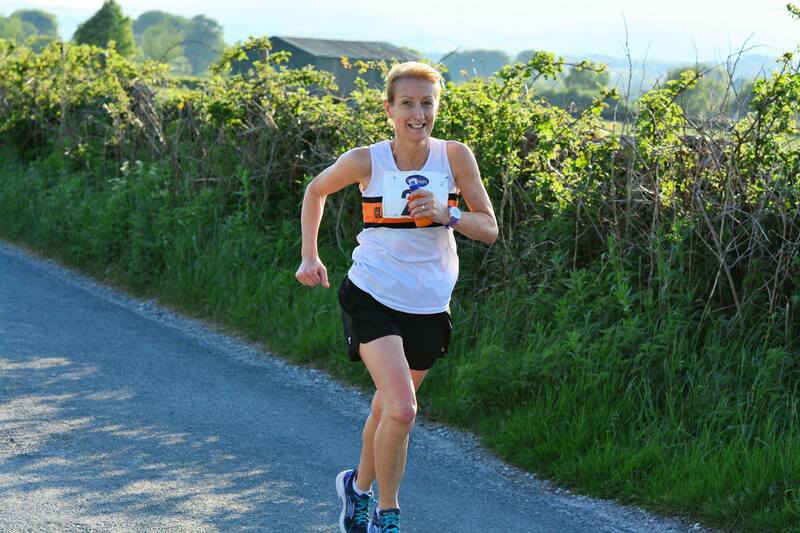 Donna Airey led the Ladies home in 25th, as well as the Ladies Over 35 team to a fine 2nd place backed up by Michelle Abbott and Cassie Smedley. 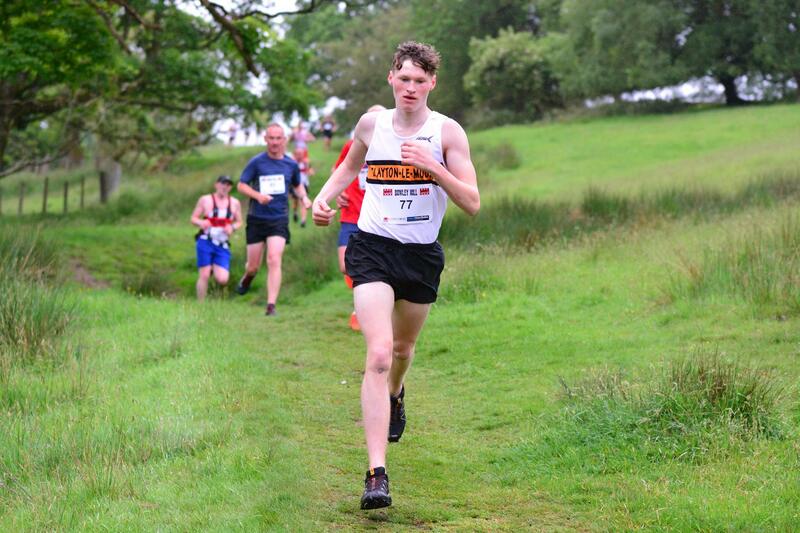 Another consistent improver, U20 Calum Holmes was the first Clayton man back to the finish in 18th, leading the Men’s team of Tom Brewster, Thomas Walker, Andrew Holt, Mark Aspinal and Chris Funnel to 2nd in the team competition. With the addition of John Wilcock, the Vet men took 3rd Over 40 and 2nd Over 50 team also. 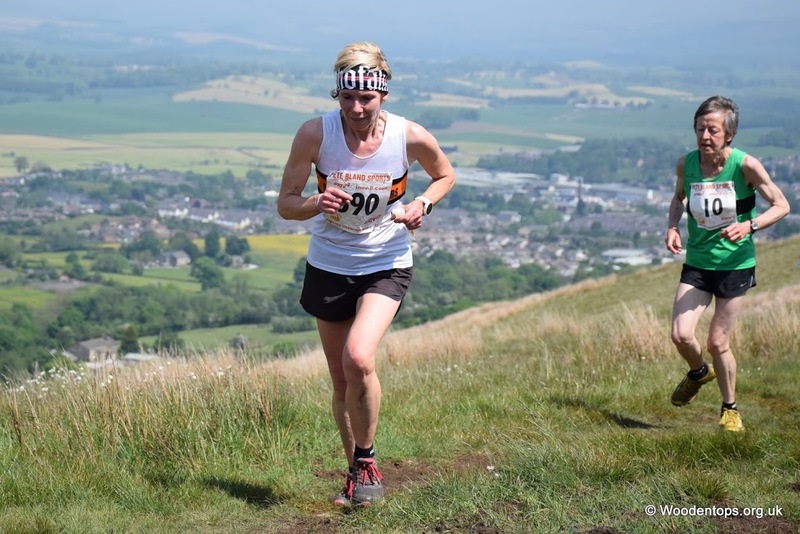 Organised by fell running royalty in the form of Nicky Spinks, this low key local race around the hills near Dewsbury incorporates relaxed Junior races and is a lovely warm up for Juniors looking ahead to the fell season starting in the Spring months. Not that it was that warm with the Best from the East on the way, though the snow was yet to arrive. 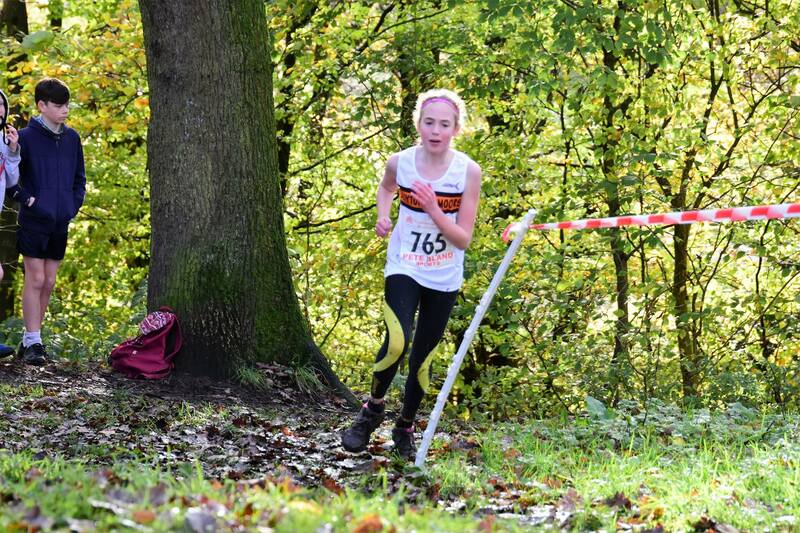 Ella Dorrington was the sole Clayton runner there amongst the Juniors but made up for that by coming 2nd overall in the U15 race, as well as 1st girl in the combined U15 and U17 race. Chocolate prizes presented by Nicky capped off a lovely day out. Kicking off 2018 with a (X) Country flavour! 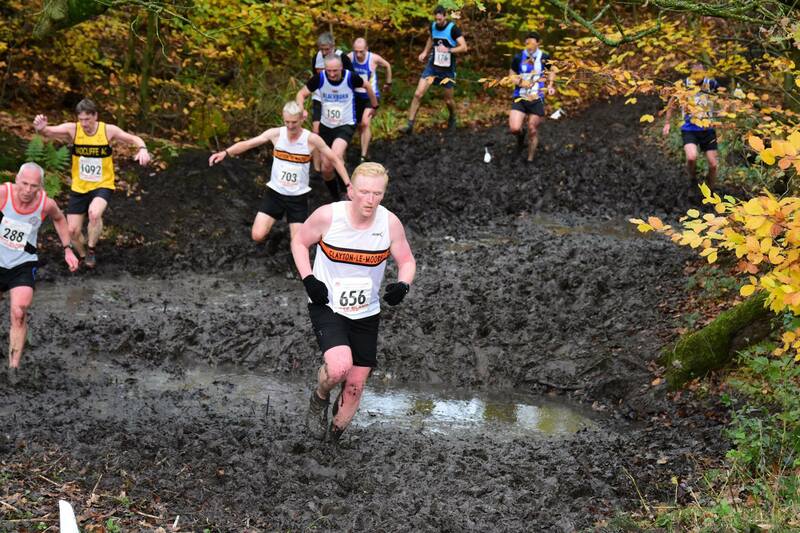 It’s been (mostly) about cross-country during this otherwise quiet month, with the Lancashire Championships, and Mid Lancs League as well as some other mud-based action further afield. 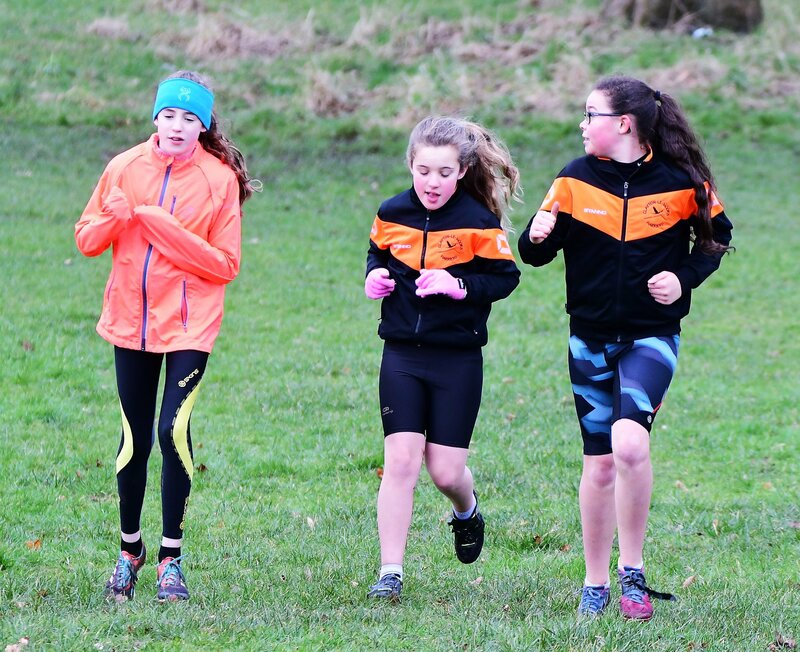 Worthy of special mention, is the club’s Junior section who continued training hard right through the Christmas break, with both the younger and older Juniors putting in the time despite the weather. This led to both individual and team awards for their efforts, with ALL the Juniors being part of the success that is Team Clayton. We also learnt this month that Danny Collinge, one of the Junior section’s big inspirations and role models as well as ambassador for Clayton overall is soon moving on to pasture’s new. 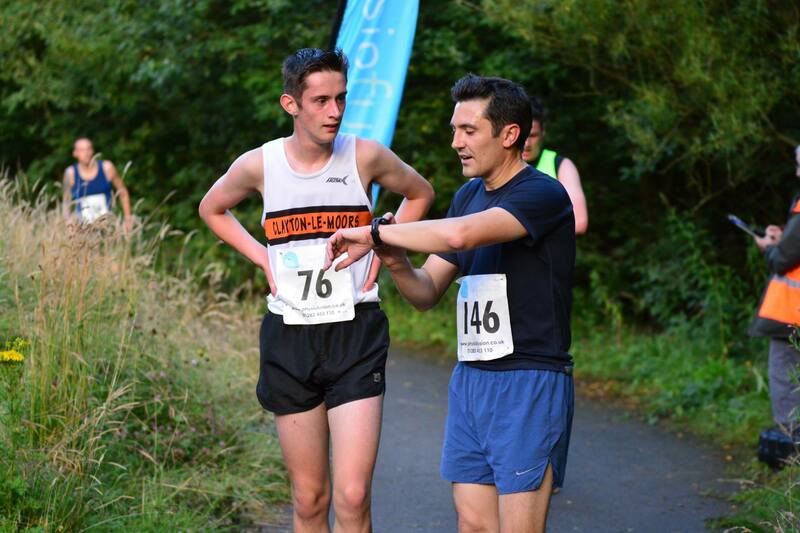 Danny’s fantastic exploits have graced this report many, many times over the years and behind the scenes his help, support and encouragement for Juniors (and Seniors too) has been hugely valued and much appreciated by so many in the Clayton family. In common with all of us at the Club, I would like to thank Danny and wish him the all the very best for his running in the future – thank you. 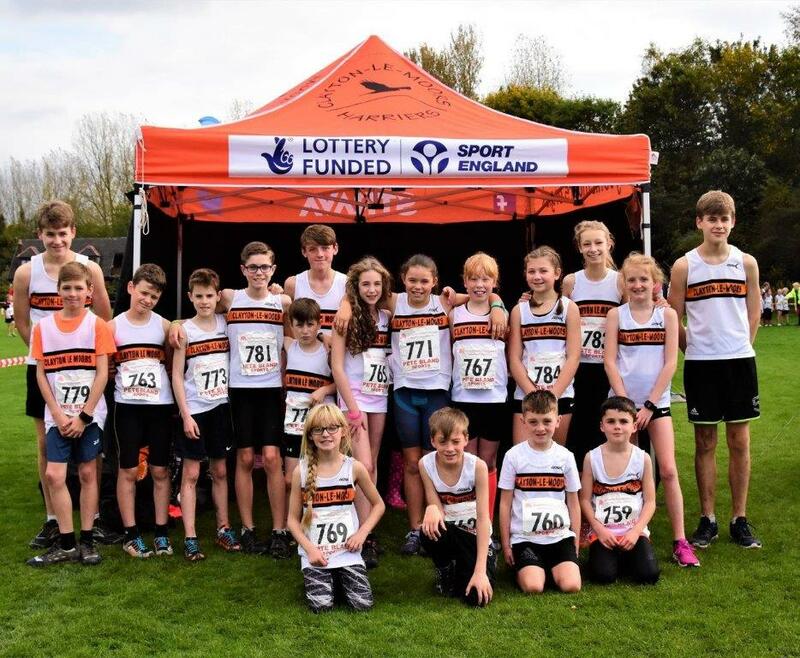 We’ll start with our Clayton Juniors as they came away from the Championships with a fantastic medal haul and a good collection of Lancashire vests earned for the Inter Counties race in March. 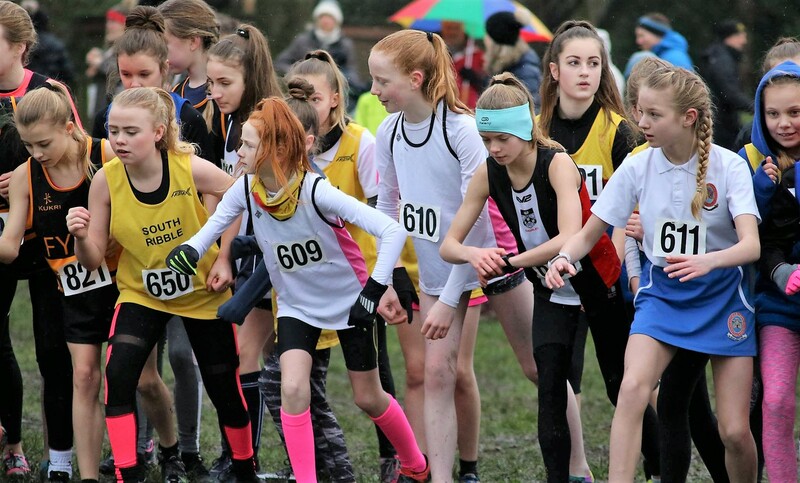 Amelia Halstead (in blue headband above) pulled off a stunning victory in the U11 Girls with a finely judged run from behind to overhaul all but one of the hard-charging front runners on the second lap, and all finished off with a gutsy sprint to the line to take the win. 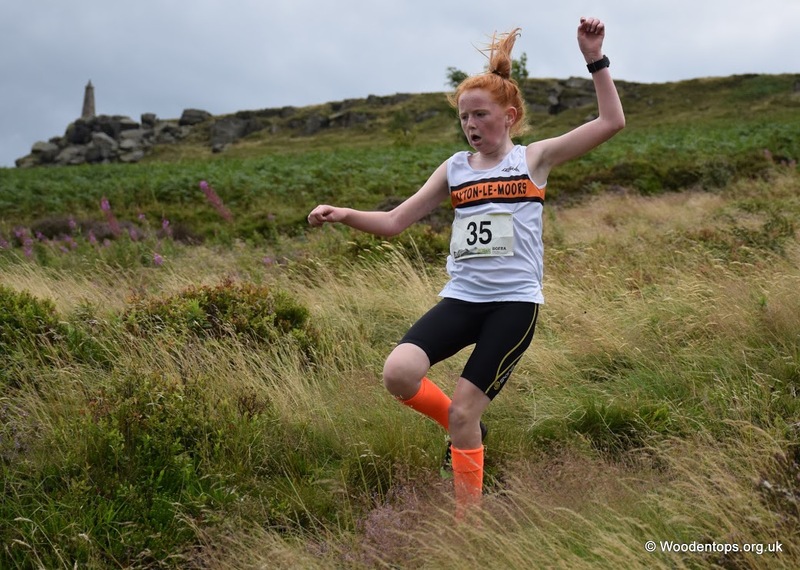 Amelia had been moving up the placings in Red Rose and Mid Lancs league races so her Championship win was not unexpected but richly deserved nonetheless. 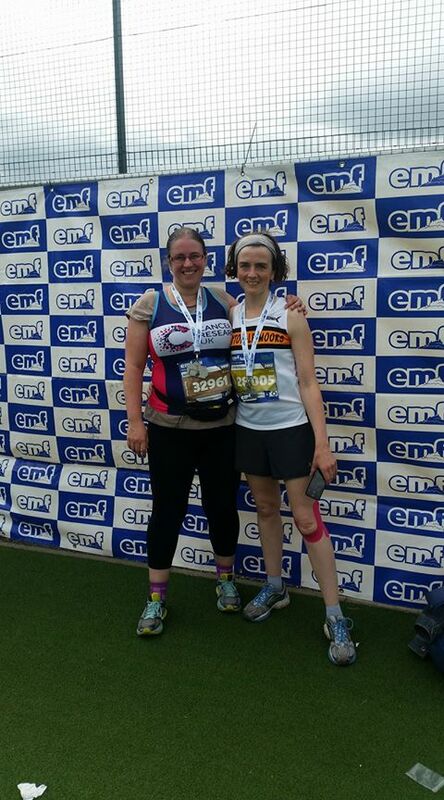 Ellisia Smedley, Emily Nicholls and Joni Higgins all battled hard and made up the Clayton team finishers. 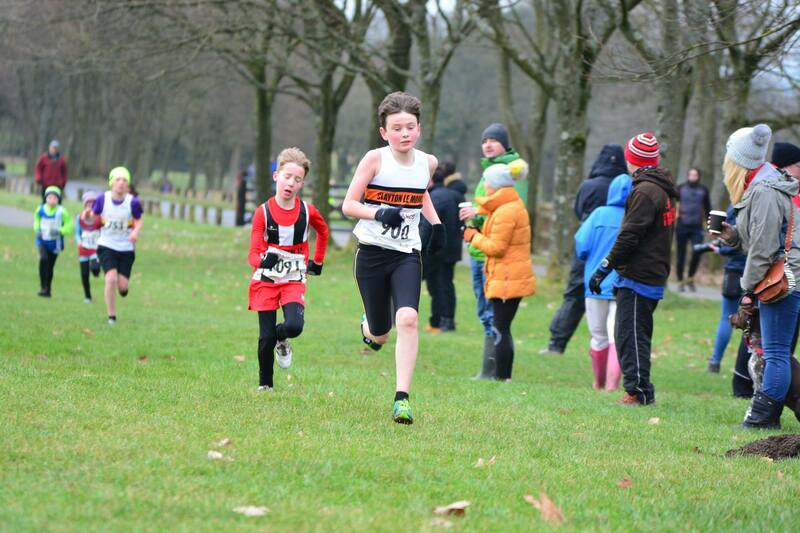 In the U11 Boys race, Charlie Barnes (in 31st) led home Brayden Clarkson, Joshua McKay and Fraser Anforth for a team finish. 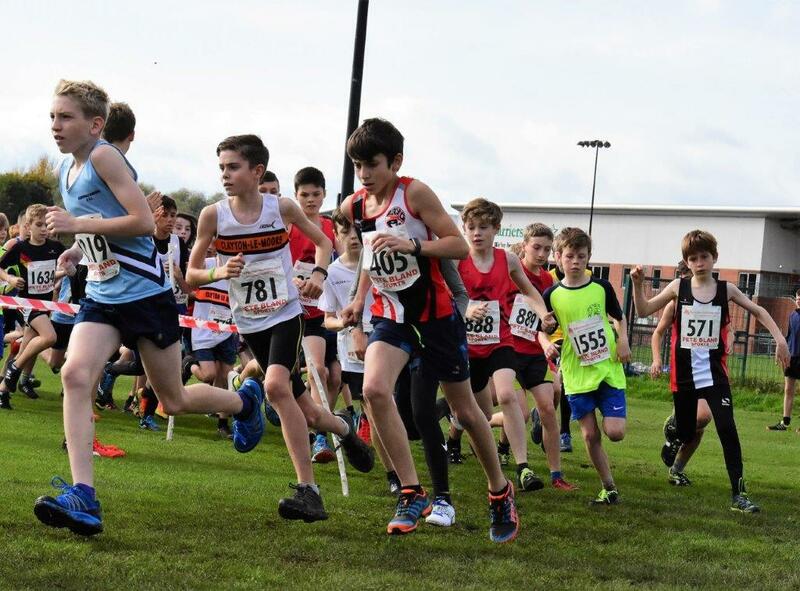 All eyes were on Robbie Smedley, Matthew Jackson, William Nicholls, Finley Stubbs, and Jenson Bentham in the U13 Boys race for both individual results and the team prize. 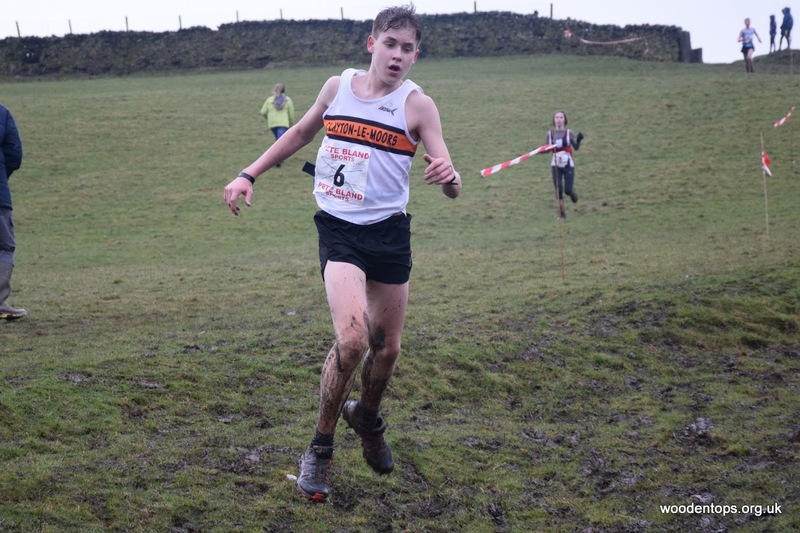 Robbie Smedley had a fine run to take the Bronze and with it Lancashire selection whilst Matthew Jackson also placed in top ten (and reserve for the County team) and with the others, secured 2nd place in the team competition. 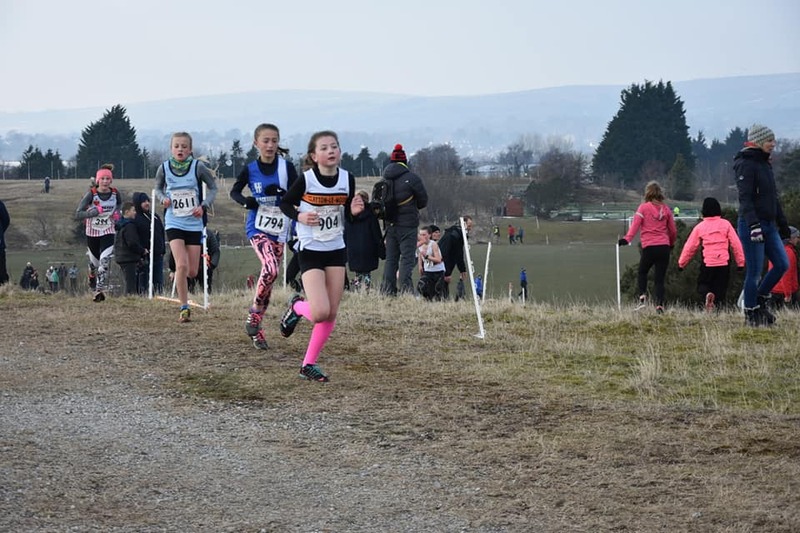 Helana White and Ella Dorrington were both aiming for Lancashire vests in the U13 Girls race and after one of their customary big battles with each other, as well as the rest of the field, both secured their vests with Helana 6th (in her first year in the age cat)and Ella 5th. Behind them, Imogen Ferguson and Rachel Stevenson brought their lovely smiles and cheery demeanour to our U13G team. 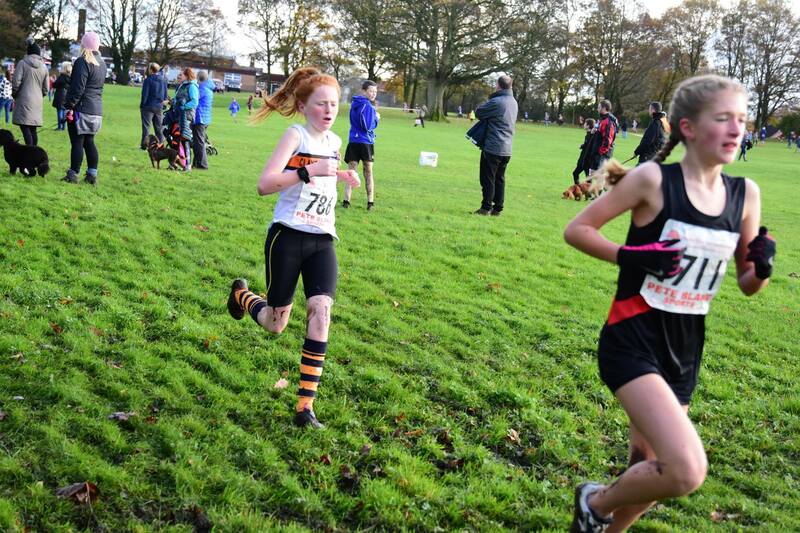 Millie Stubbs, Kaliska Clarke, Beth Wheatcroft and Keira Stevenson all ran in the U15 Girls with Millie 13th after chasing hard for a top ten place. 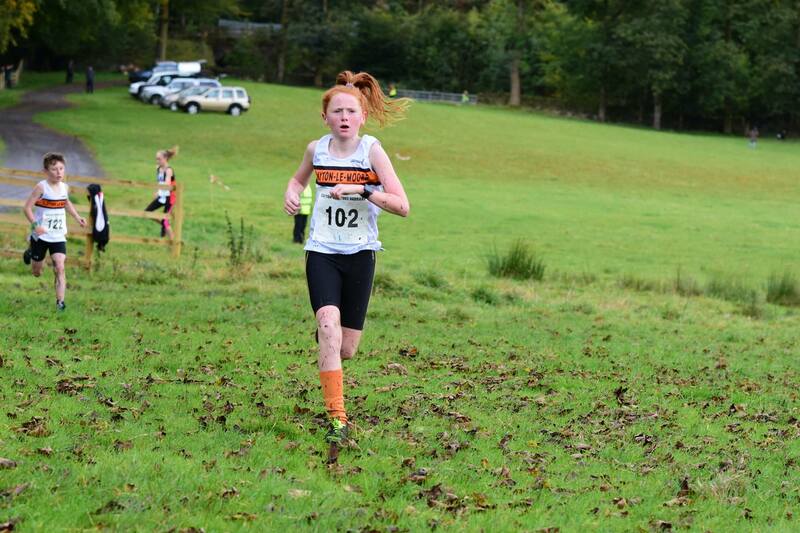 Briony Holt secured Lancashire selection with a strong 4th place in her first year in the U17 Girls age group, whilst Josh Hall and Nick Hennessey were 10th and 16th respectively in the U17 Boys race. 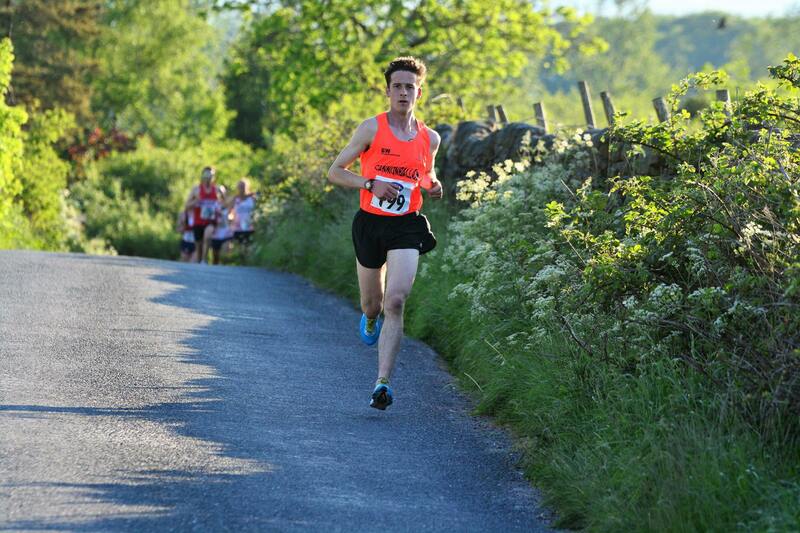 Danny Collinge came home 11th in the Senior race and earned a reserve place on the Lancashire team. 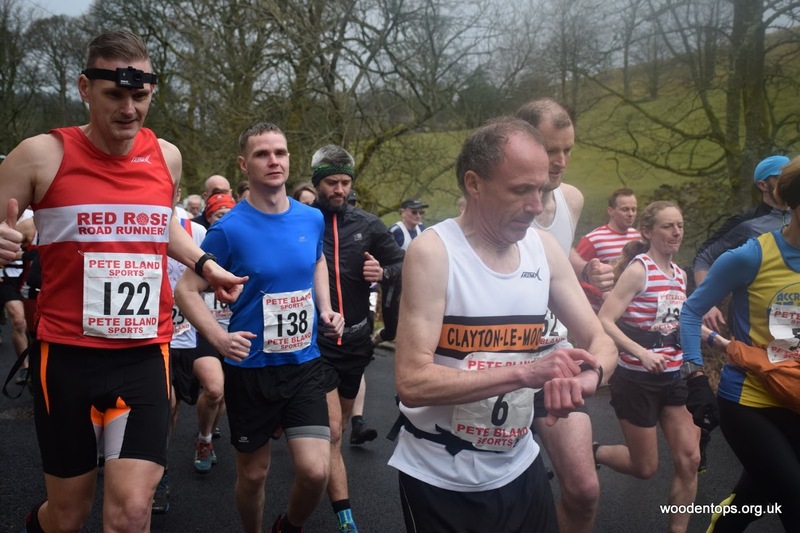 Finally, in the Vets race, our team of David Edmondson, Richard Stevenson, Andrew Holt and Michael Toms were 3rd, with Tara Robb leading the Clayton Ladies in (26th), and Donna Airey the Vet Ladies (16th). 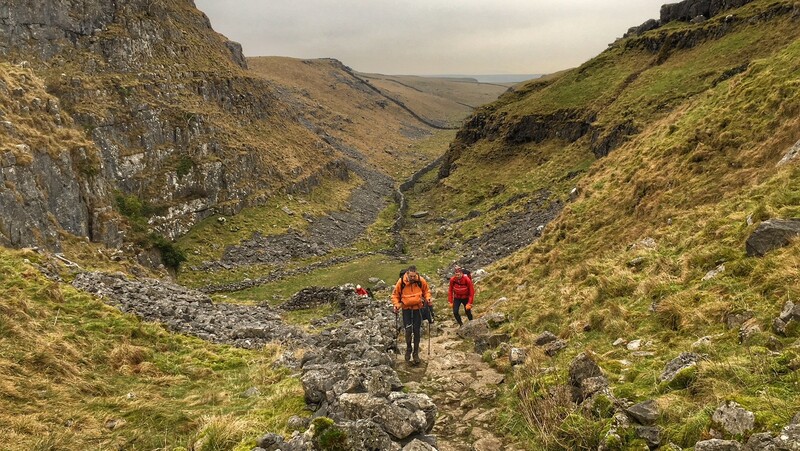 Nicholas Olszewski, Andrew Armstrong and Andrew Morley lined themselves up for this epic challenge, 108 miles along the Pennine Way to Hardraw in the Yorkshire Dales. 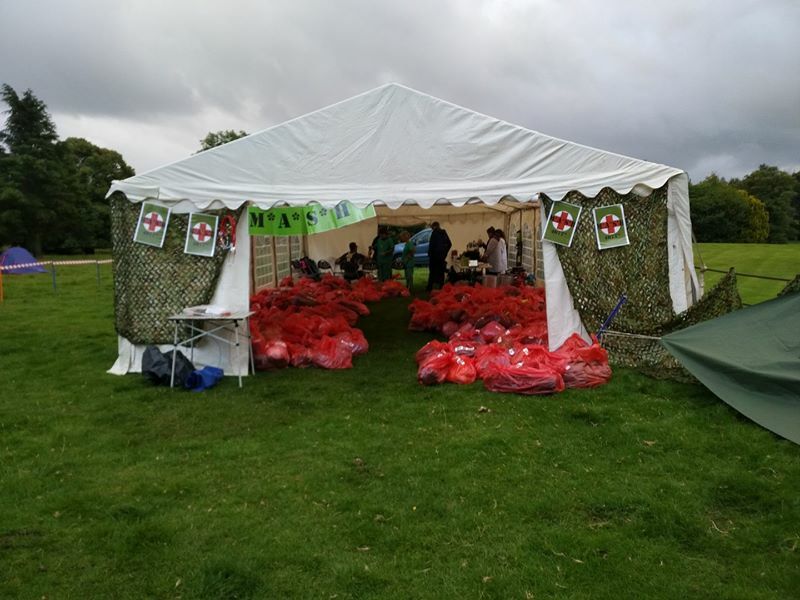 Freezing temperatures, torrential rain and biting winds did nothing to deter their resolve and they all finished close together in 39 hours. Yes, 39 hours of non-stop running, walking and general forward movement. There are photos circulating of discolated fingers, trench foot and the like but it’s probably safer to show some of the photos I took whilst encouraging them near Malham Cove. Special mention too to Adrienne Olszweska who was probably as sleep deprived as them travelling around supporting on the road stops. 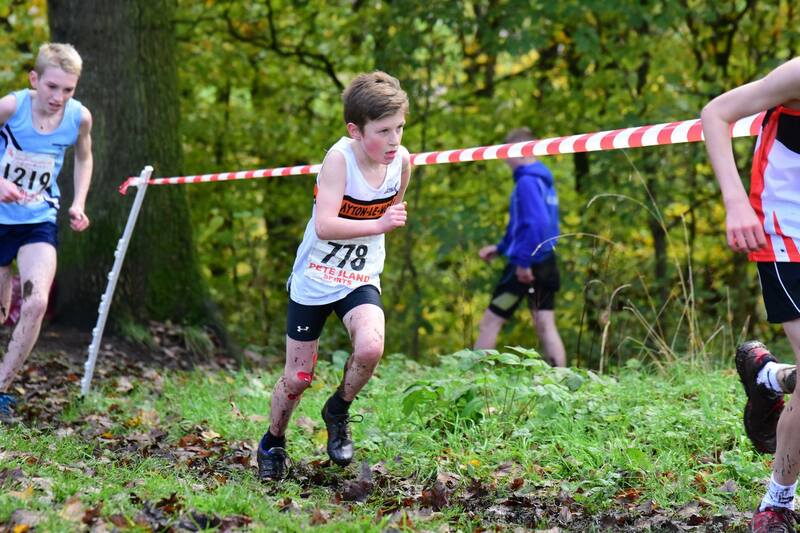 With barely enough time to clean off dirty spikes from the weekend before, our Clayton athletes were back in action on home turf at the 4th Mid Lancs League round in Towneley Park. 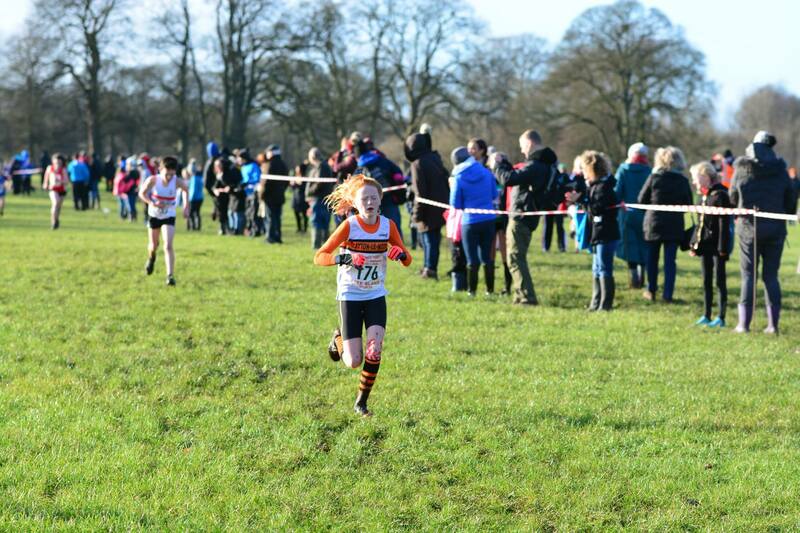 Conditions were surprisingly fast and firm leading to some quicker racing than in the heavy going at Witton Park the week before, though a cold wind in the finish straight made fast finishes tough going..
Amelia Halstead built on her win at the Lancashire Championships the week before with a great 2nd place in the U11 Girls, whilst in the U13 Girls Ella Dorrington produced her best Mid Lancs performance this season in 3rd, backed up by Helana White in 6th. With Imogen Ferguson they took 3rd place in the team competition. 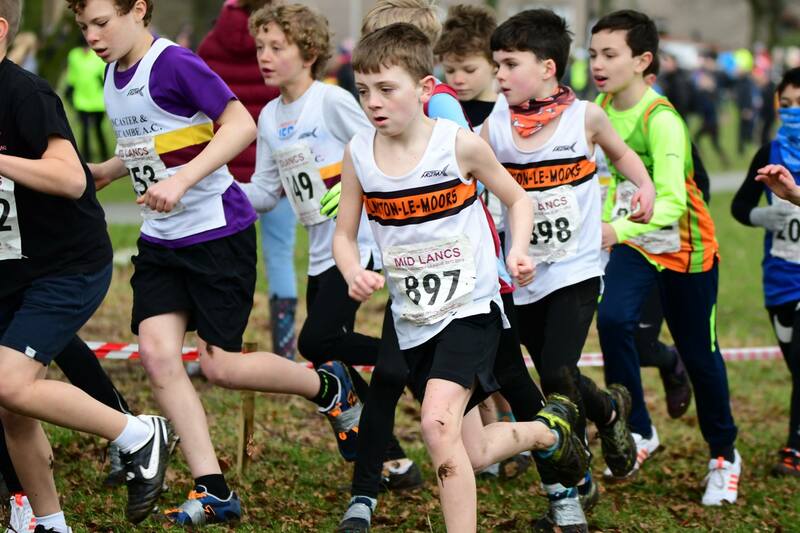 Robbie Smedley, William Nicholls and Matthew Jackson worked well to take 3rd team in the U11 Boys race, and Briony Holt placed 2nd in the U17 Girls race. The leading Clayton runners in Senior Ladies and Mens were Tara Robb (30th) and Tom Brewster (27th) whilst the Senior Men (Tom Brewster, David Bagot, Calum Holmes, David Edmondson, Richard Stevenson and Thomas Walker) took 3rd team and the Vet 40s also secured 3rd team (David Edmondson, Richard Stevenson, Andrew Holt and Michael Toms). 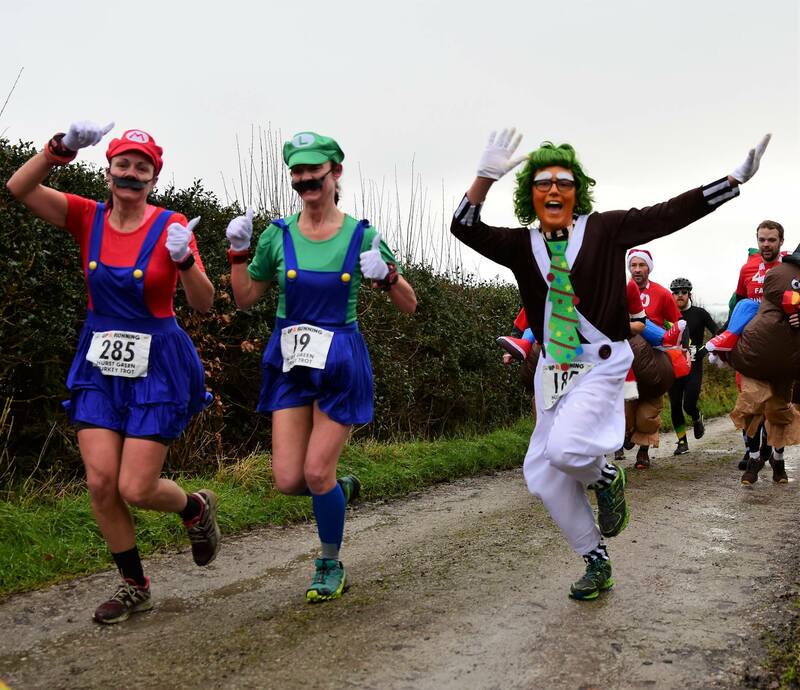 Road racing is a bit thin on the ground this time of year but this traditional New Year fundraiser for the Hospice always attracts a good field including those wanting to test their legs a bit before the season starts properly in the Spring. 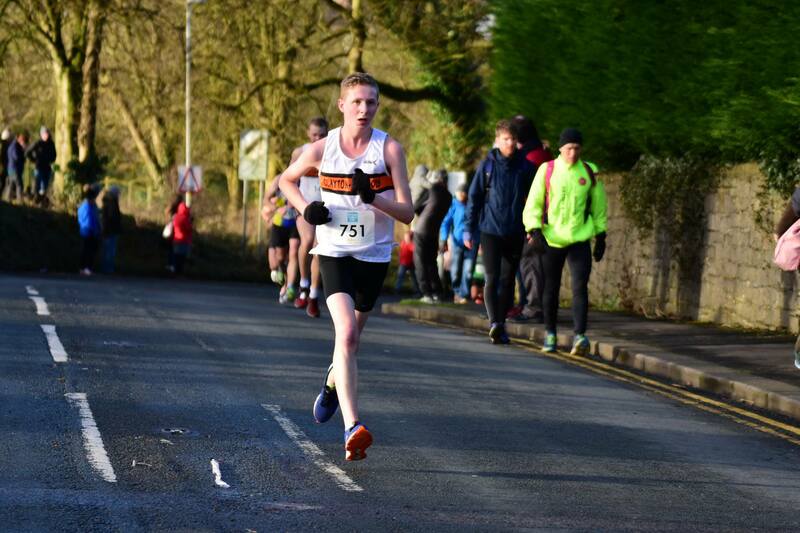 In one of his final appearances for the club before moving on to pastures new, Danny Collinge took a very convincing victory by well over a minute from Matt Nuttall of Blackburn Harriers with a very impressive time of 33:50. 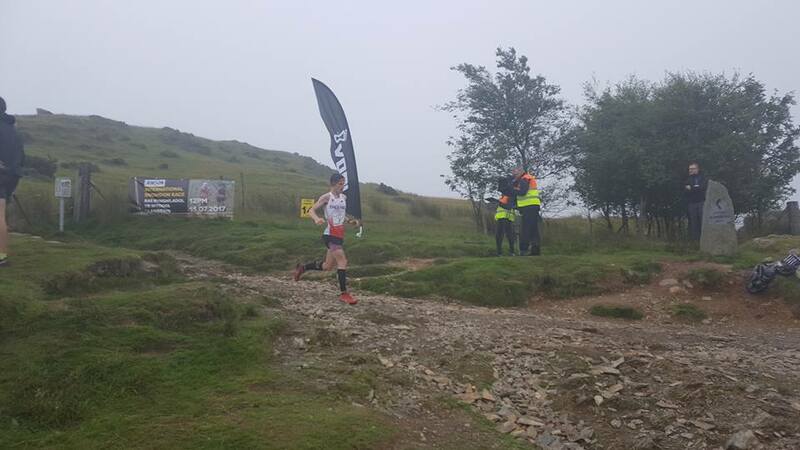 Callum James was next in for Clayton in a great 9th overall and 1st Junior with Nick Hennessey 2nd Junior and 16th overall. 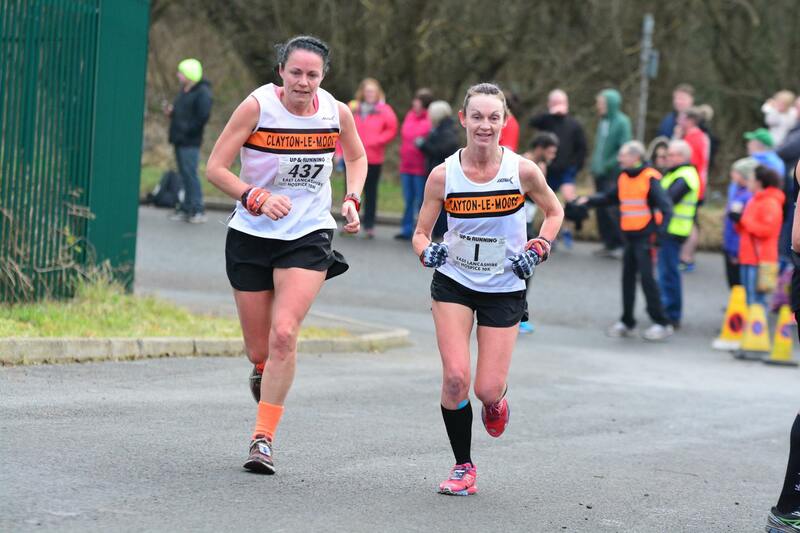 The inseperable duo of Cassandra Smedley and Michelle Abott were 4th and 5th women, and Joanne Motley 8th. 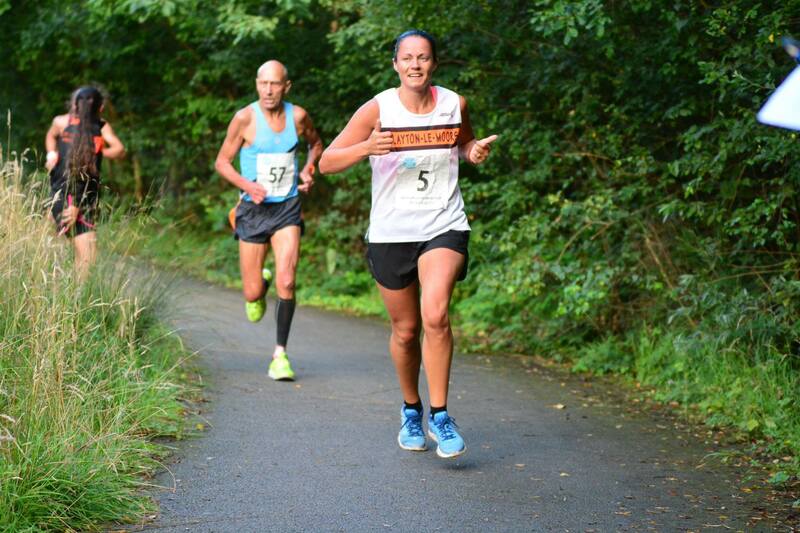 Angela Shian and Vickey Heys were 6th and 7th in the women’s V40 and V45 cats respectively with Charlie Clutterbuck 4th in Mens V70+. 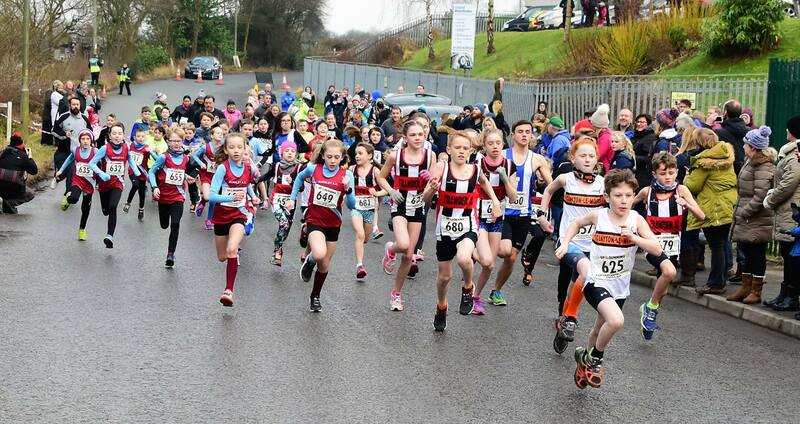 There were plenty of Clayton Juniors in the 2k race held alongside the main race, with Matthew Jackson back on his preferred tarmac surface placing 2nd overall and 1st U13B, chased in by Helana White in 3rd overall and 1st U13G. 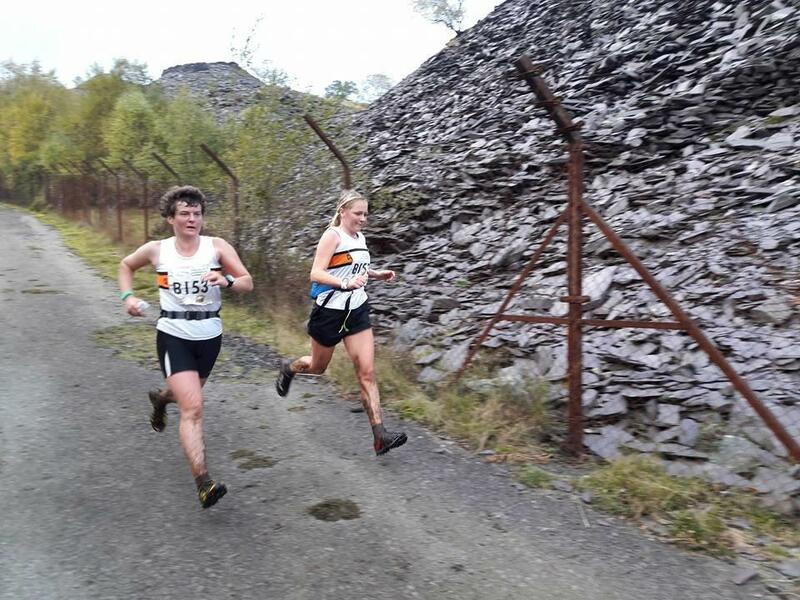 Andrew and Briony Holt risked forever changing the interior of their car (for the worse) at this renowned uber-mudfest, part of the super tough Kendal Winter League where fell races masquerade as cross-country races, the sheep wear Inov8s on the fell and, well you get the drift… they’re quite hard. After promising myself I’d do as many of these races as I can this year life and work have conspired against me making this one-the fourth in the series-my first.Todays race wasn’t particularly promising either- a heavy cold since Thursday and awful conditions when we awoke. Briony was excited to be back on the fells however, and once we passed Settle on the way up the rain eased off.I’ve watched this race but not ran it yet and it’s steep at the start, technical, and with this years extra dose of mud more than challenging along the top of the course.The distance is just over four miles with 250m of ascent, a challenging run. 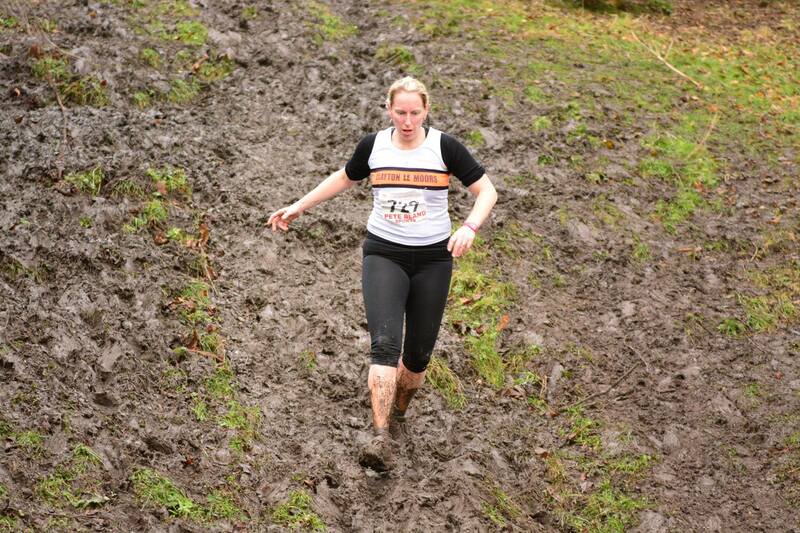 We started and it’s a mad rush to get the 300 or so yards to the single track ascent to the top of the first hill. I misjudged it and found myself scrambling through the gorse next to the path trying to keep momentum up the hill. 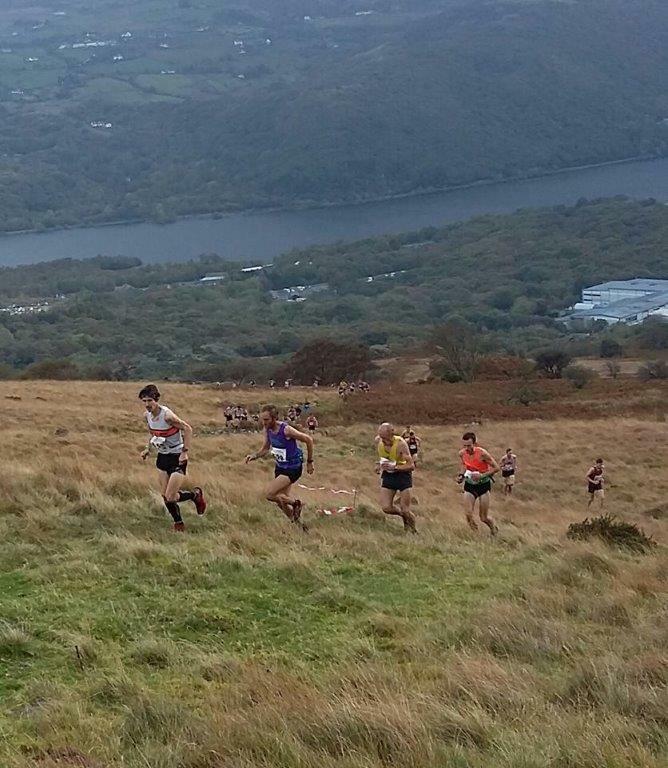 On top the course flattens for a mile or so, and is cross crossed with bogs and tussocks sapping our legs. 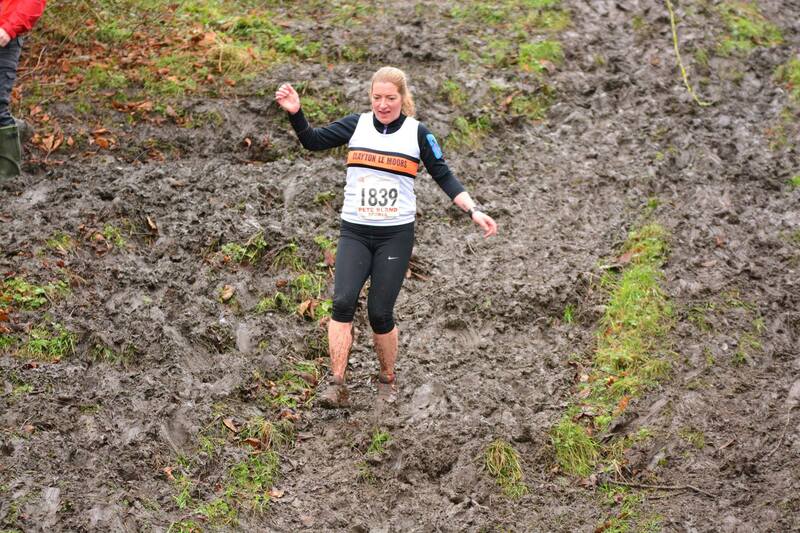 Unlike the recent cross country races I was faster than the people around me on the flat-hard ground and anything technical or boggy I would fall back a couple of places. We ran around the top of the valley into the strong wind to the summit of the next peak adjacent to where we start. 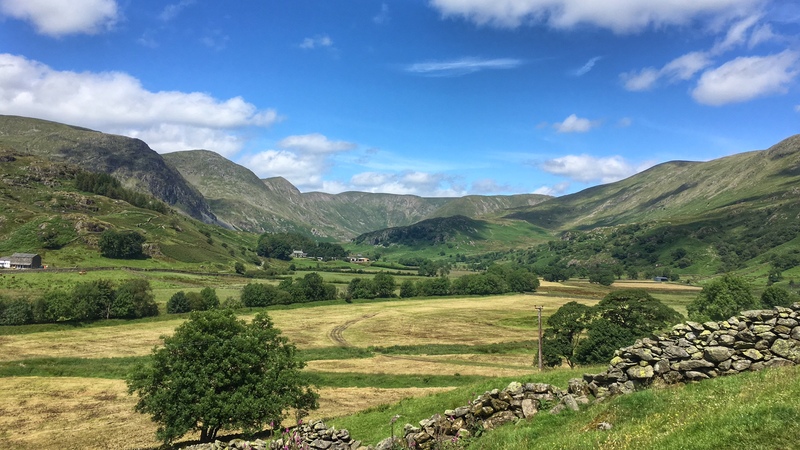 I counted twenty or so people in front of me, and I was neither gaining nor being overtaken so in kind of a run-come-bog trot traversed around the head of the valley to the descent. 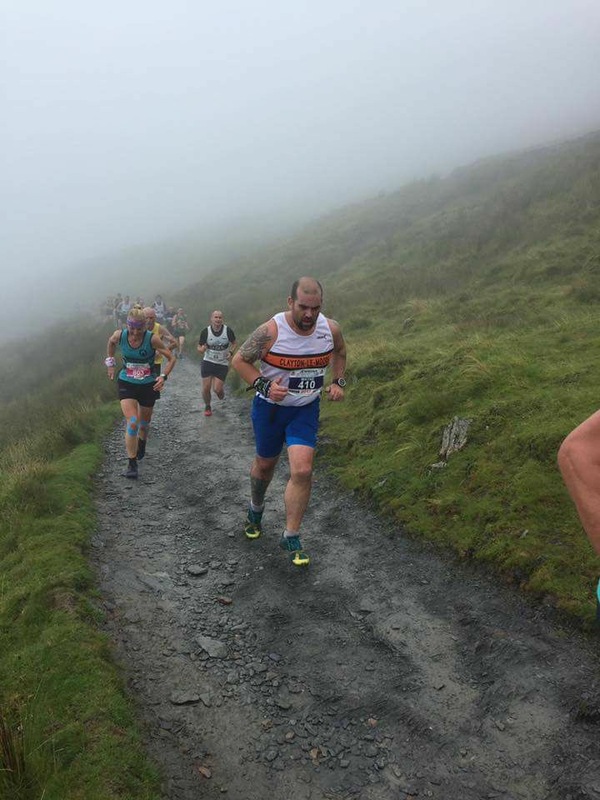 I managed to drag maybe three people in on the final hill prior to dropping onto the finish, but was reminded again these are fell runners as they came past me downhill like I was stood still! 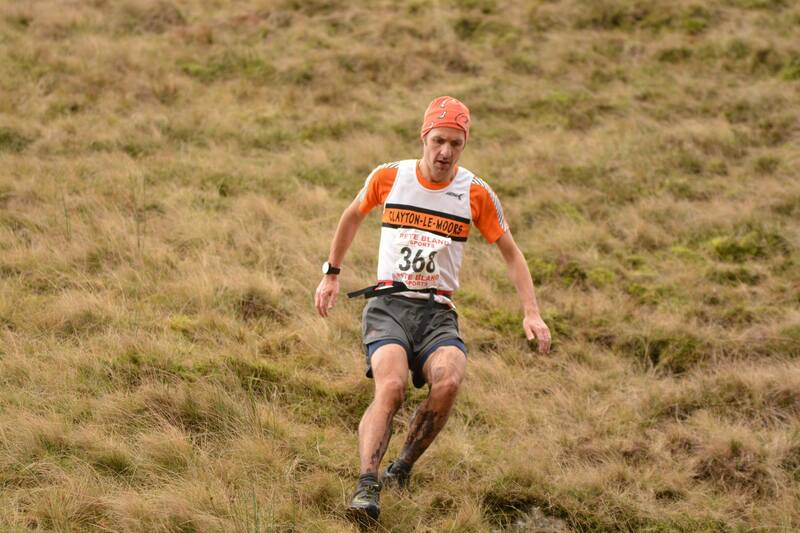 I finished 20th overall, v happy and looking forward to the Fell season starting proper. 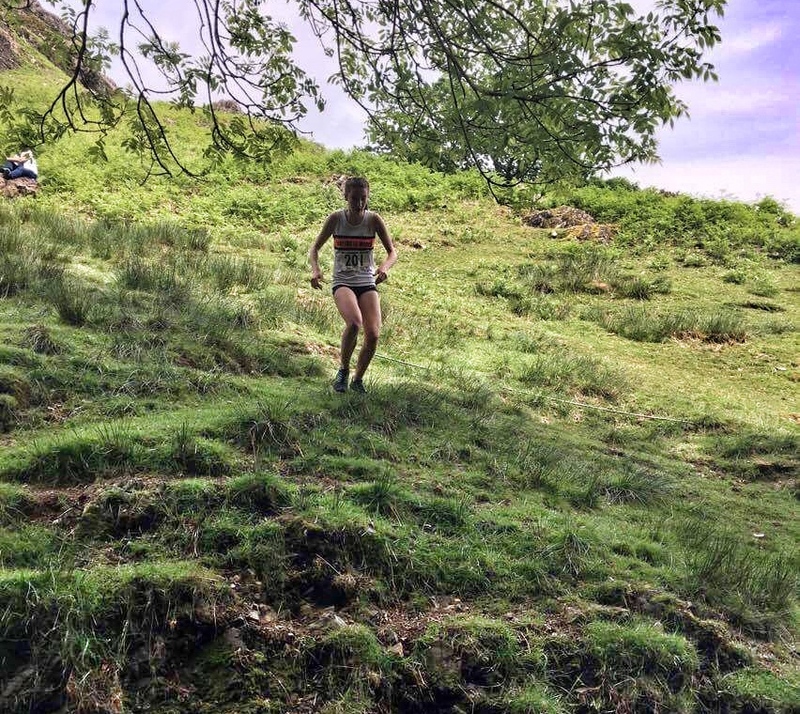 Briony came 2nd in her first fell race this year, and despite dragging herself up the first hill with a combination of eyeballs and willpower finished with her usual smile enjoyed it immensely. 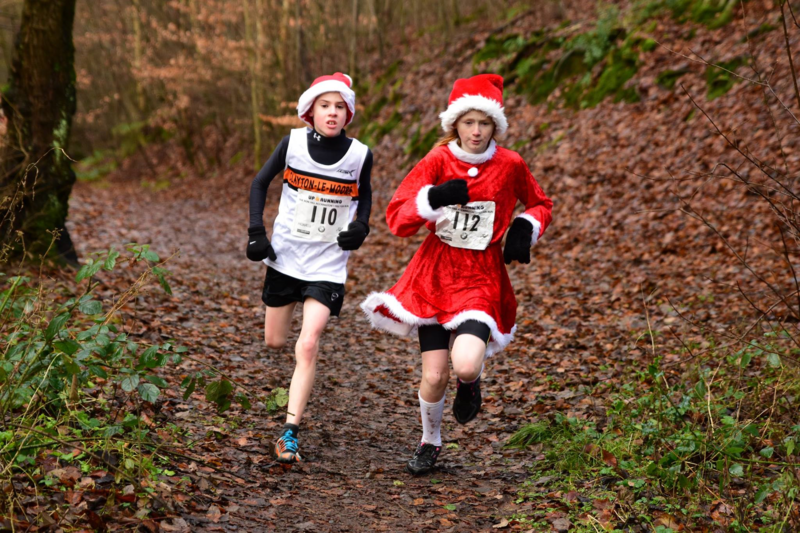 Into December and on toward Christmas and the New Year, the cross-country season rolls on with guest appearances from the fell and road runners around the festive break. 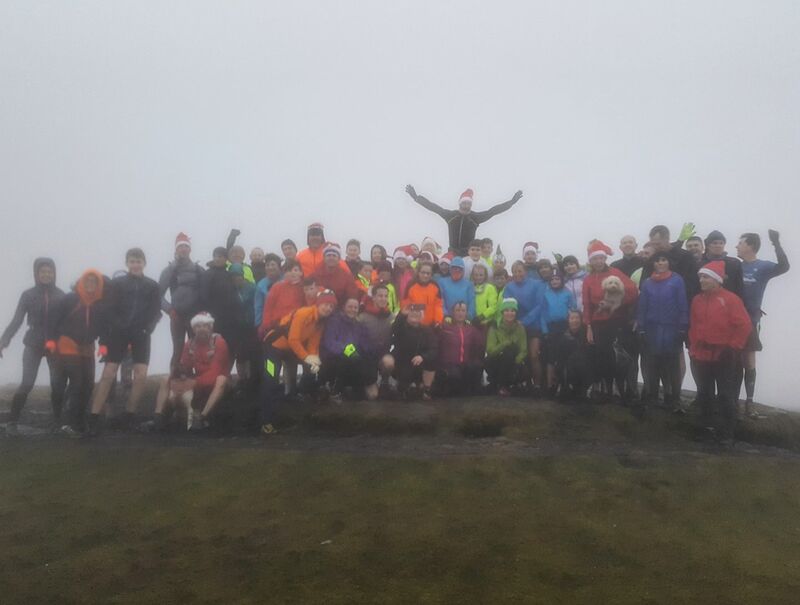 To round off the year, there have been Junior wins, Senior wins, some dodgy fancy dress and a mass takeover of Pendle Hill. Grab a brew and the last of those mince pies and review the final month of the year, hopefully emerging inspired to take on 2018 in similar style. It was a cold and overcast morning as 3 Clayton teams made their way to Stubbylee Park near Bacup. As we parked up, it was obvious it was going to be snowy, frosty and boggy if you ‘stepped or fell’ into the wrong place! We had 2 ladies teams who braved the conditions and 1 men’s team. 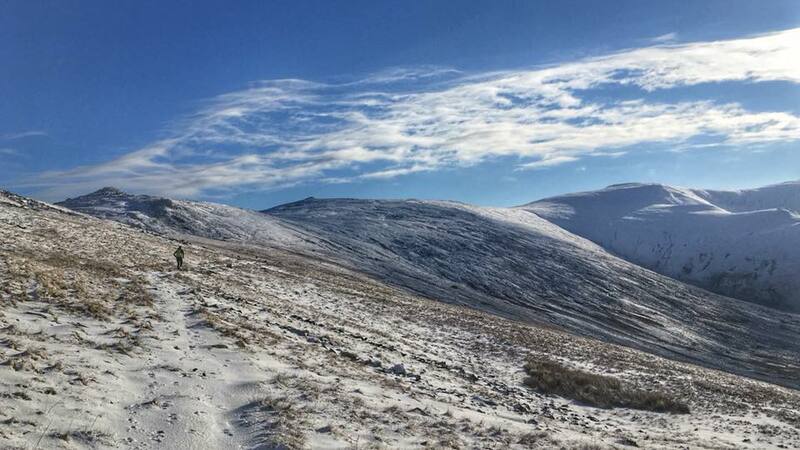 The leg 1 runners had a tough start as they had to forge their route through thick snow, hidden tussocks and freezing cold bogs that many of the runners got stuck in! 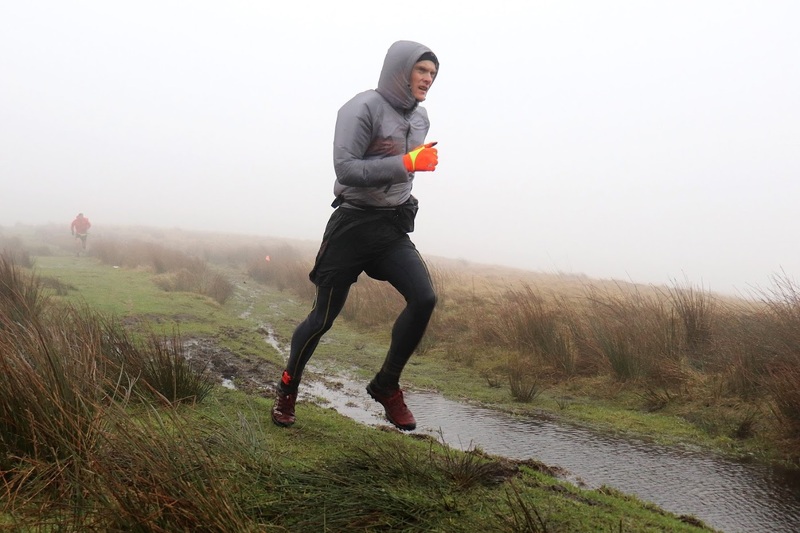 With the odd rain, sleet or snow shower depending what altitude you were running at, creating wintery conditions for the majority of the runners over the 6 mile course. Very tough and definitely character building. The men can 5th overall with a time of 4.00.58, the team consisting of Carl Helliwell, Luke Turner, Russell Clarke and Chris Snell. Well done lads on some tough conditions. 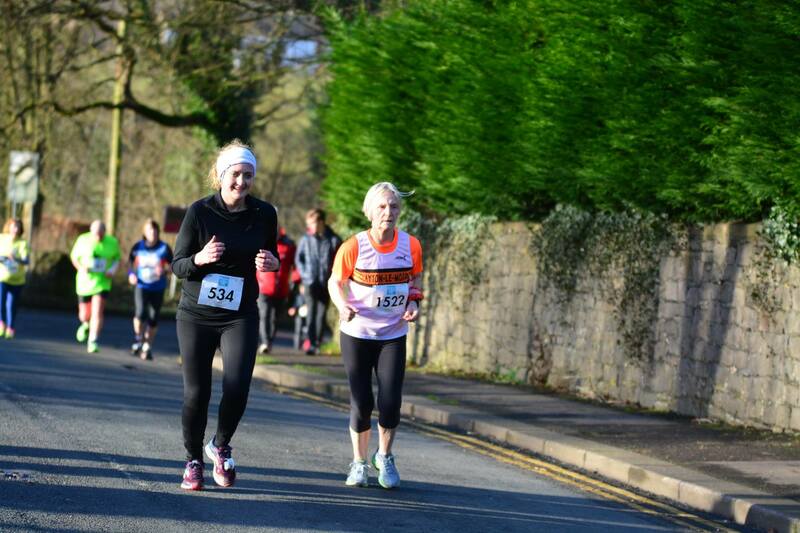 Both ladies teams put in sterling efforts, with some of the ladies doing the event for the first time. 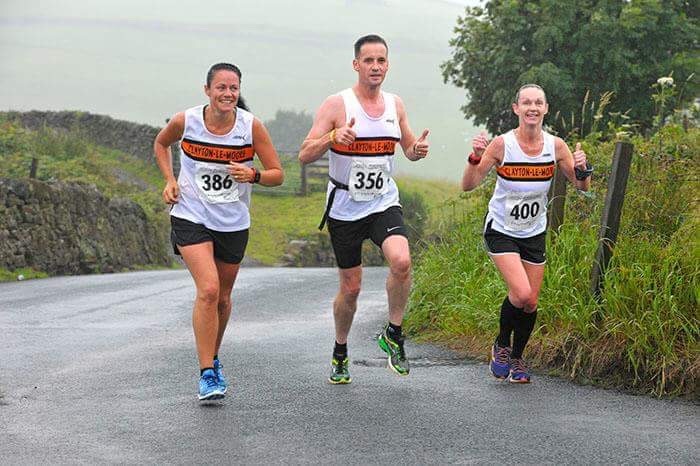 The A team included Tara Robb, Rhiannon Wickham, Alison Dugdale and Jean Brown, with all of them having good runs and coming home as 3rd ladies team with a time of 4:50:37. 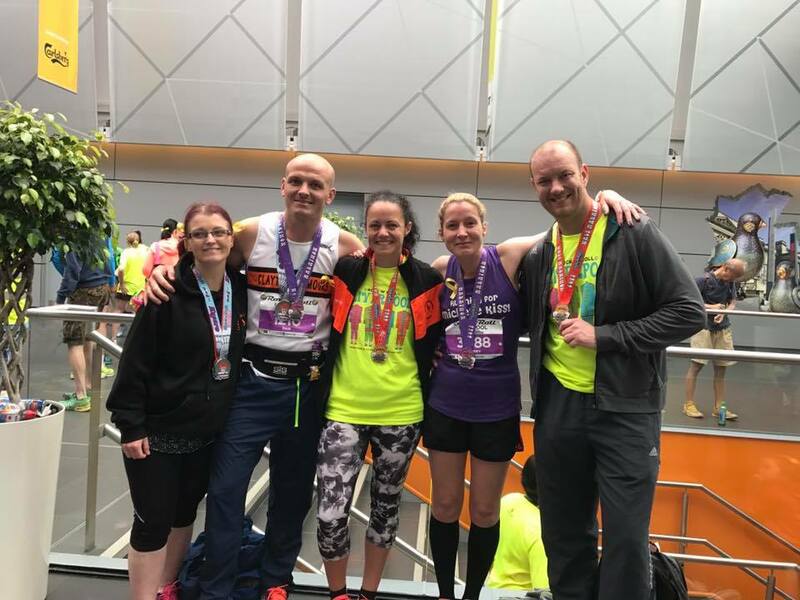 The B team was a vet 40 team consisting of Angela Shian, Julia Rushton, Teresa De Curtis and Katy Thompson with a time of 6:00:11. 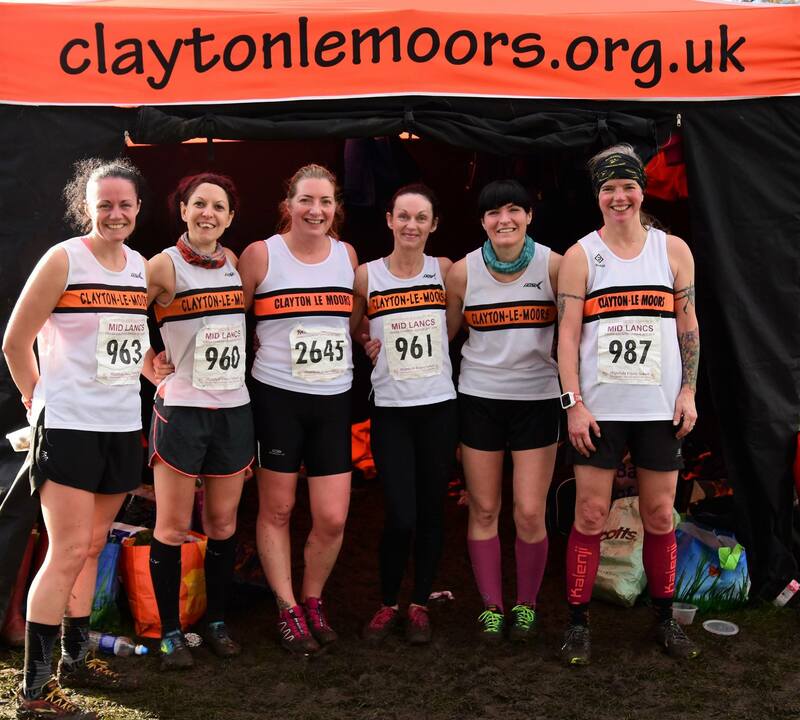 A massive well done to all who ran and represented Team Clayton on a very demanding day. Marl Pits. Like Marmite. Some love it, some hate it. Either way there will be always be weapons grade mud at the final Red Rose League fixture and this year didn’t disappoint. Highlight of the day was Ella Dorrington’s win in the U13G. 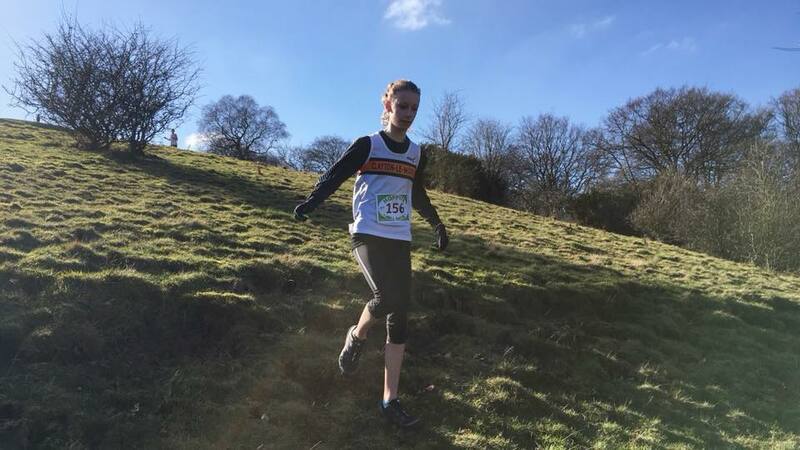 Using her fell running strength on the hilly and muddy course, she tracked the 3 early leaders, put in the quickest final muddy descent of all of them and outsprinted the final two on the line. Helana White was close behind in 10th. Robbie Smedley had his usual battle royal with former teammate Dexta Thompson and secured 2nd on the day with teammates Will Nicholls and Finley Stubbs securing 2nd team prize also. 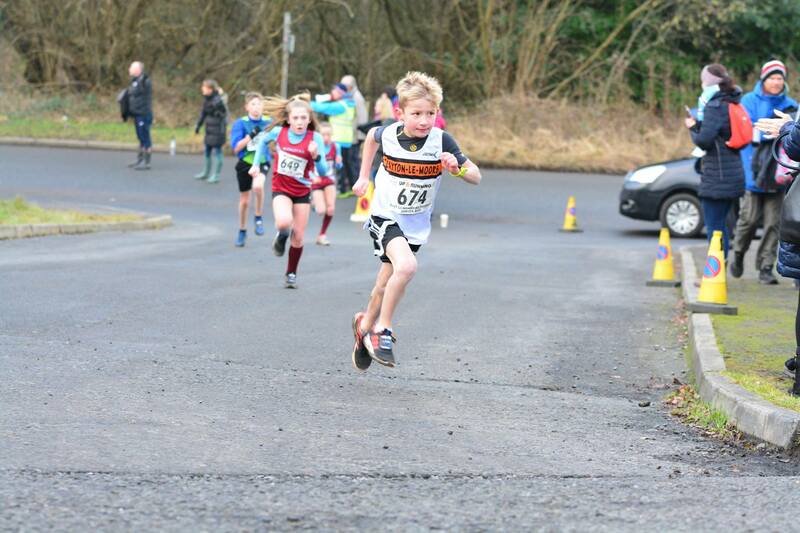 In the U11s Charlie Barnes led the boys home in 27th and Amelia Halstead was 11th in the girls race. 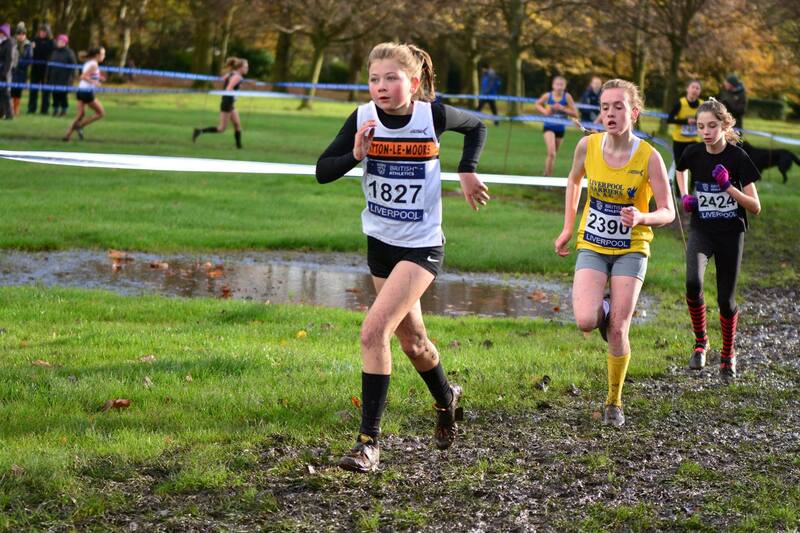 Harrison Codd was first Clayton U15B in 12th and Millie Stubbs led our U15G girls home in 6th. 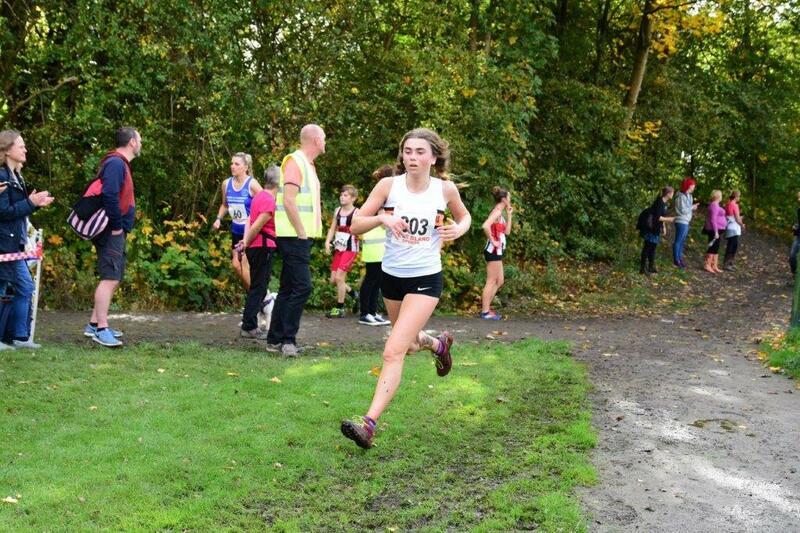 Special mention to Sophie Ashworth who fell and tore ligaments in her ankle – we wish her a speedy recovery. 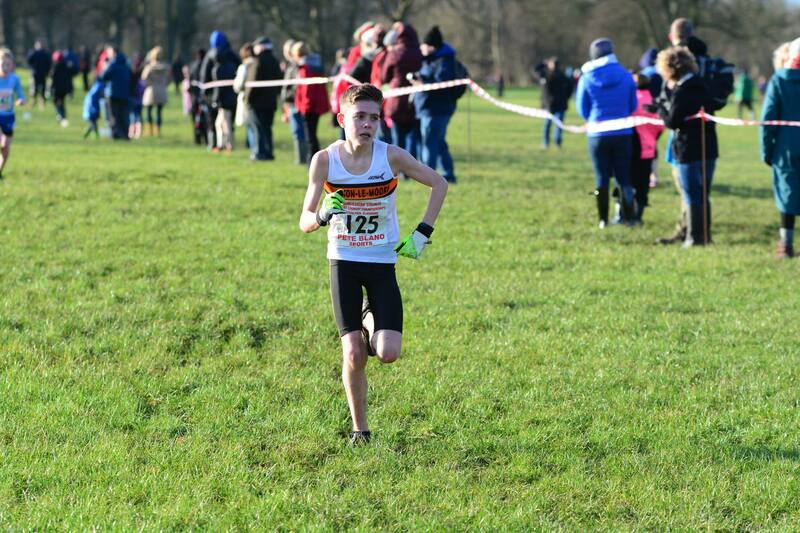 The U17B were led home by Josh Hall in 7th with Briony Holt our only U17G in 3rd place. 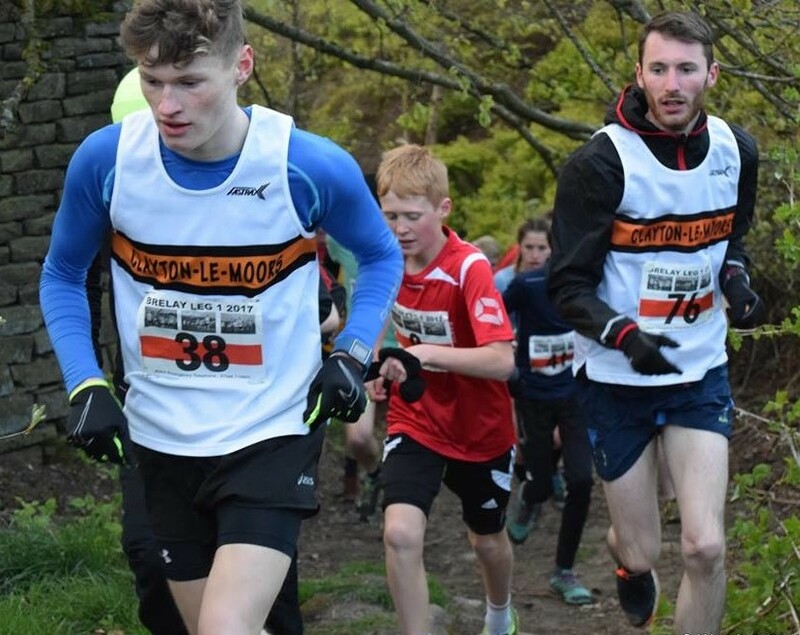 Danny Collinge beat the Bog of Doom in the woods to secure a classy win in the Senior race, and backed up by Dave Motley, Tom Brewster, Peter Coates, Matthew Duckworth and Carl Helliwell took 2nd place in the Team race. 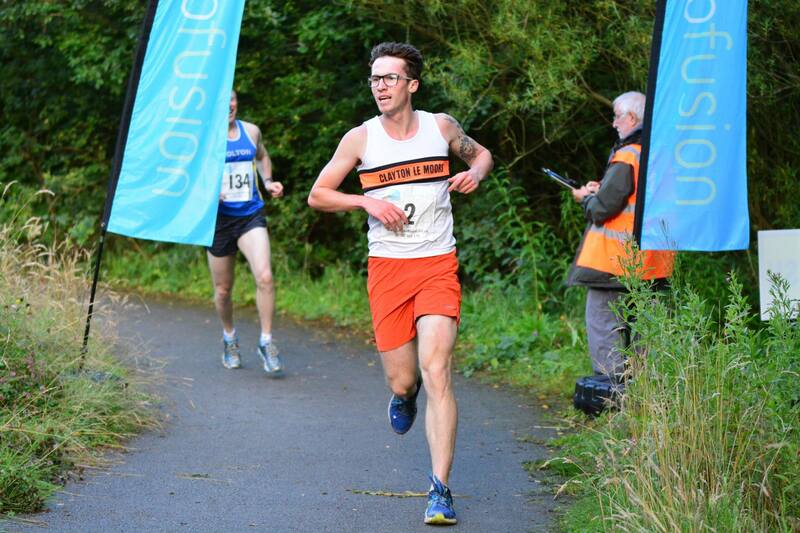 Our Vet Men performed well too, also taking 2nd Team with Peter Coates, Carl Helliwell, Andrew Holt and Andrew Orr. In the Ladies, Cassie Darling was 26th (15th Vet too) and with Michelle Abbott and Irene Roche the Vet Women took 6th place in the Team race. 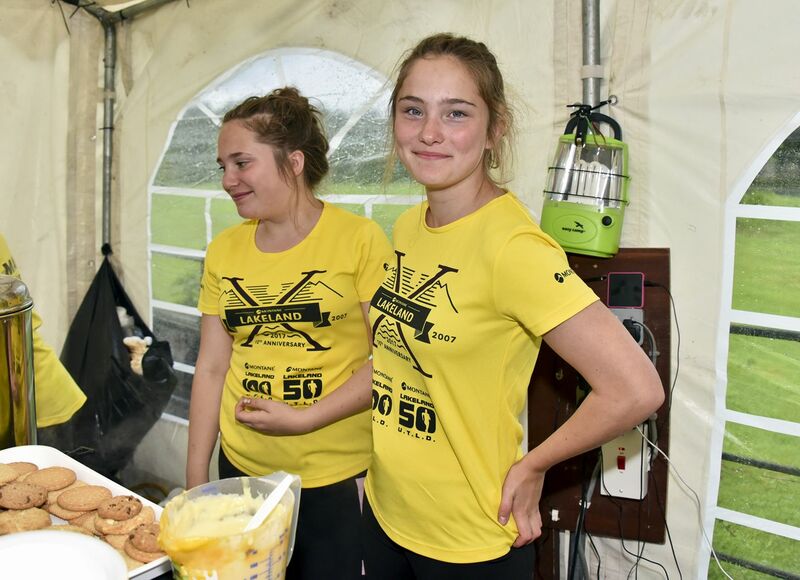 “Having watched my kids run there, and listening to the more experienced runners at CLEM I knew that the annual Marl Pits mud fest would be to my liking, it was just a case of waiting for my shifts to line up at work. 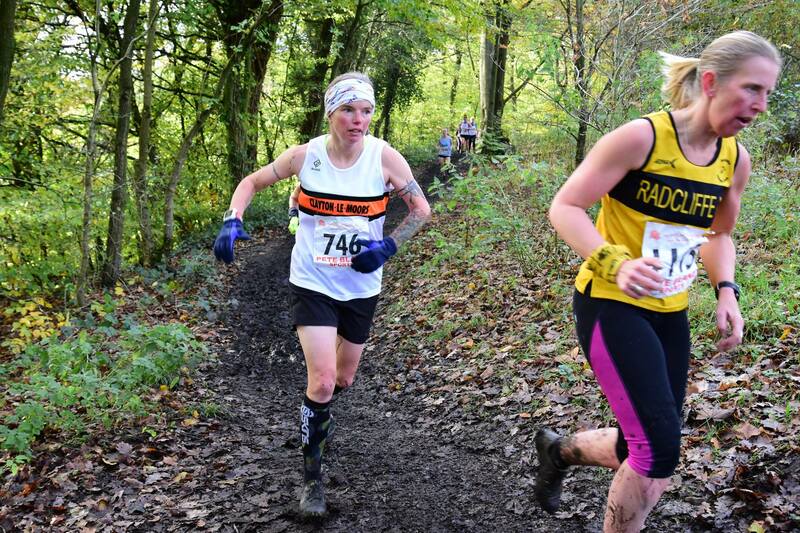 Following a reasonable night shift on Friday, and with four XC events in my legs already this year I felt I’d be able to do myself justice running it. 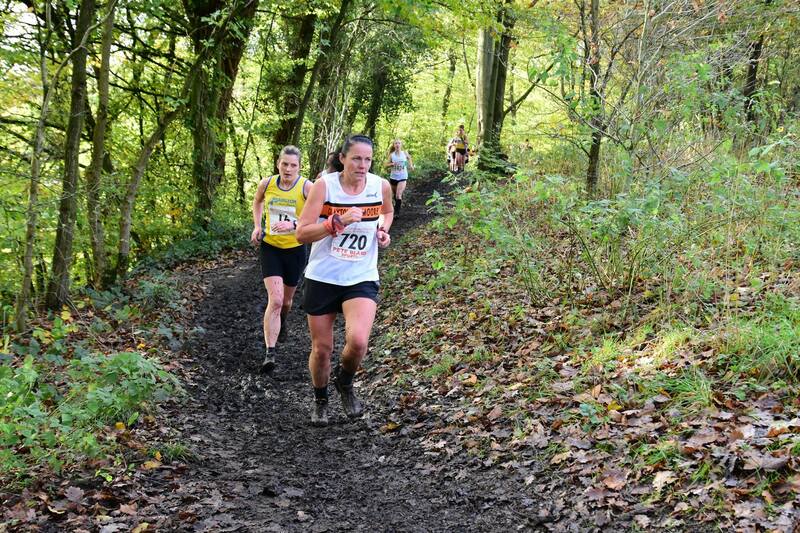 It felt warmer than before, but was still boggy and the course was cutting up nicely following the earlier kids runs. I’d half an hour when I arrived, so the choice was either a recce of the course, or a 50p coffee as mine was cooling nicely on the kitchen table where I’d left it. The coffee won! 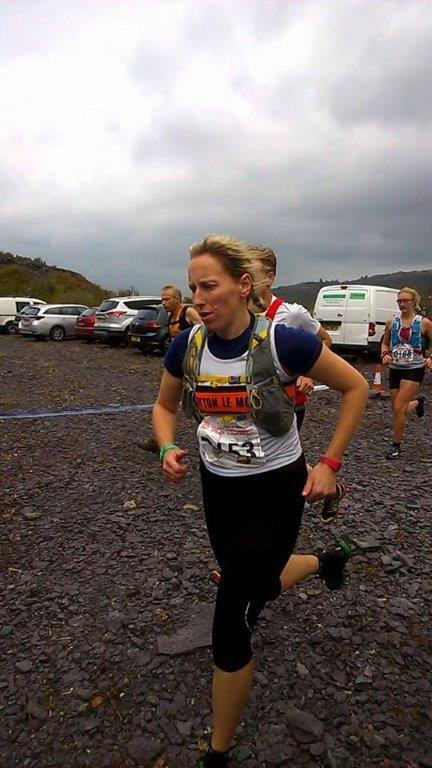 A quick warm up, pep talk from Briony (grind the hill, walk the bog and ur gonna love it!!) and we were under starters orders. For the first time this season I felt the field pull away from me on the opening lap. I wasn’t concerned as I hadn’t ran this week and didn’t want to blow up later, but was the lack of sleep/training gonna take its toll? 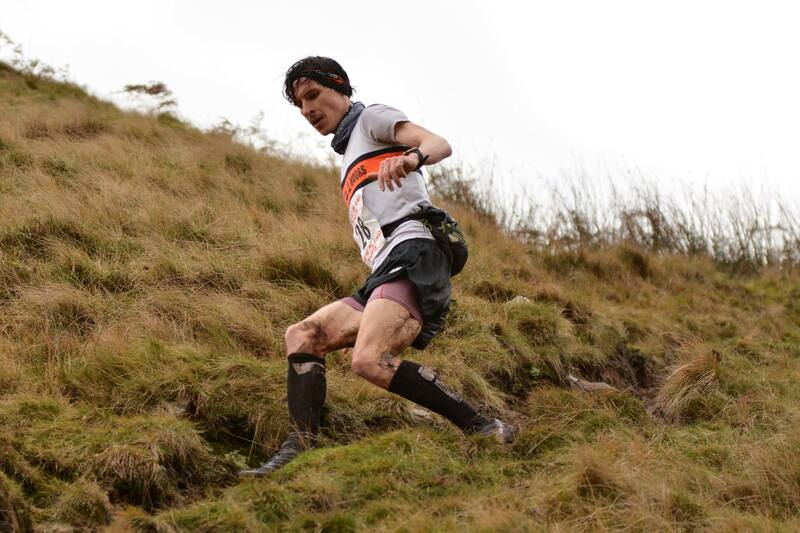 The first lap was manic, lots of slipping and sliding, up until the bog where the gaps started appearing and we settled into our running. I was able to hold the runners around me on the ascents, and gain ground on the downhills and through the numerous hazards. 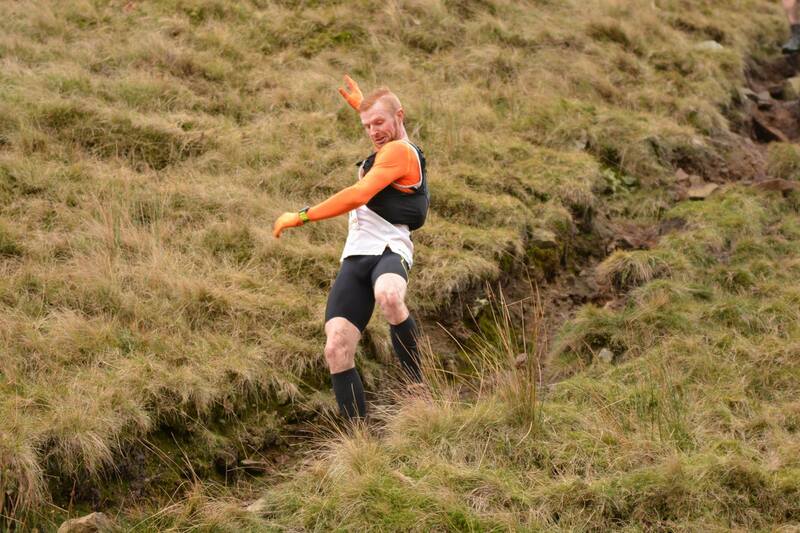 The cheering at the bottom of the hill was excellent, demanding commitment, and I had the misfortune of a couple of pals from the mountain rescue giving me loads next to the wooden bridge, and any thought of resting was scuppered by coach Phil loitering in the field above the hill. 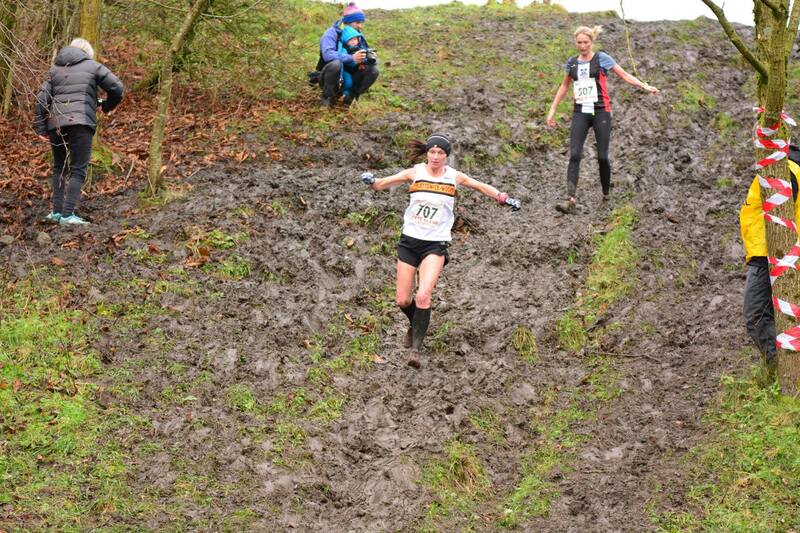 The hills/bridges/bogs took care of themselves, and before I knew it I was on the last lap descending into the finish. 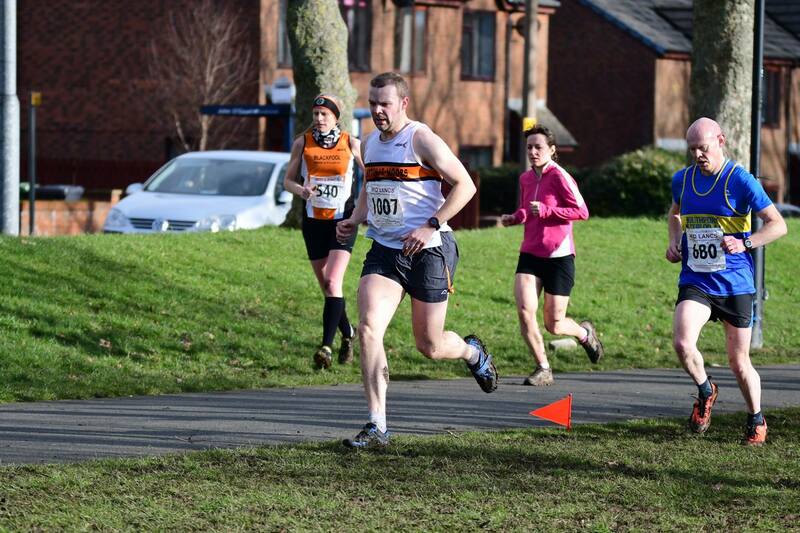 I nearly got mugged on the line by one of the BOFRA runners I know (thanks Sarah for the warning) and ran in for my highest position so far this season. I’m gonna plug my lad Curtis too for finishing this hard hard course despite barely no training and no doubt a hangover. I’m in front of him at the moment but I doubt that’s gonna last very long! The cross-country season returned to Leigh Village for the 2nd time this season, this time for the 3rd Mid Lancs counter. 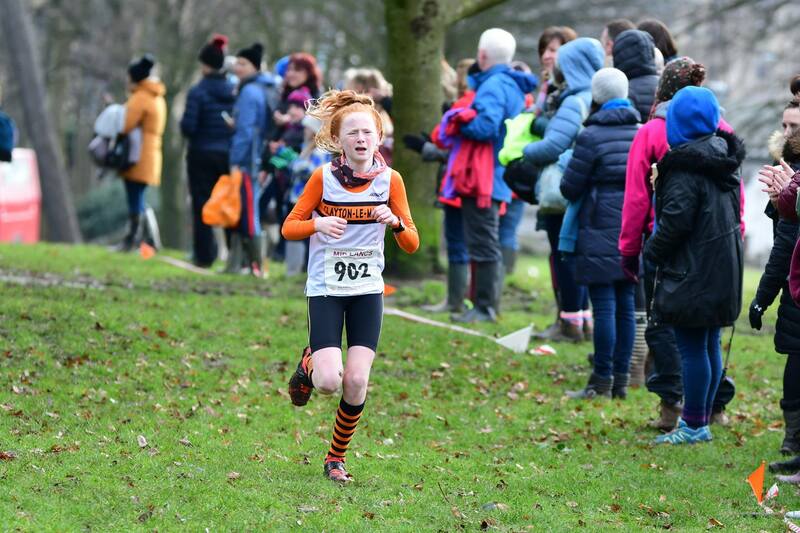 Junior action saw Amelia Halstead have a great run in U11G for 6th, Robbie Smedley 6th in U13B, Helana White 13th in U13G, Michael Stevens 14th in U15B and Briony Holt 2nd in U17G. The U13B team were 2nd with Matthew Jackson and Will Nicholls scoring points. 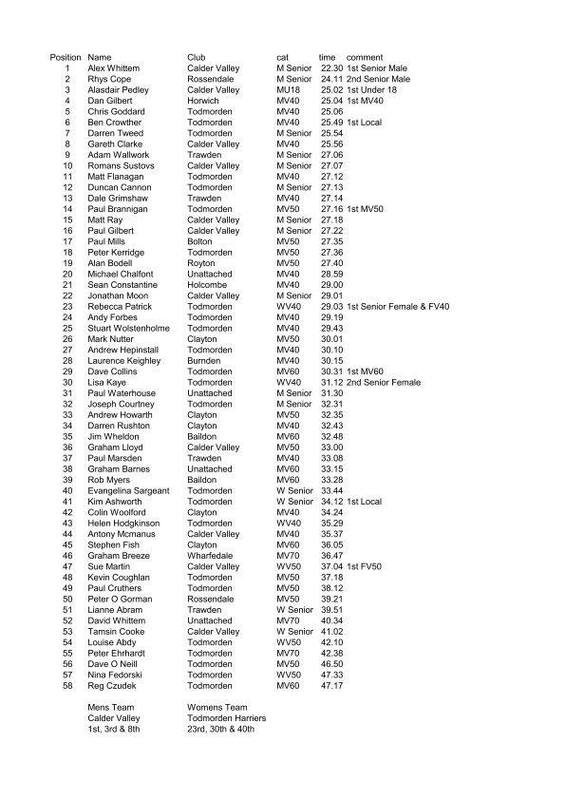 Tara Robb led the Women home in 20th with Tom Brewster 37th in the Senior Men. 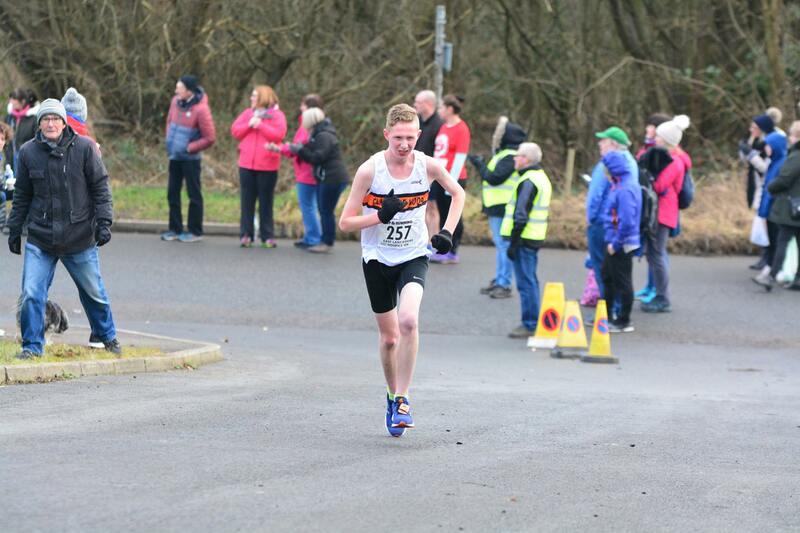 Calum Holmes had a good run for 4th in the U20 Men and Richard Lawson was 3rd in V70 Men. 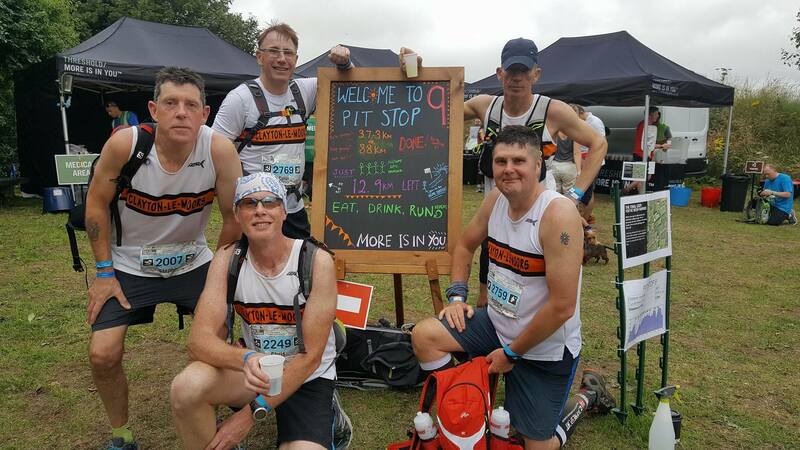 Our Vets teams were 3rd in V40 and 2nd in V50. 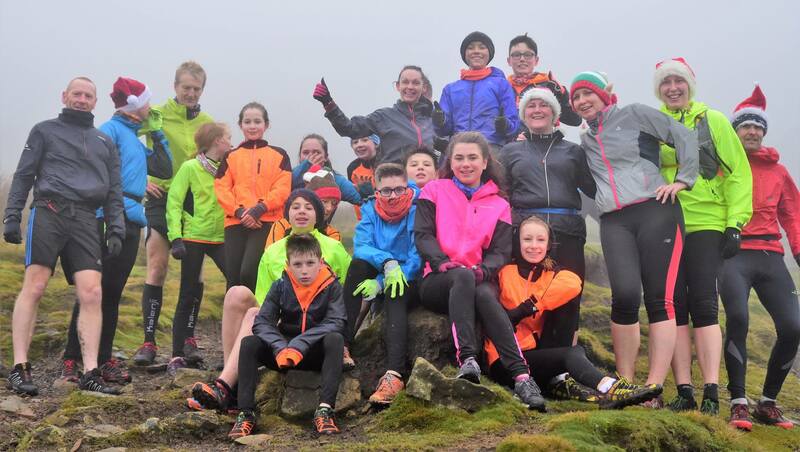 Strong winds and clag on the tops didn’t deter a large group of Juniors and Seniors from trekking up Pendle Hill to temporarily claim the trig platform as their own. 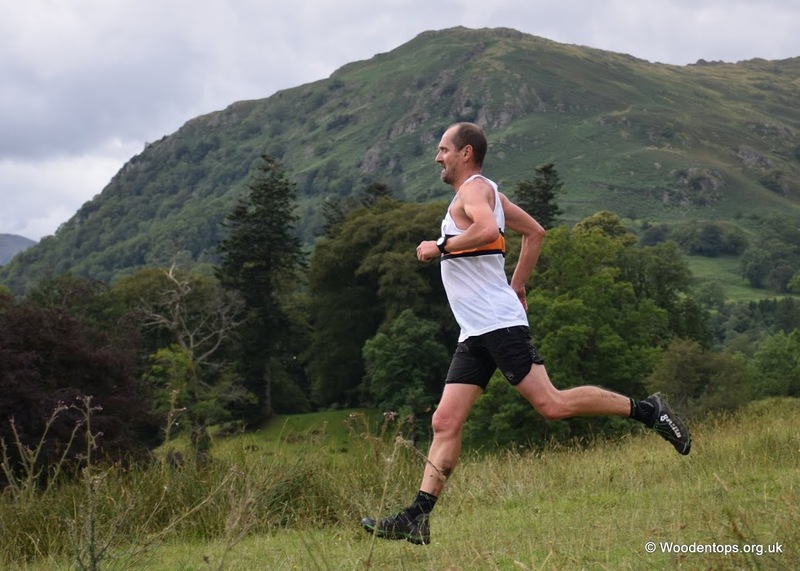 Our own super-photographer David Belshaw also displayed his amazing time-travelling ability to almost be in two places at once with photos from the fell gate and then photos back in the car park as many of the runners returned. 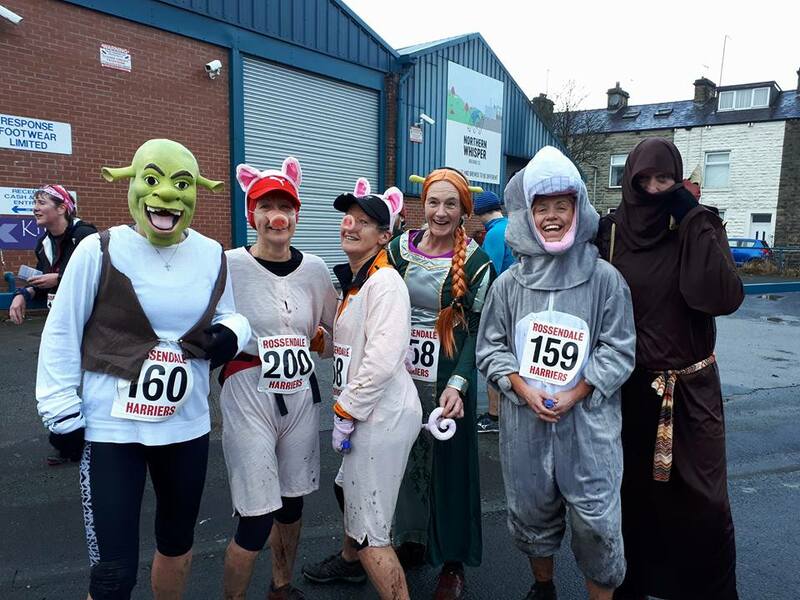 Personally, I think we should get him a vest and get him out racing..
More fancy dress on show here for the fellrunner’s traditional hangover cure on Boxing Day. 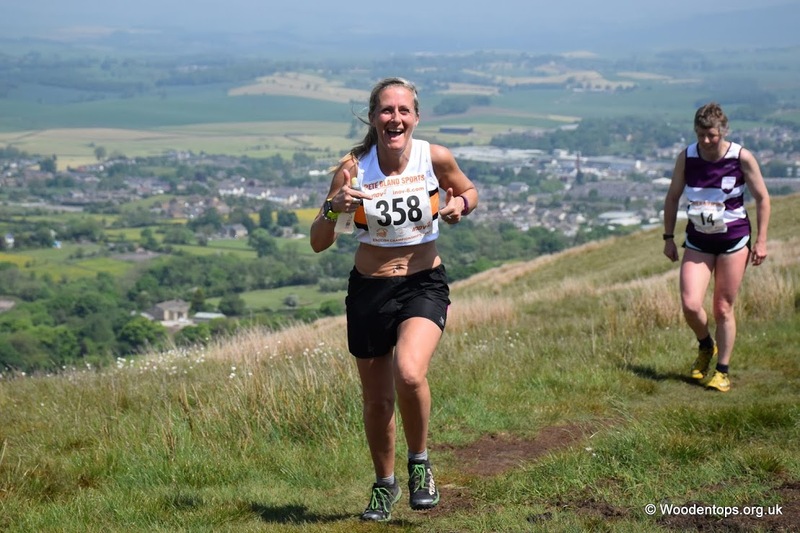 With a race distance of less than 4 miles but with over 750ft of climb, it’s always a bit of a rude awakening for the slightly befuddled, climbing steeply from the start before a correspondingly fast descent back down. Not before passing the trig and collecting a packet of Smarties from Santa though. Bonus points for those that can eat them on the way down without choking. 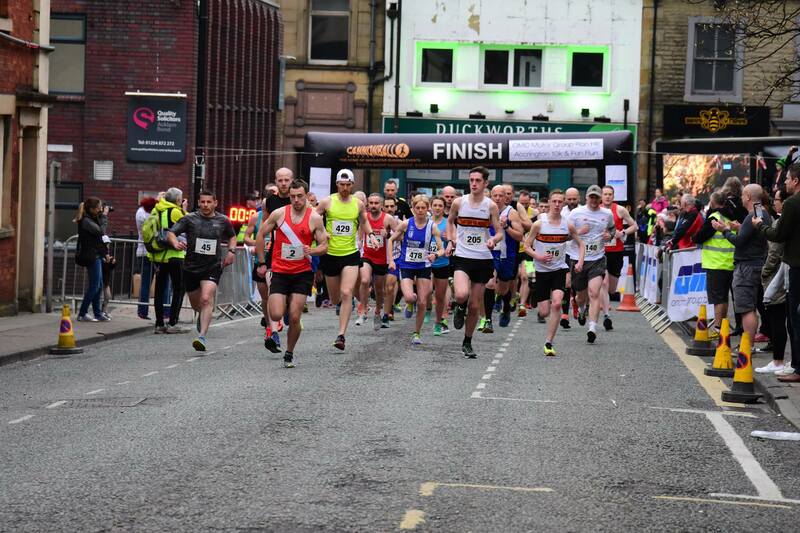 Incorporating the North of England Championships this race always attracts a quality field with Olympians Jonny Brownlee and Laura Weightman amongst the star runners this year. 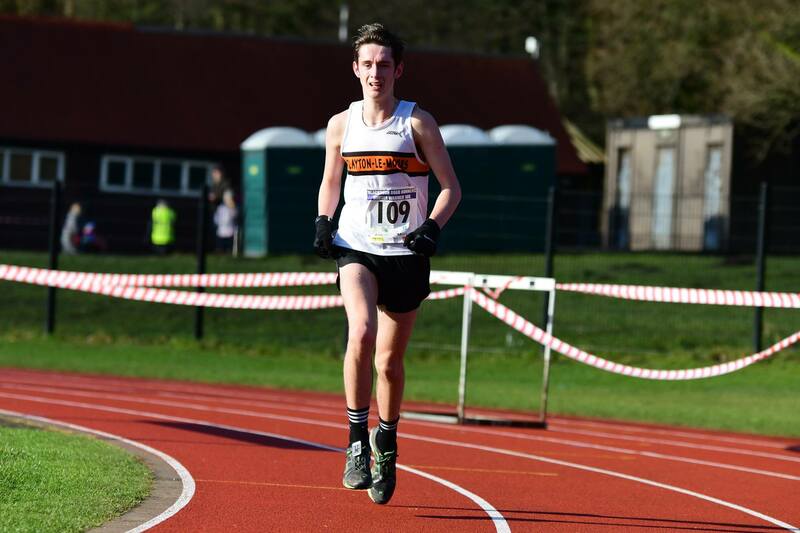 Jacob Watson claimed the honour of fastest Clayton runner in 71st and 35:10, whilst Richard Stevenson was quickest Vet with 37:39. 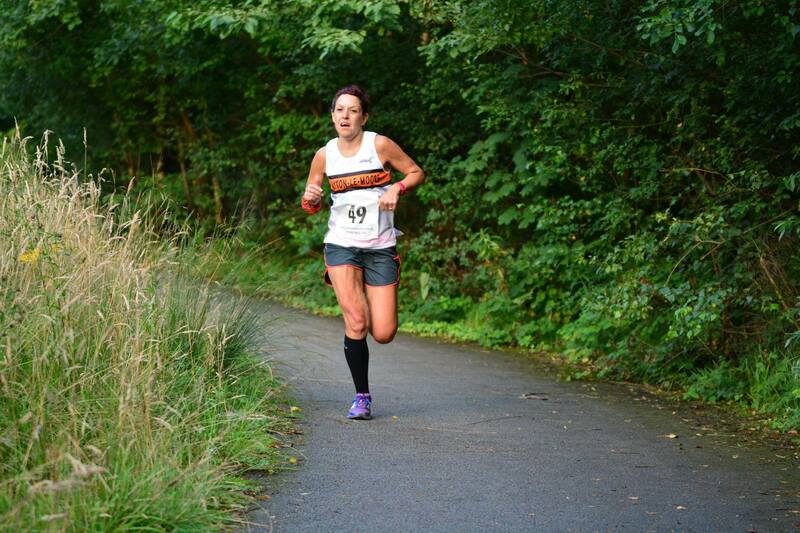 Claire Vincent was quickest Clayton woman in 43:17 and Lisa Johnson our fastest Vet woman in 52:56. 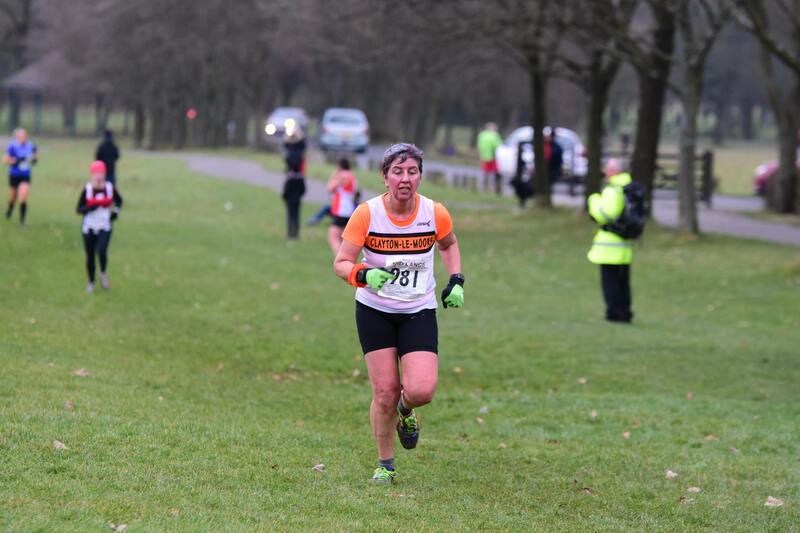 Super Coach Marion Wilkinson won the V75 category overall with a predictive time for the following New Years Day of 01:01:01.